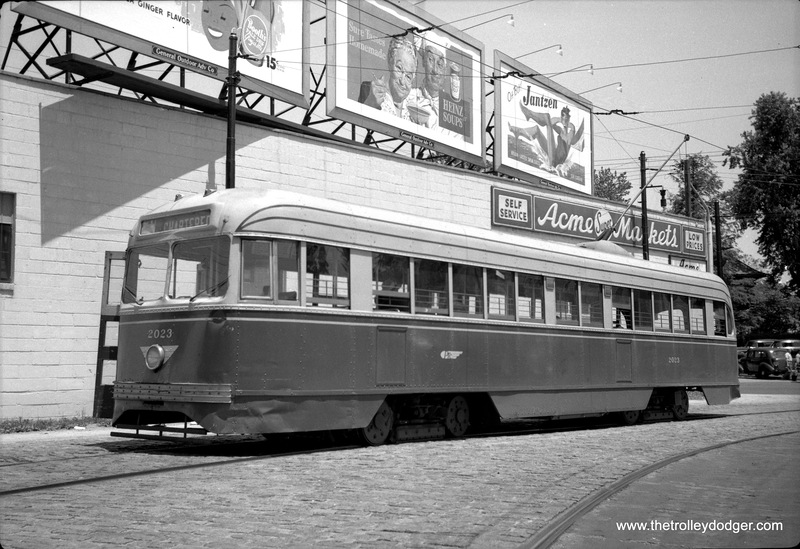 Today, we feature more classic photos of buses, trolleys, and trains, courtesy of Bill Shapotkin, long a friend of this blog. 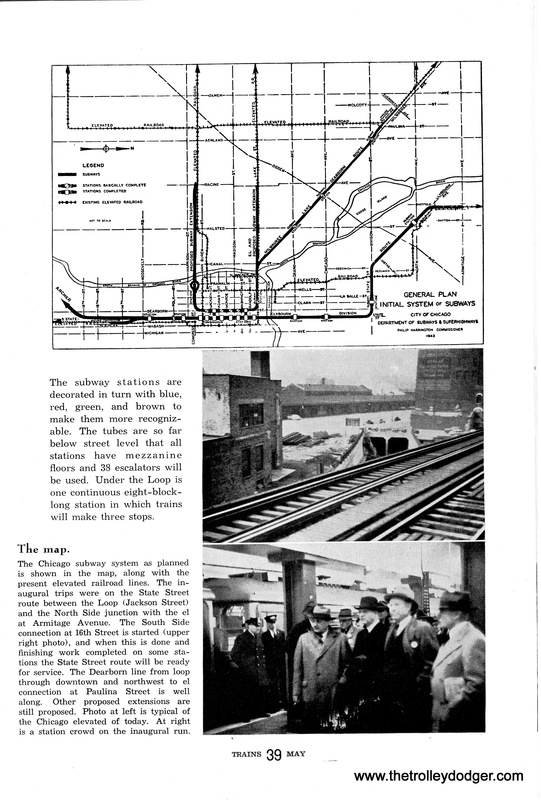 Mr. Shapotkin should be well-known to many of you from his longtime activities as a transit historian, author, and the many informative programs he has given over the years. 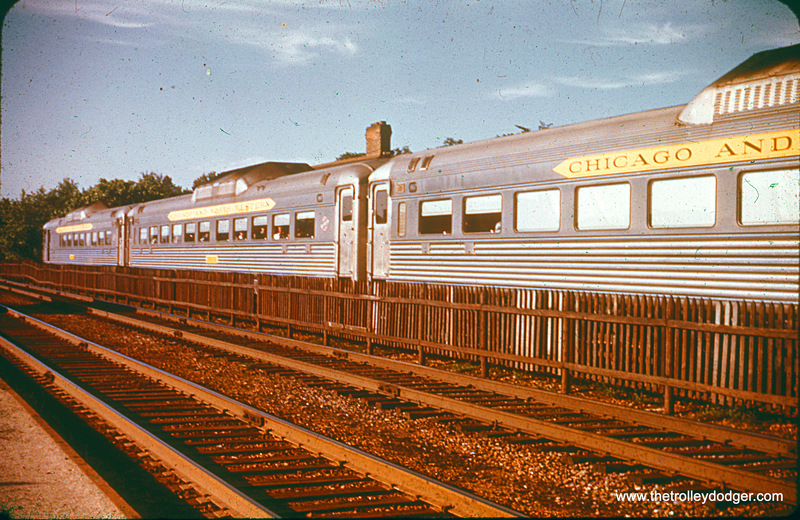 Today’s sampling from the Shapotkin Collection includes some rare pictures of Chicago & North Western RDCs (Budd Rail Diesel Cars), which were self-propelled and ran in Chicago area commuter train service for a short period of time in the 1950s. 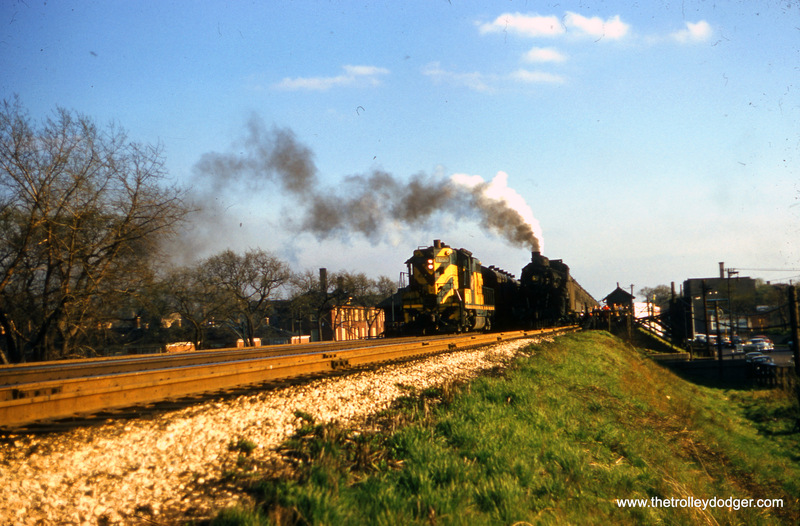 They replaced steam-powered trains and were in turn replaced by the familiar push-pull diesel bi-levels still in use today. 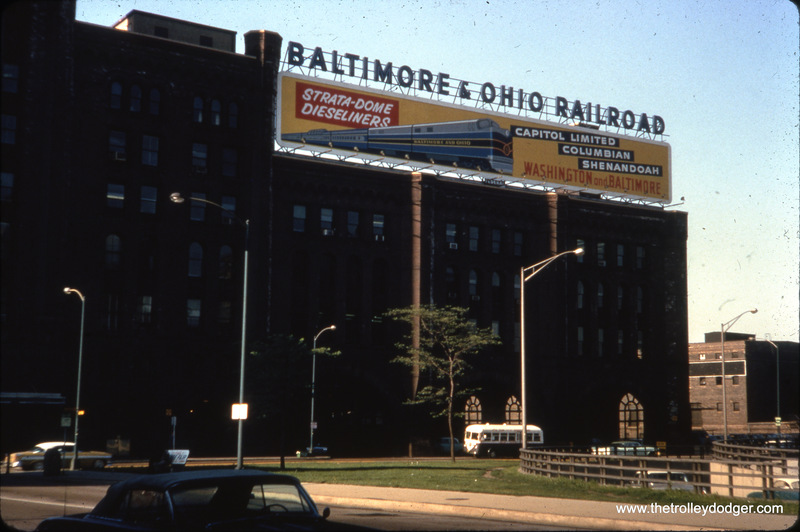 In addition, there are several pictures of Grand Central Station, a Chicago landmark in use between 1890 and 1969, which was torn down in 1971. 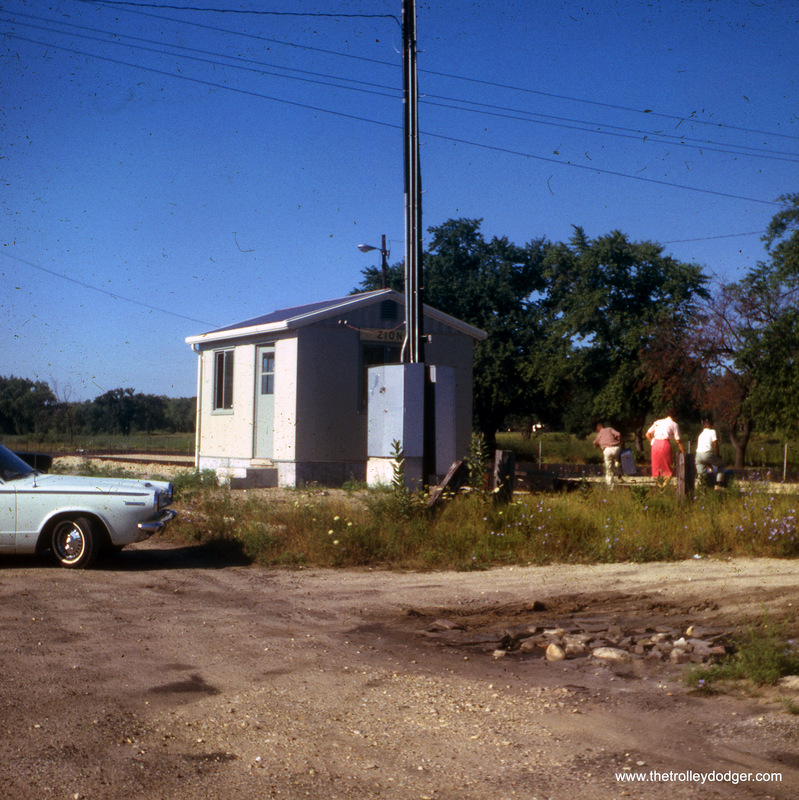 We have some interesting correspondence, plus some new images of our own. It used to be some people thought these sorts of images were only suitable for use as black-and-whites. But with modern technology, it is possible, to some extent, to bring back the original colors. This was easier to do on some than others, but the results look much better than you might expect. If you have ever seen one of these early red Ektachromes, you will know what I mean. 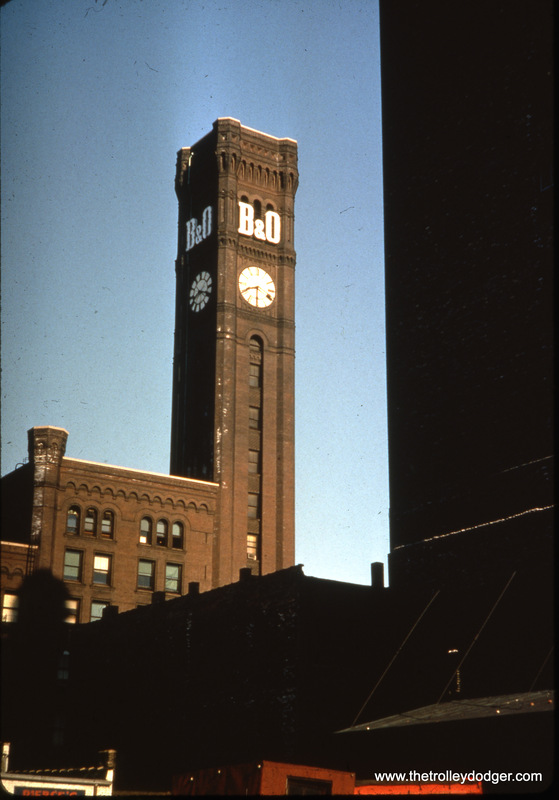 Modern films are much more stable and resistant to dye fading. It is that time of year again — the 35th annual gathering of the Hoosier Traction Meet is being held Fri-Sat, Sept 7-8 in Indianapolis, IN. The meet includes two full days of interesting presentations on a variety of subjects, as well as our “Exhibition Room” of vendors — with everything from transfers to track charts available. Book now and you can join us for just $25.00 ($40.00 at the door). We recommend that once you book hotel accommodations as early as possible, as there is an event scheduled at the Indianapolis Motor Speedway that same weekend. By calling the number of the Waterfront Inn (where our event is being held), by mentioning that you are with the Hoosier Traction Meet, you should be able to register at our group rate. For those of you would are unable to attend both days, we have a special “Saturday Only” rate of just $15.00 ($25.00 at the door). As many of our Friday presentations are repeated on Saturday, you will be able to partake of a wide variety of subjects and presenters. We hope you are able to join us for what many consider to be THE electric railway gathering in the country…see you there! 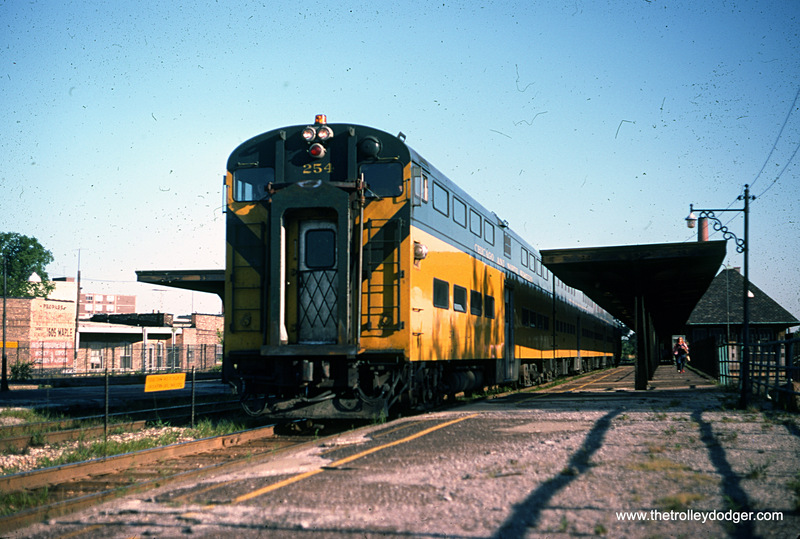 Chicago & Milwaukee Electric 354, built in 1928 by the St. Louis Car Company, is seen at the Illinois Railway Museum in May 1977. 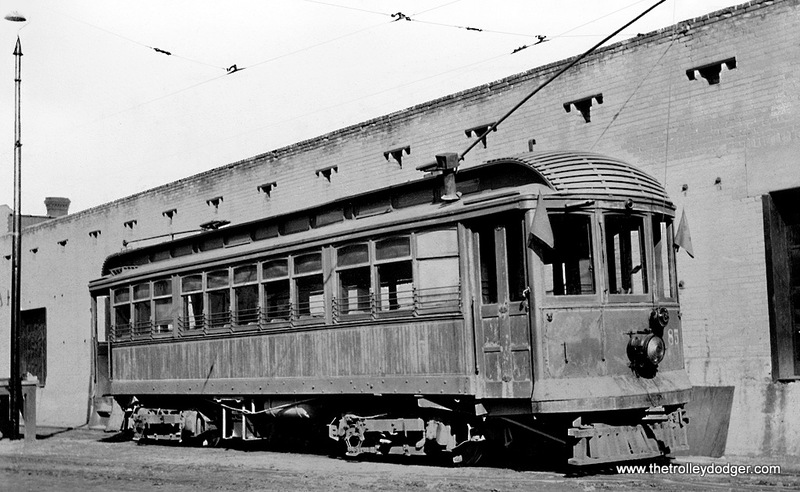 It ran in Milwaukee and Waukegan as a North Shore Line city streetcar. 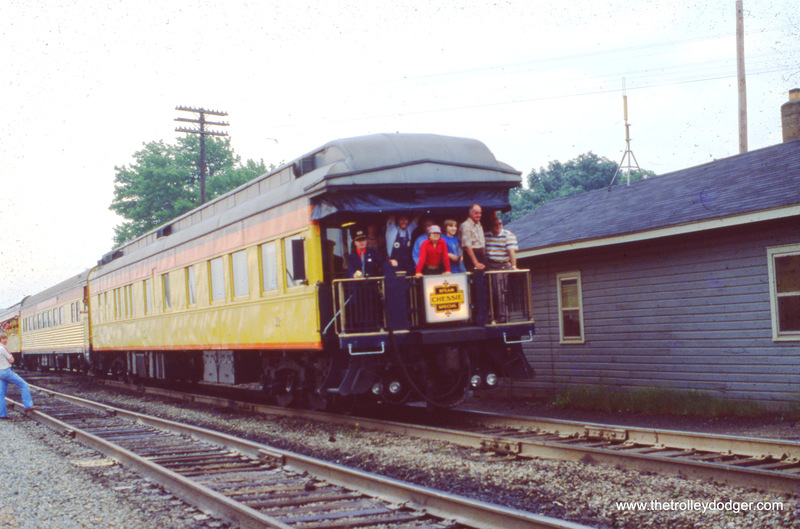 The Chessie Steam Special in Wellsboro, IN on June 17, 1978. 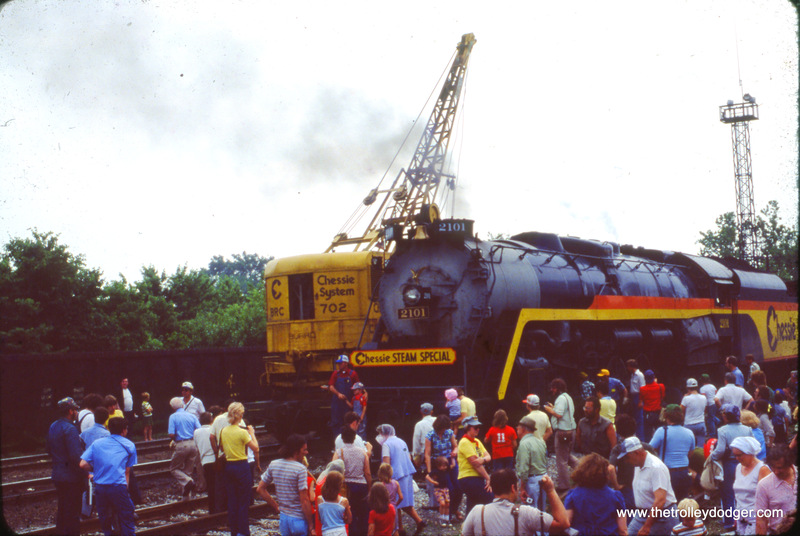 The Chessie Steam Special in Peru, IN on June 17, 1978. 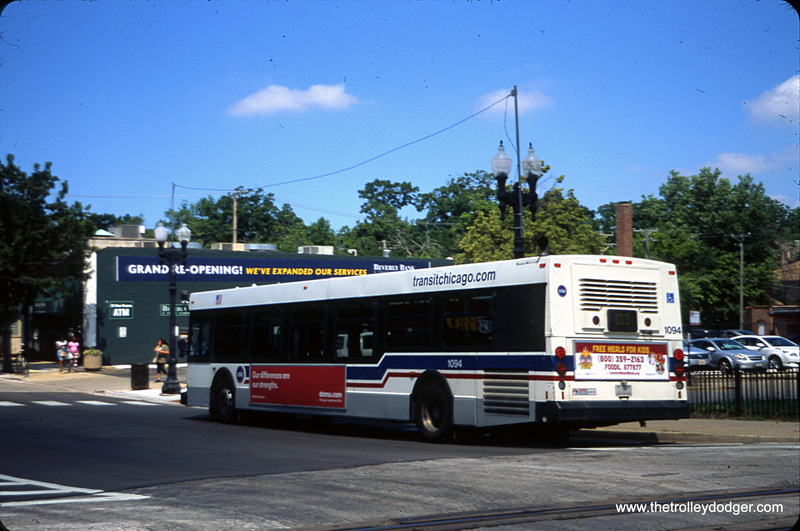 CTA bus 4606 is at the Roosevelt/Monitor Loop in October 1992 (same one used by trackless trolleys a few years earlier). The view looks E-N/E (toward Monitor Avenue). I don’t know much about the GM Fishbowl next to it, however. 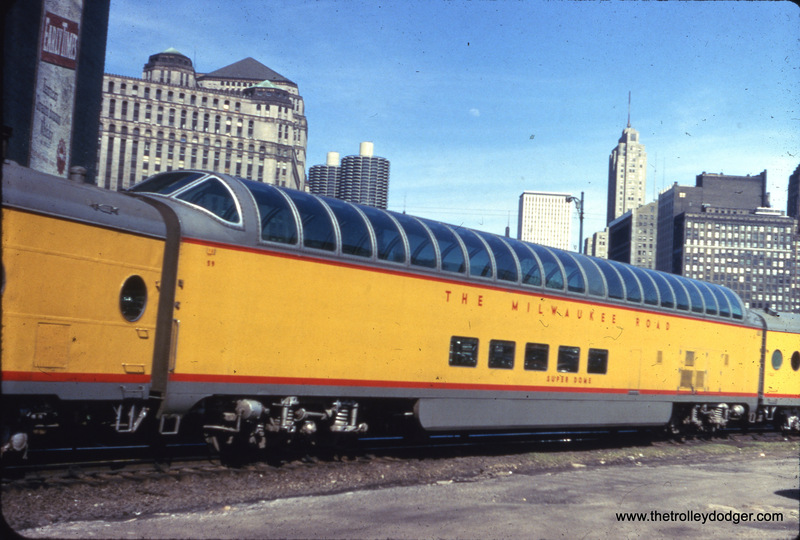 A Milwaukee Road dome car near Union Station in Chicago. 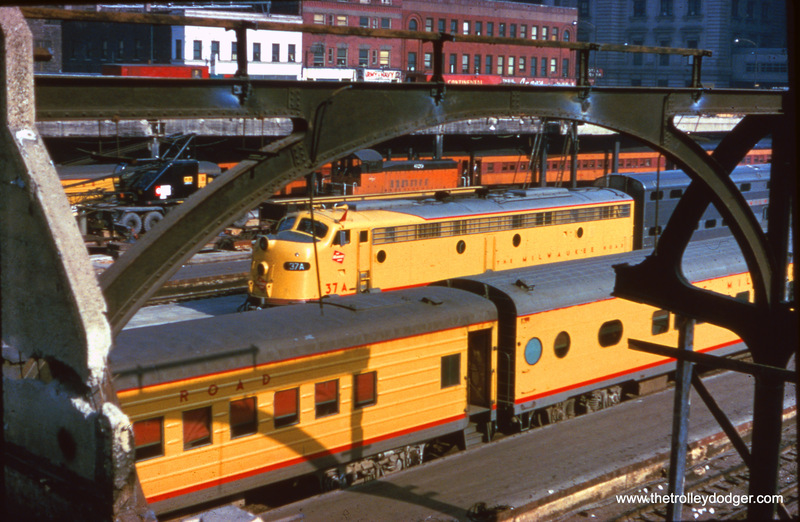 Milwaukee Road equipment in downtown Chicago. 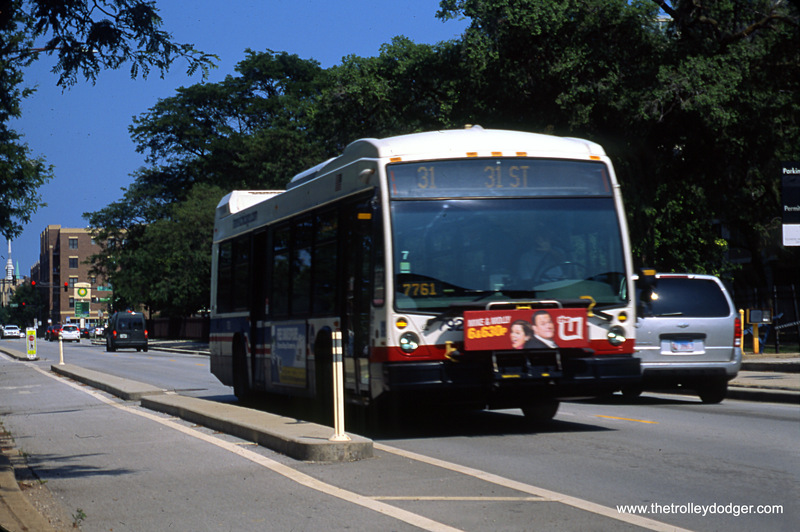 Pace buses in Elgin, June 2003. 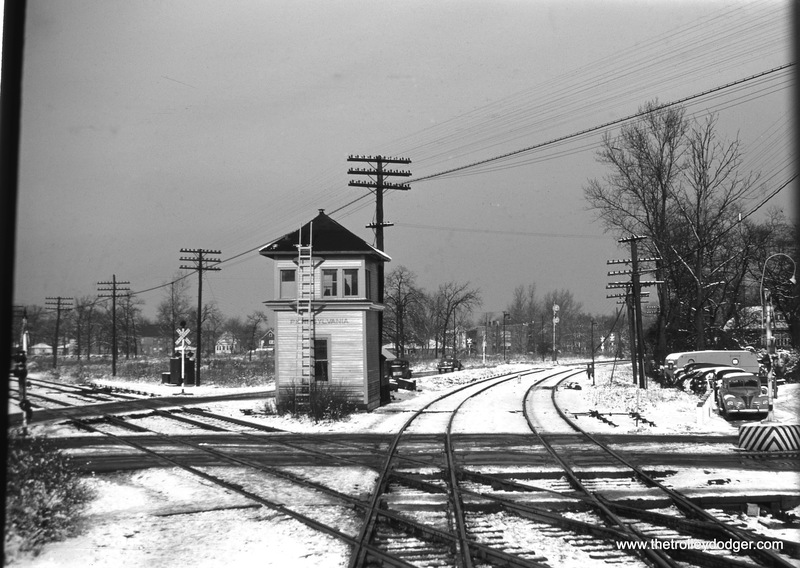 This is 91st St Tower in November 1949 — protecting the PRR/ROCK Xing on the ROCK’s Suburban (now Beverly) Branch. The tracks heading off to the upper right are the ROCK. Tracks heading off to the upper left are the PRR. 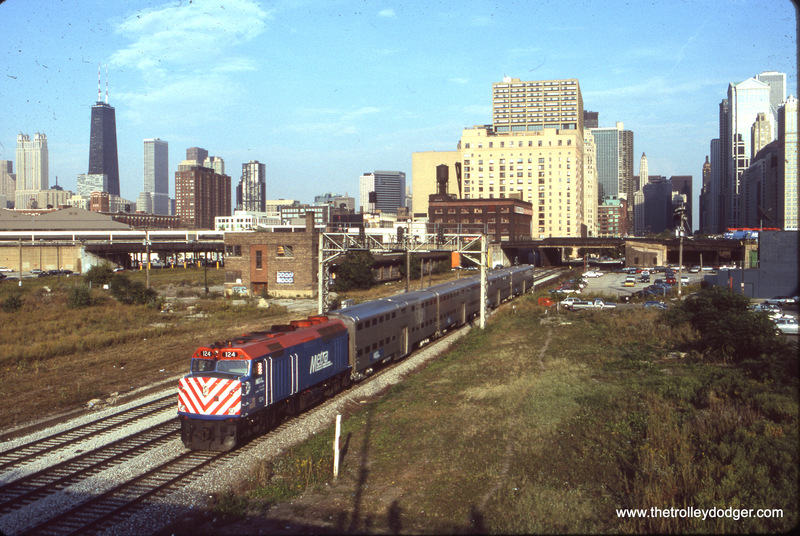 C&NW cab-coach 152 in Chicago, north of the Clinton Street Tower on August 2, 1978. 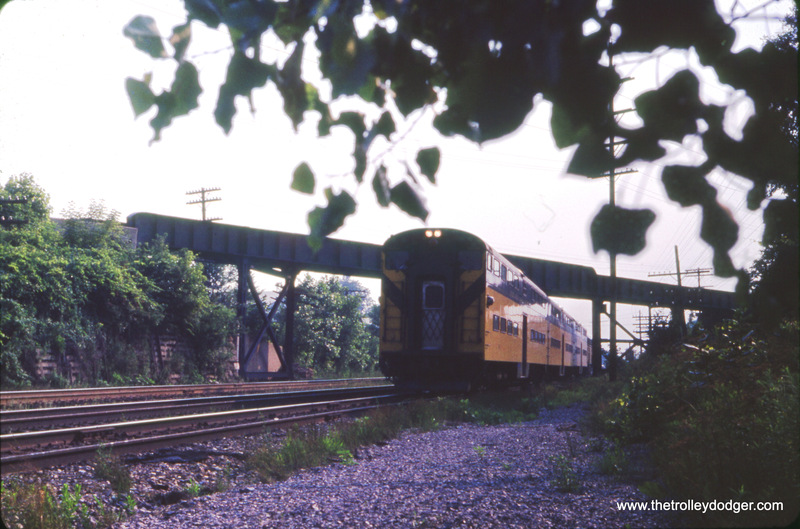 C&NW cab car 254 at Davis Street in Evanston on July 18, 1976. 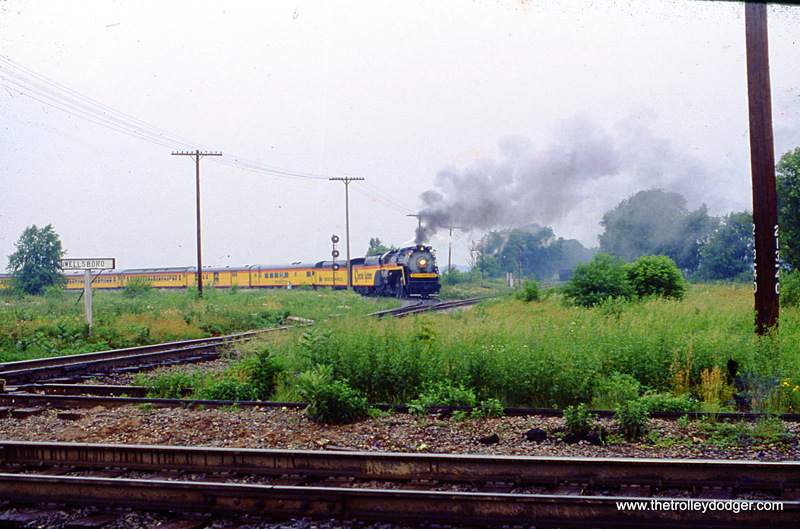 C&NW KO Tower in Lake Bluff, IL on May 5, 1977. 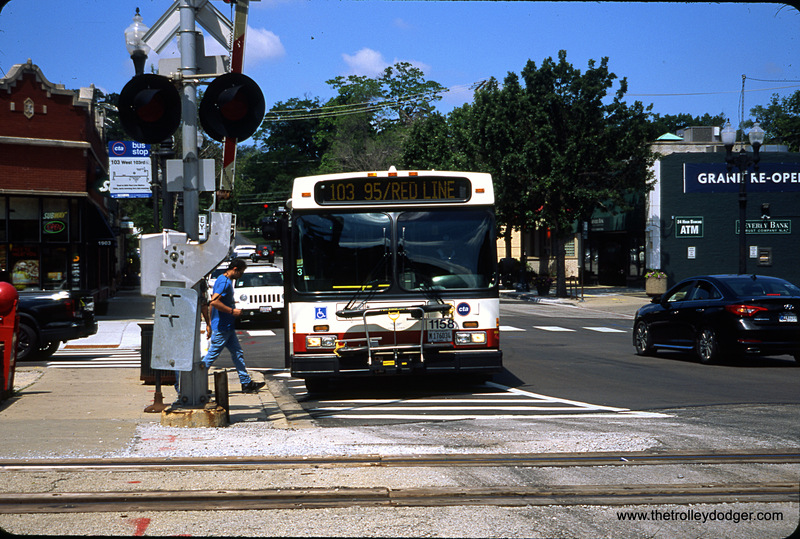 C&NW 1653 at Kenmore station, Chicago. 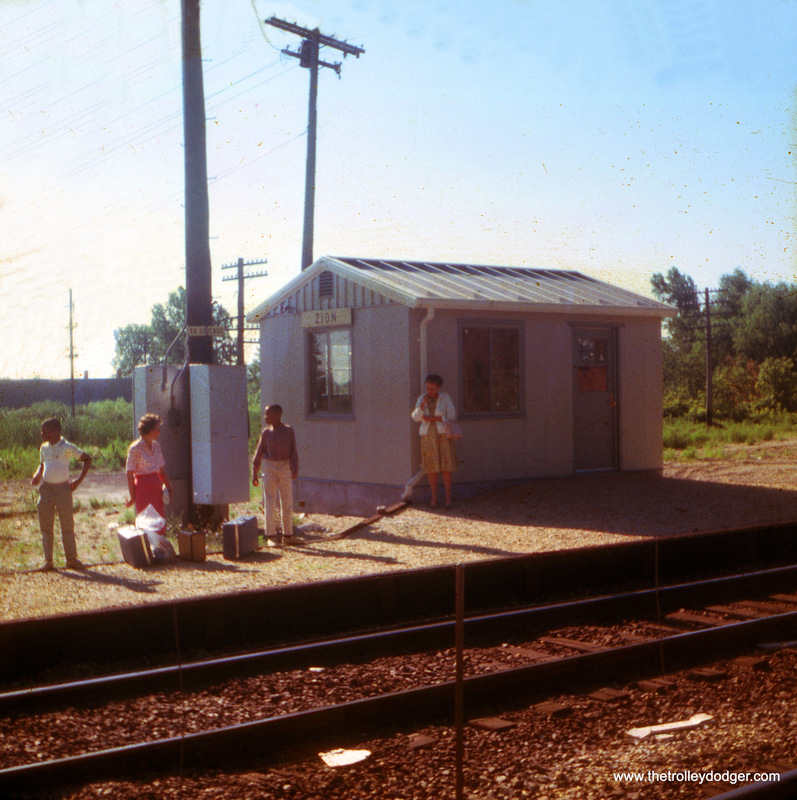 The C&NW commuter stop in Zion, July 30, 1966. 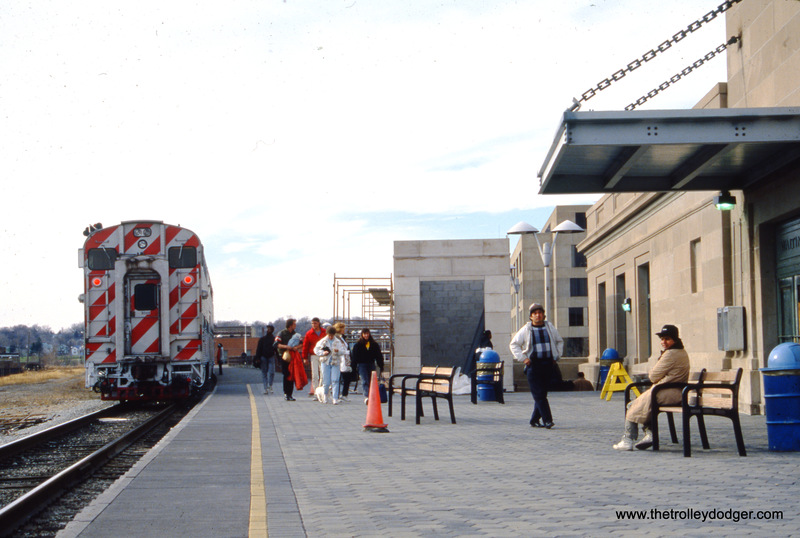 C&NW RDC cars in Park Ridge, IL. 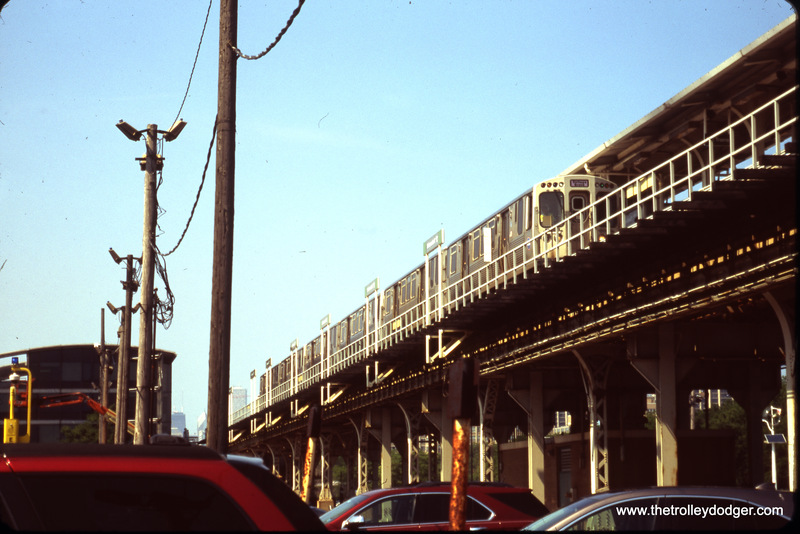 C&NW RDC cars southbound departing Kenmore station (Granville Avenue) in Chicago. 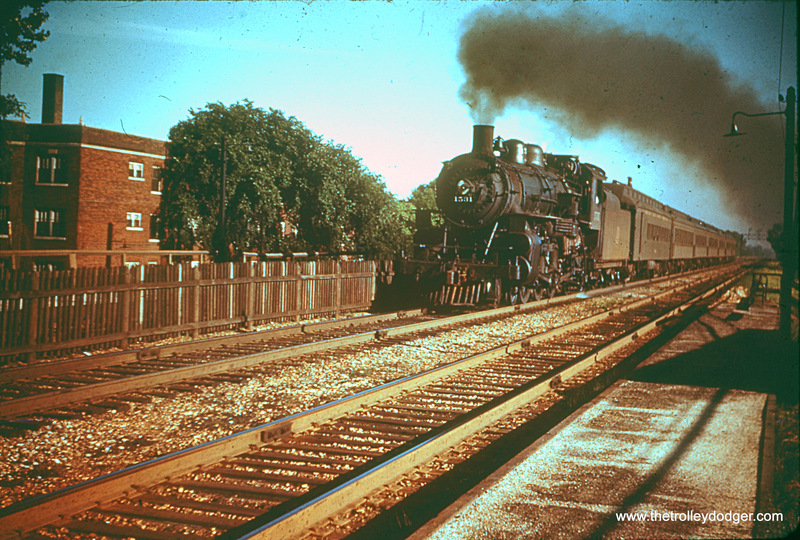 C&NW 1531 in Kenmore station, Chicago in May 1956. 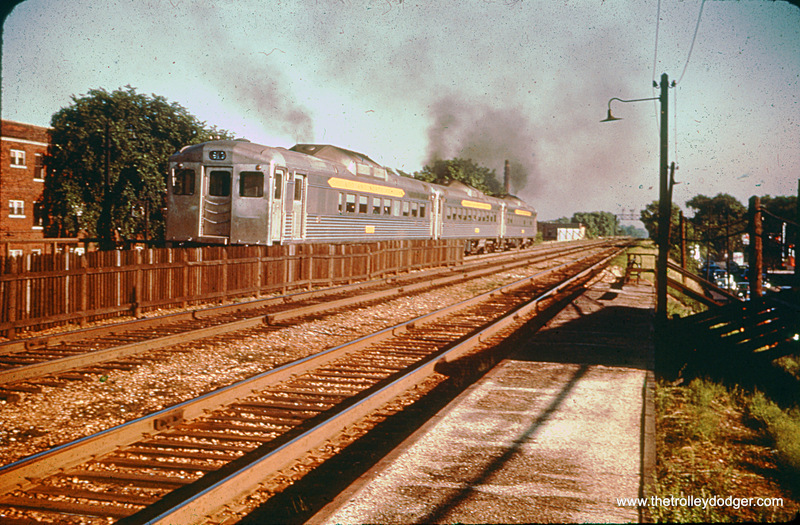 C&NW RDC cars, southbound at Kenmore station, Chicago, 1956. 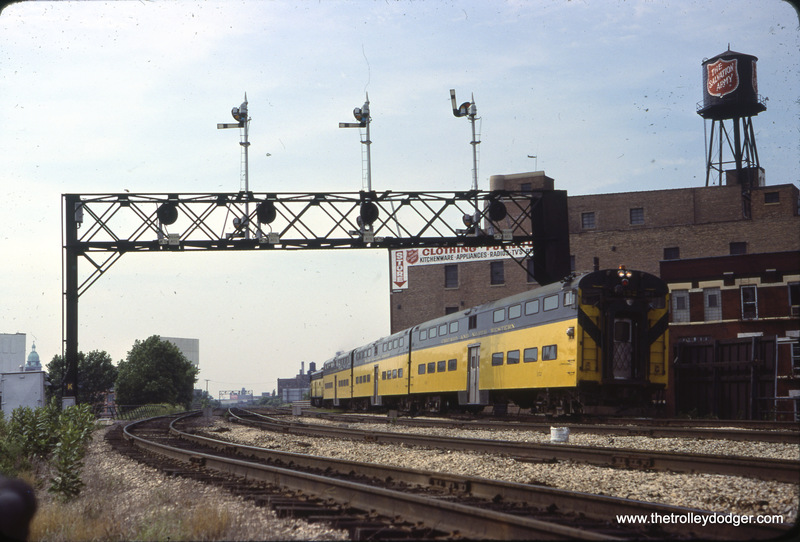 C&NW RDC cars in Waukegan, IL. 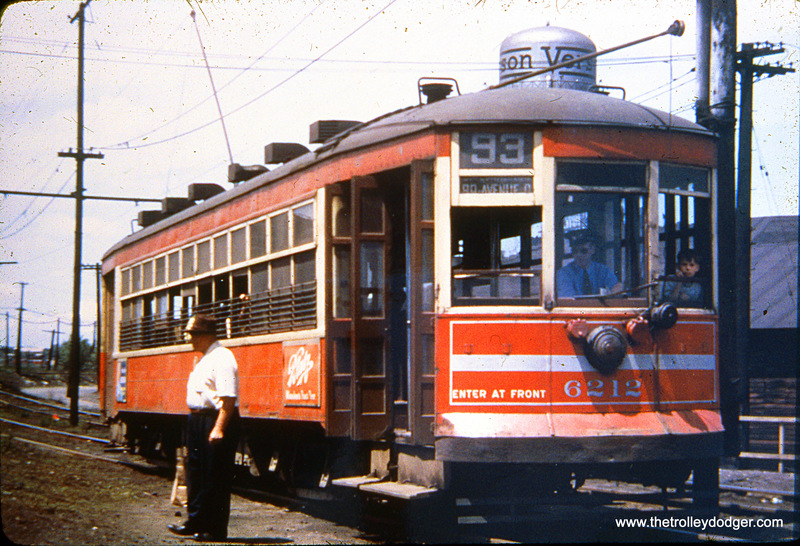 C&NW RDC car 9933 just north of Thome Avenue in August 1956. 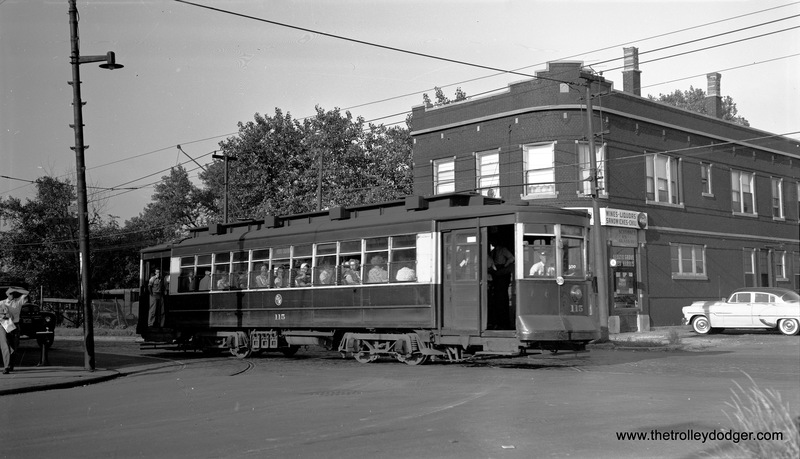 CTA 6213 at 95th and State in 1949. 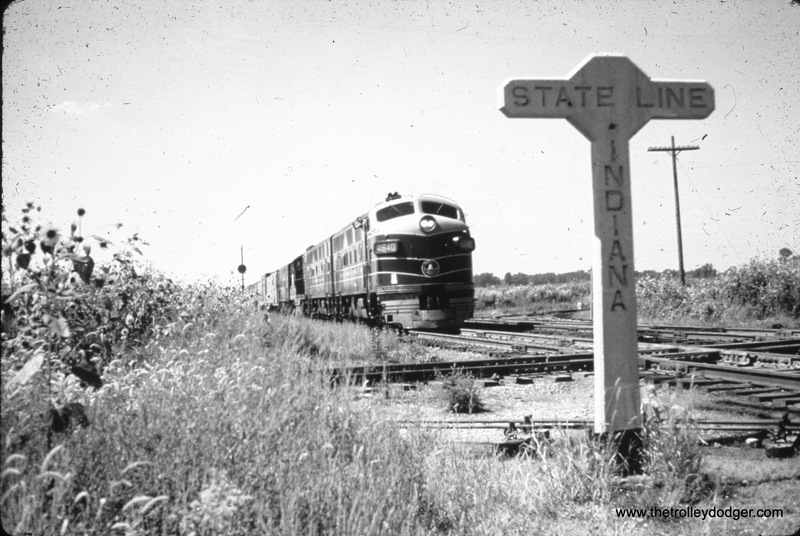 CSL 6212 on Route 93 near Blackstone, west of Stony Island on August 13, 1947. 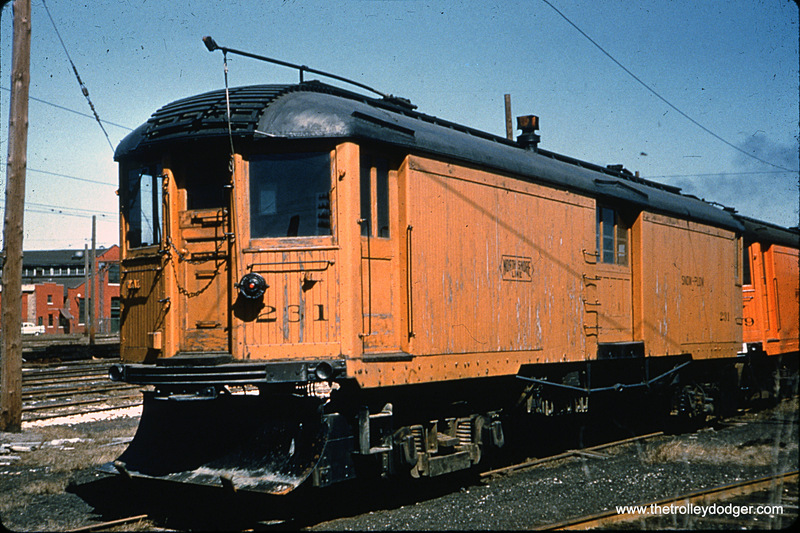 Don’s Rail Photos says, (North Shore Line) “213 was built by Cincinnati in March 1920, #2445, as a merchandise despatch car. 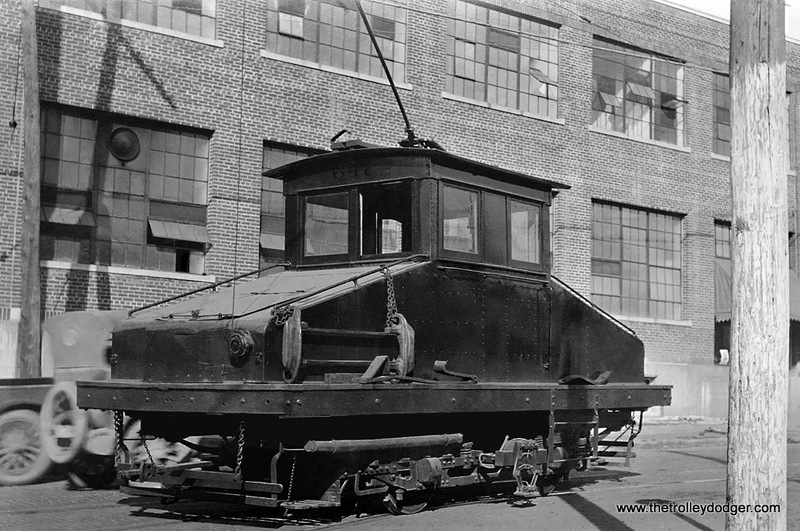 In 1940 it was rebuilt as a disc harrow ice cutter. 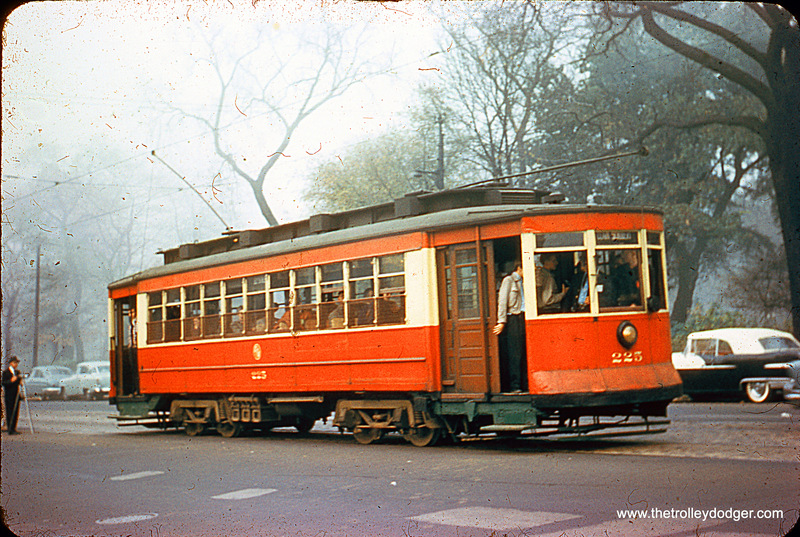 It was retired in 1955 and sold to CHF as their 242. 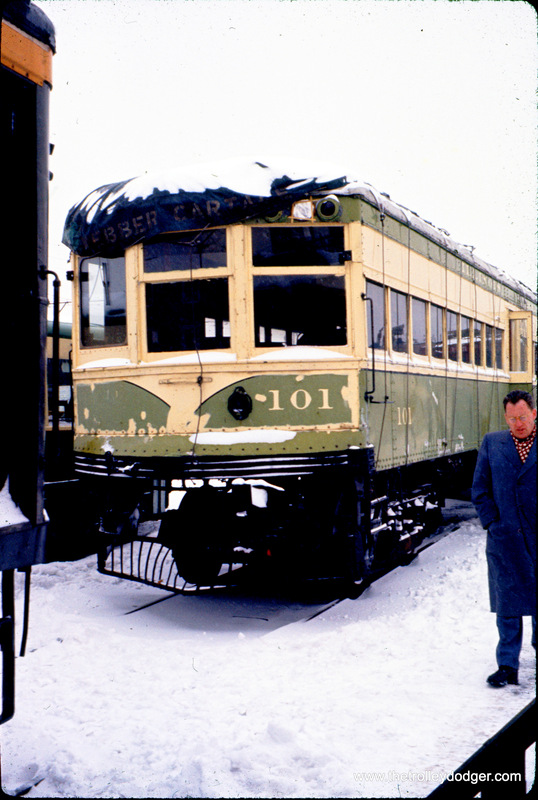 It was donated to Illinois Railway Museum in 1964.” Here, we see the car at the Chicago Hardware Foundry Company in February 1960. 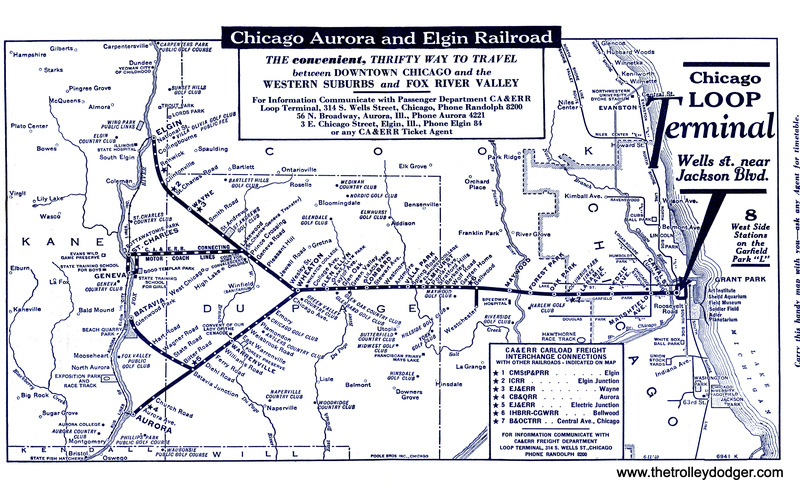 This was also then the location of the Illinois Electric Railway Museum. 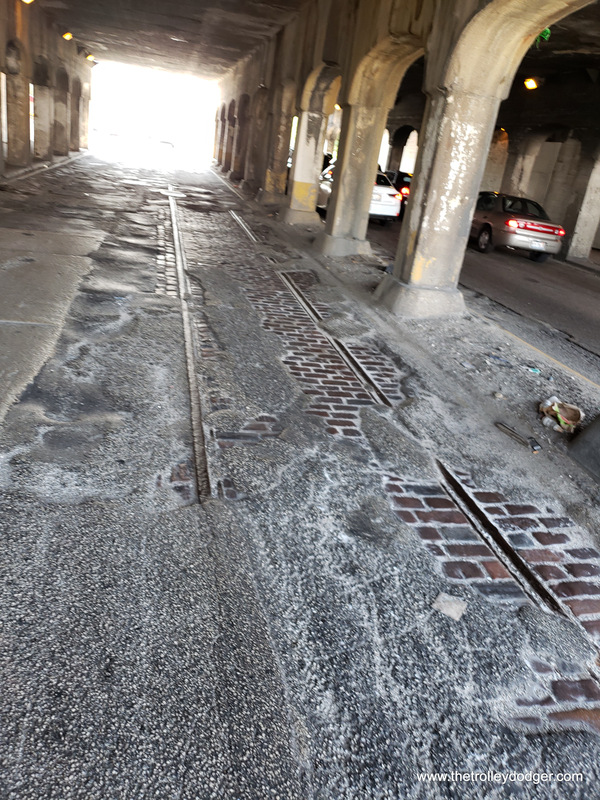 Exposed streetcar tracks are a rare sight in Chicago nowadays. 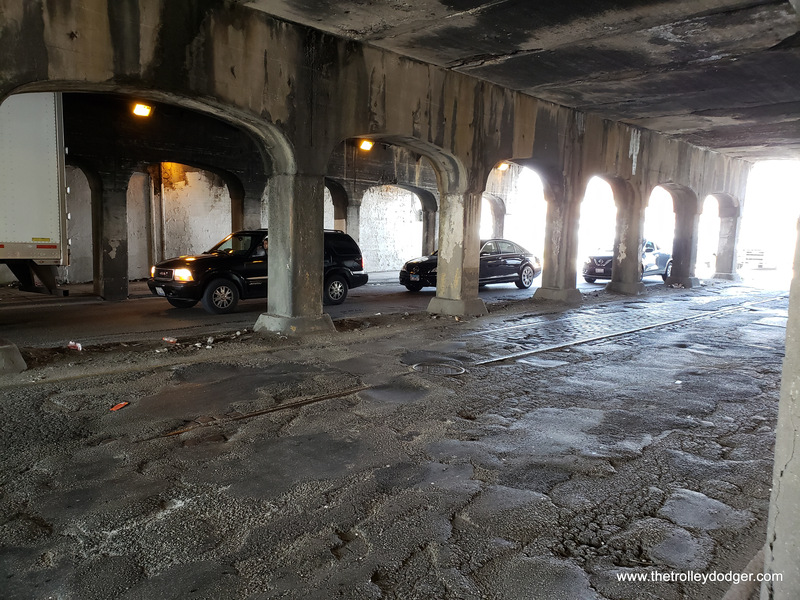 We recently took some pictures of some on Western Avenue under a viaduct just north of 18th Street, in the northbound lane. 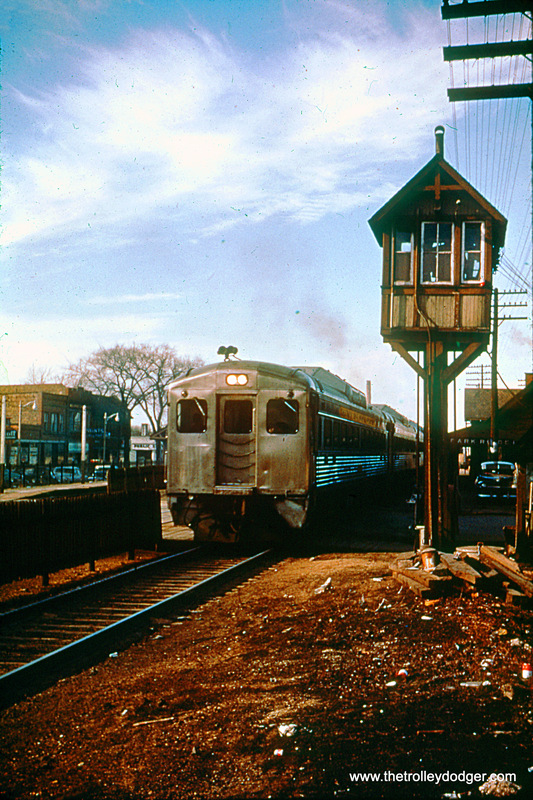 CTA 2029-2030 on the turnaround loop at the DesPlaines Avenue terminal in October 1964. We are looking west. 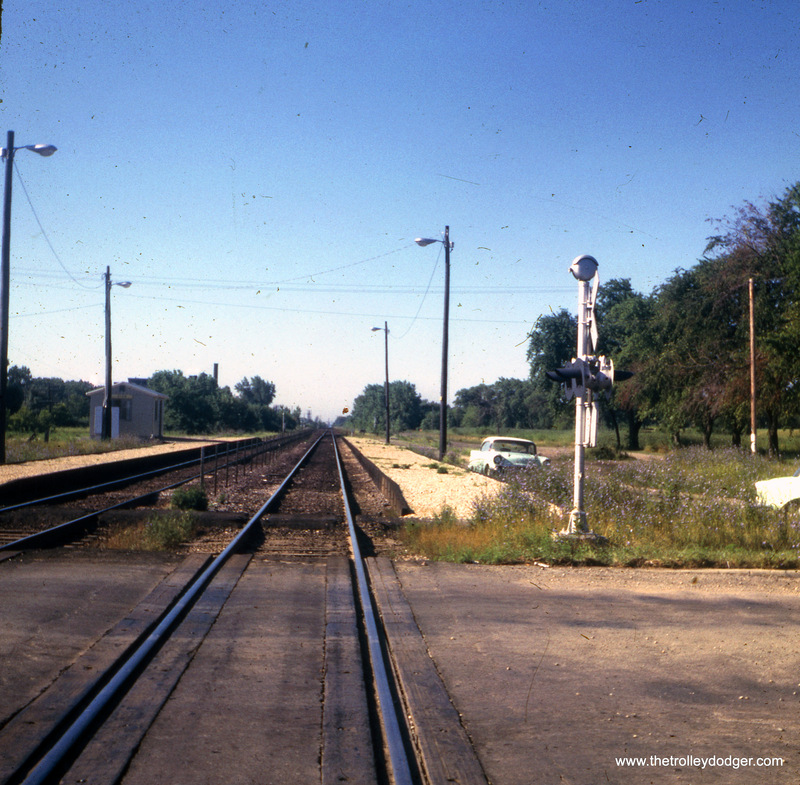 Here, you can see the close proximity of the Chicago Great Western tracks to the right. 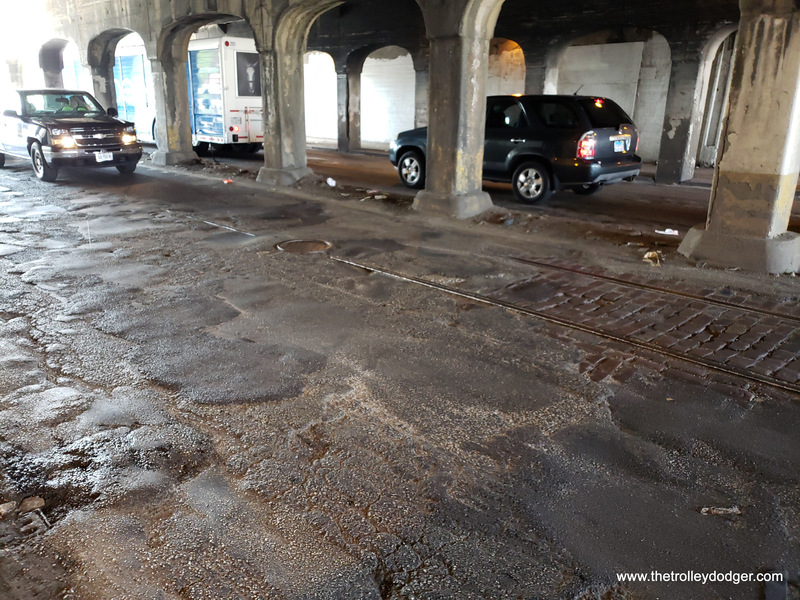 These have since been removed, and the area turned into a bike path connecting with the Illinois Prairie Path at First Avenue in Maywood. 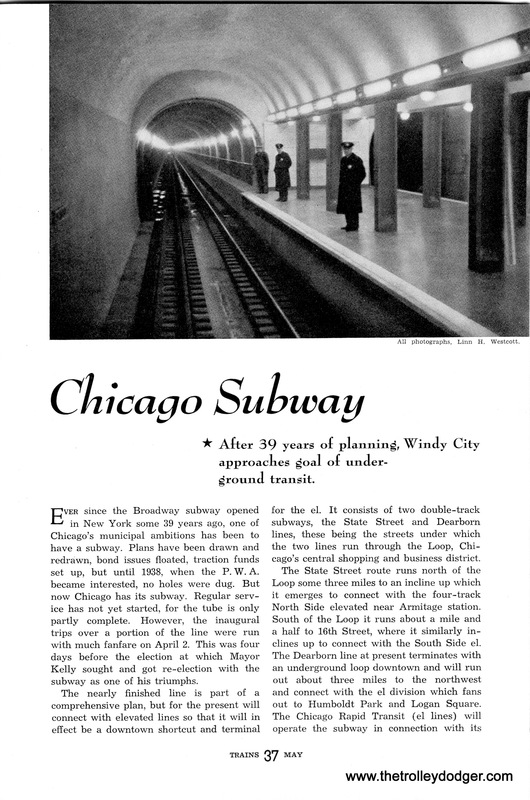 Here is an article about the new Chicago Subway, from the May 1943 issue of Trains magazine. 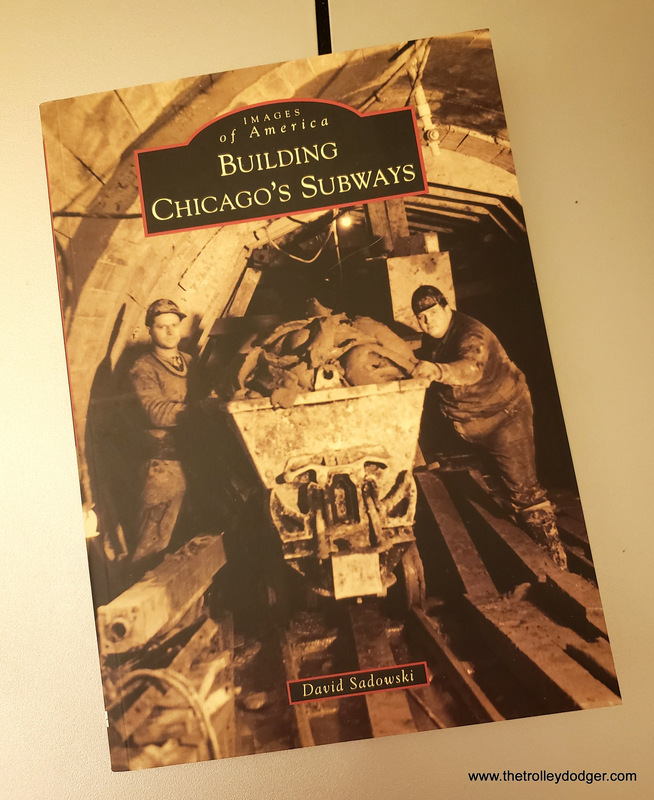 (For information about our new book Building Chicago’s Subways, see the end of this post). 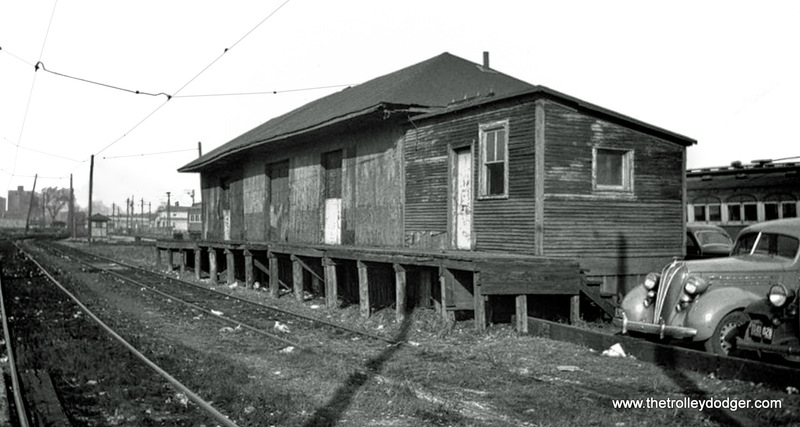 We recently purchased the Navy Yard Car Barn, built in 1891 by the Washington and Georgetown Railroad Company. 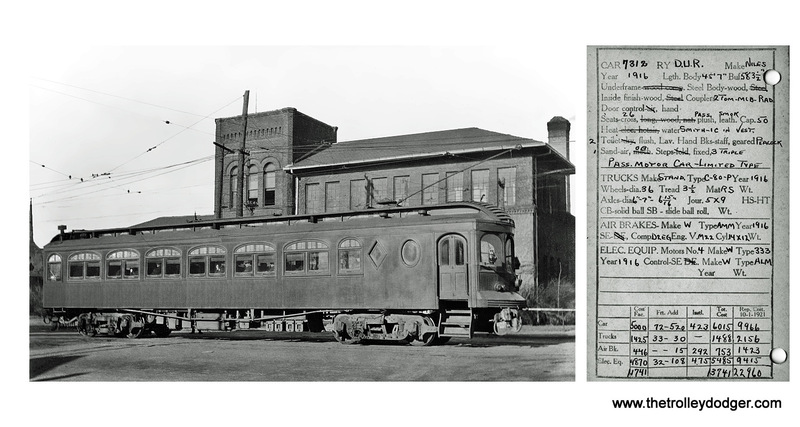 It was one of four streetcar barns in DC. 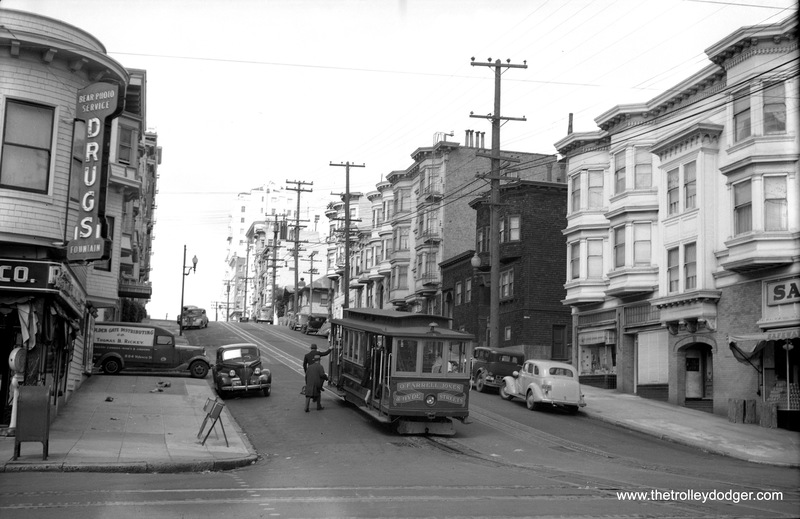 We’d like to celebrate the history of streetcars in our buildout of the space. I know you’ve got some amazing images in your collection. Is there a way to purchase some of those? 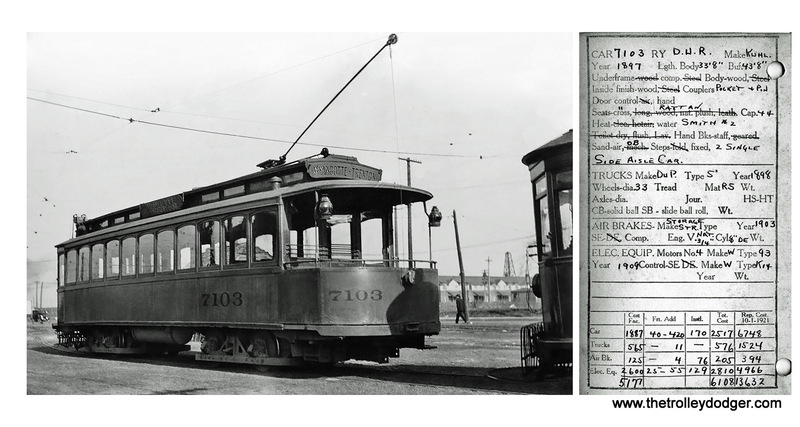 We’re also trying to purchase an old DC streetcar. Thought I’d ask if you know where we might be able to find one? 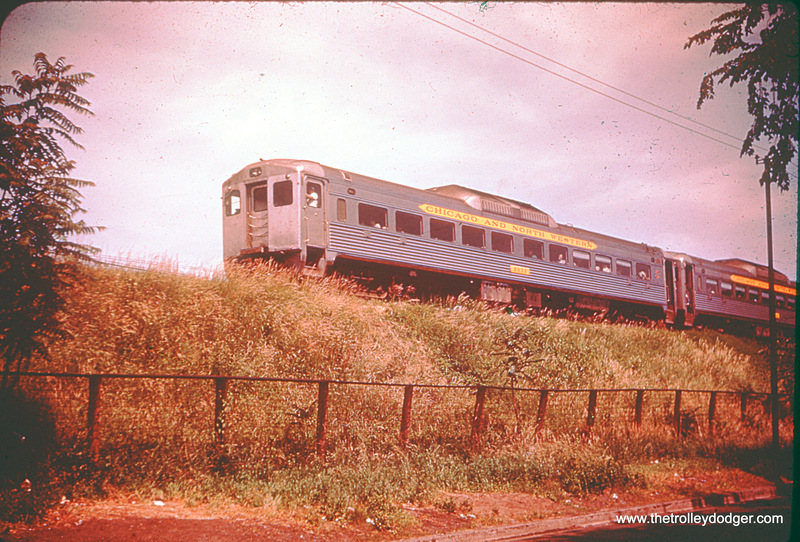 After the DC system quit in 1963, some PCC cars were shipped overseas and others were heavily modified for use in the Tandy Subway operation, which no longer exists. The bulk of remaining equipment is in museums. 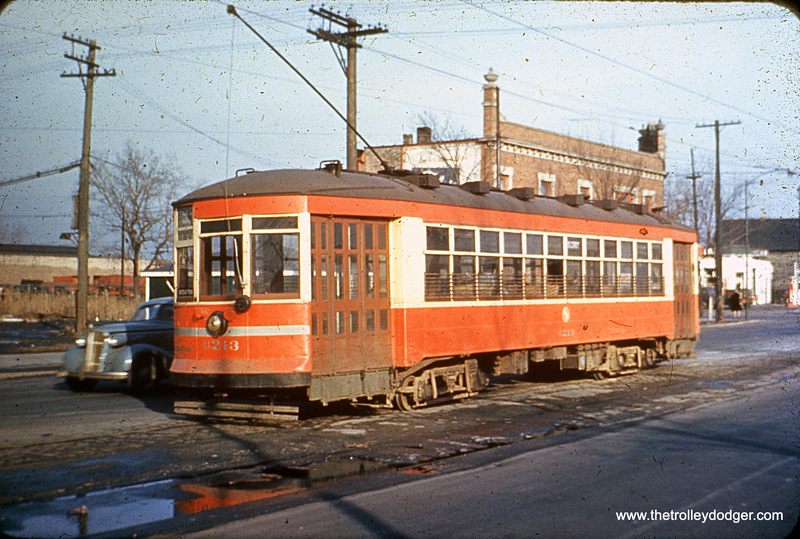 Unfortunately, there were a few DC streetcars that were preserved at first, but were later destroyed. 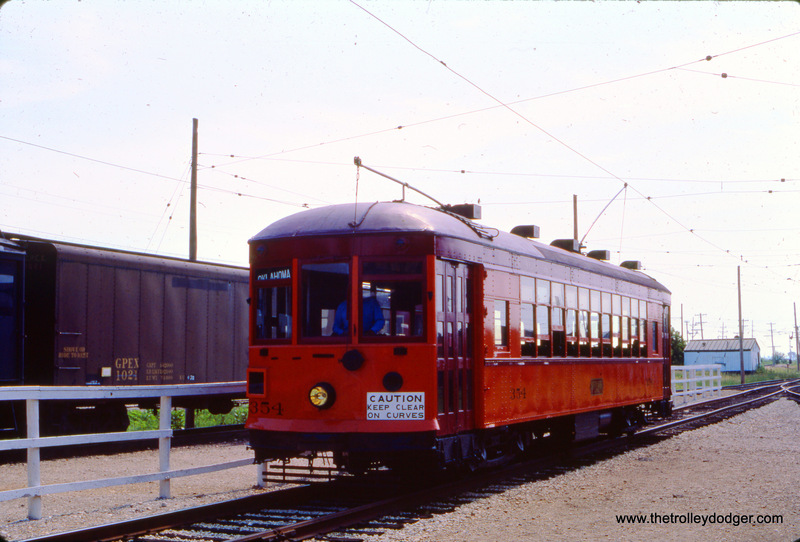 These include the Silver Sightseer PCC and pre-PCC car 1053. We can offer prints from some of the images on this site, but not others… only the ones we own the rights to. 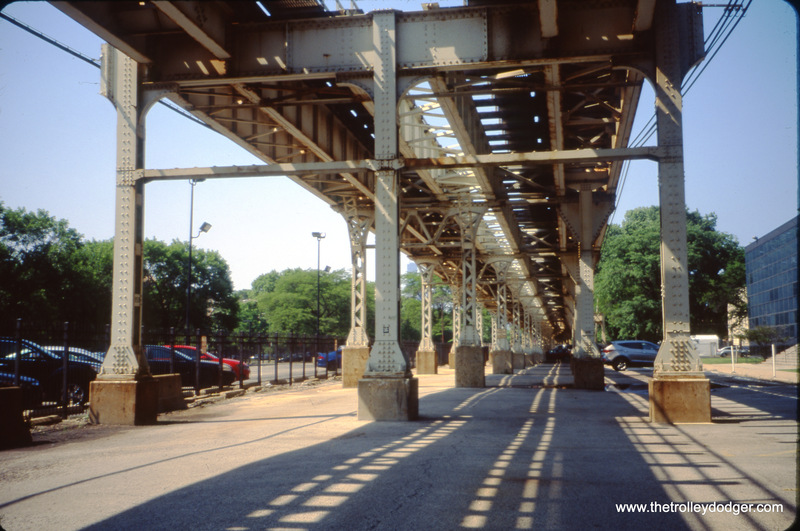 We specialize in the Chicago area, and as a result, do not have that many DC images. 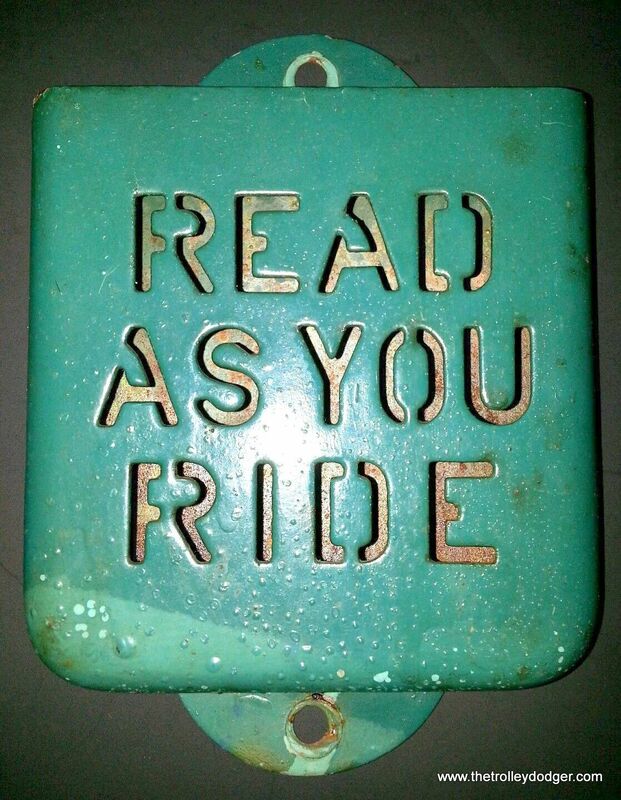 But perhaps some of our readers can point you in the right direction for those. (If anyone reads this and can help, write to me and I can put you in touch with Mr. Batterson. 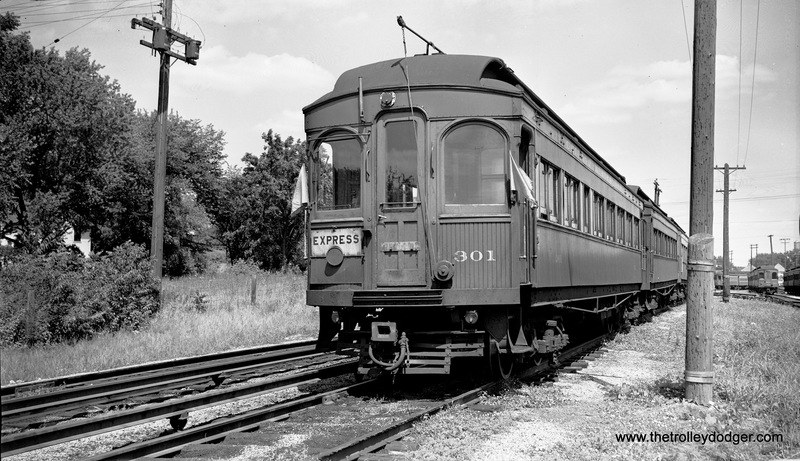 This three-car train of Chicago Transit Authority 4000-series “L” cars is signed as a Howard Street Express in June 1949. 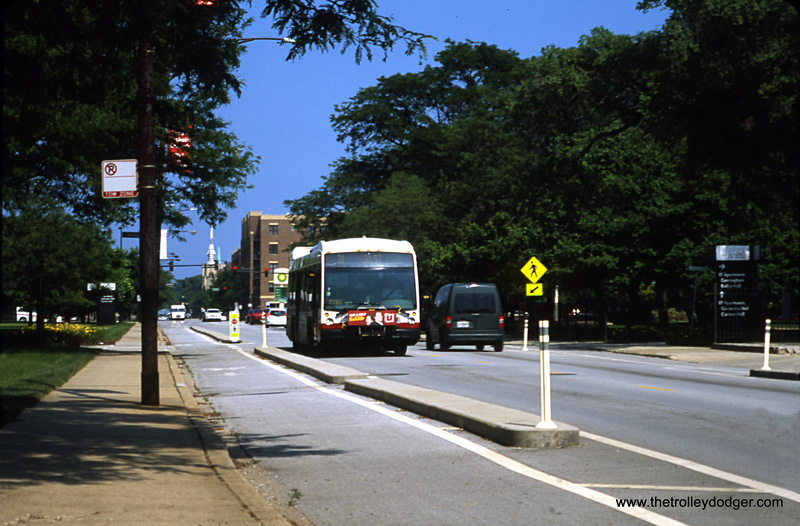 (L. L. Bonney Photo) Our resident south side expert M. E. adds, “Methinks this photo was taken looking west at the Indiana Av. (at 40th St.) station. 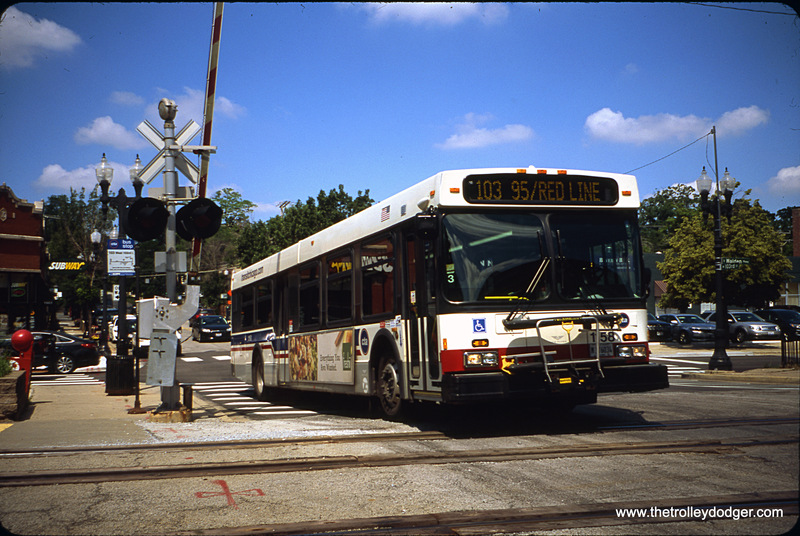 Because the train destination sign says Howard Express, the location has to be on the main north/south line. 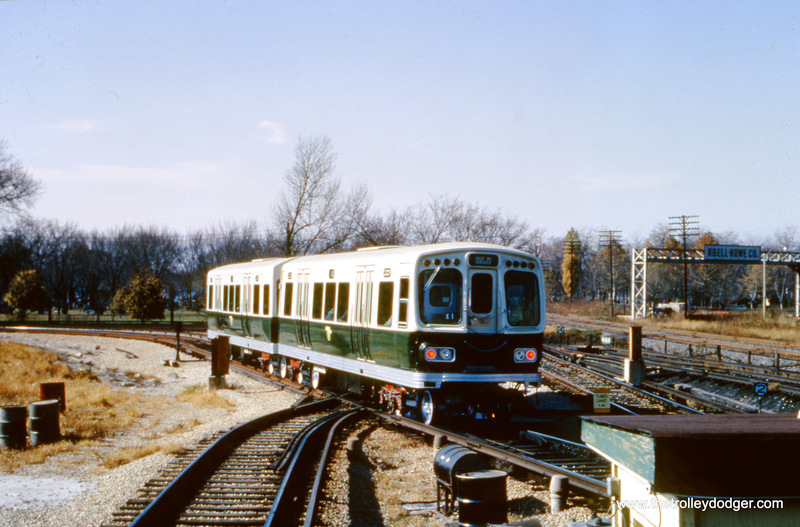 (Plus, this train had to originate on the Jackson Park branch, because Englewood trains at that time ran to Ravenswood.) 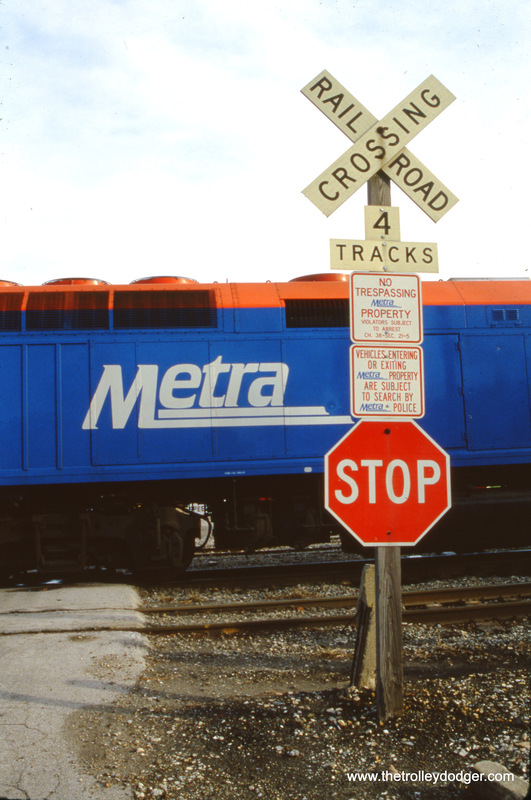 Also, I don’t recall any other three-track main anywhere else on the north/south line. 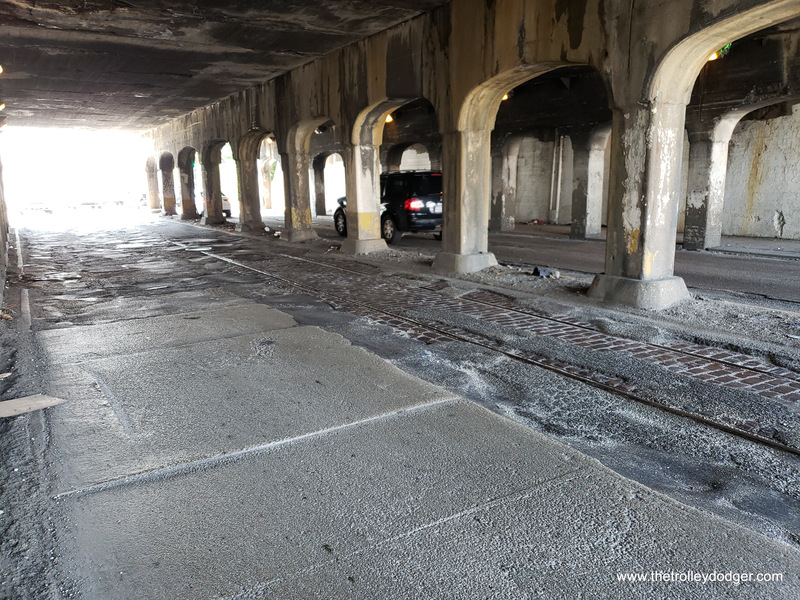 Also, Indiana Ave. had the overhead walkway to get to and from the Stock Yards L, which terminated to the left of the left-hand platform in the photo. 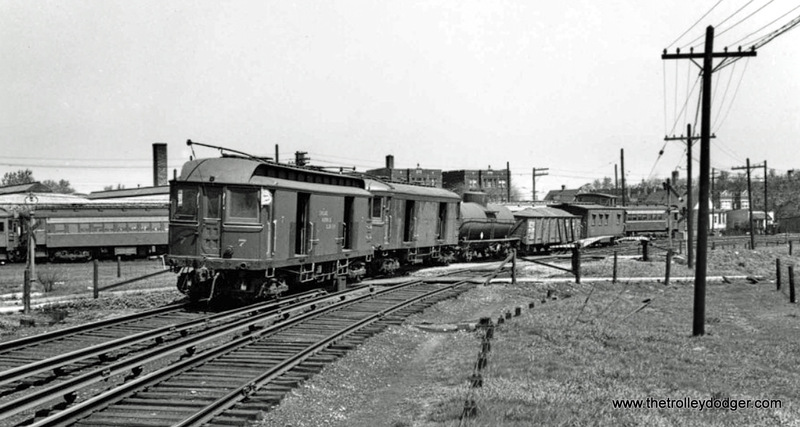 Also of interest is that this photo shows a three-car train. 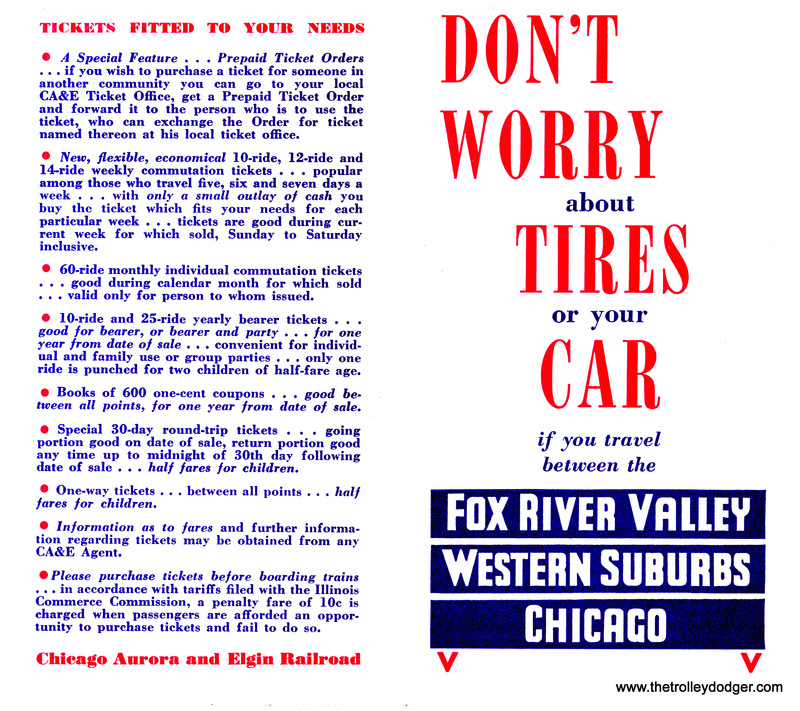 Before the advent of new equipment in 1950 there were no “married pairs” of cars. 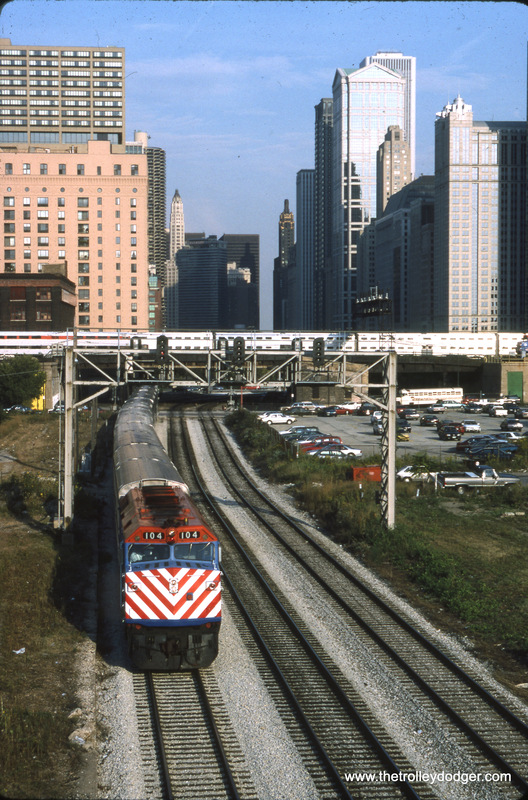 Trains could be as small as a single car, which I recall seeing on the Englewood branch on Sunday mornings. 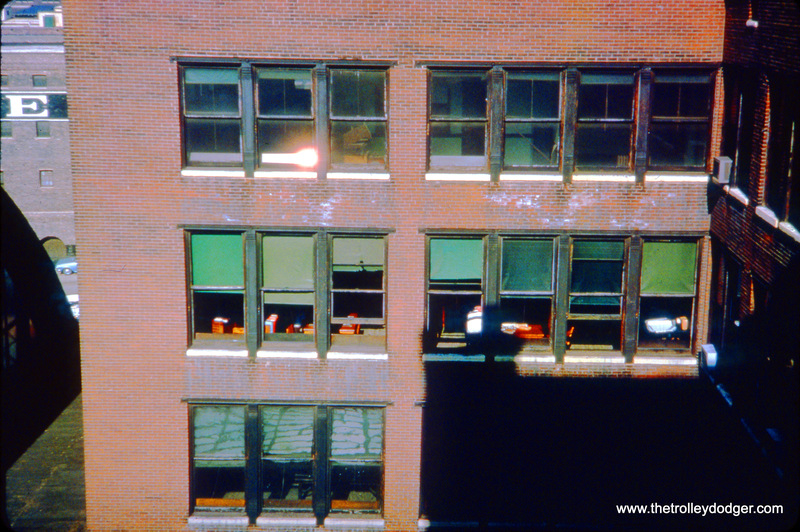 Photo #365? 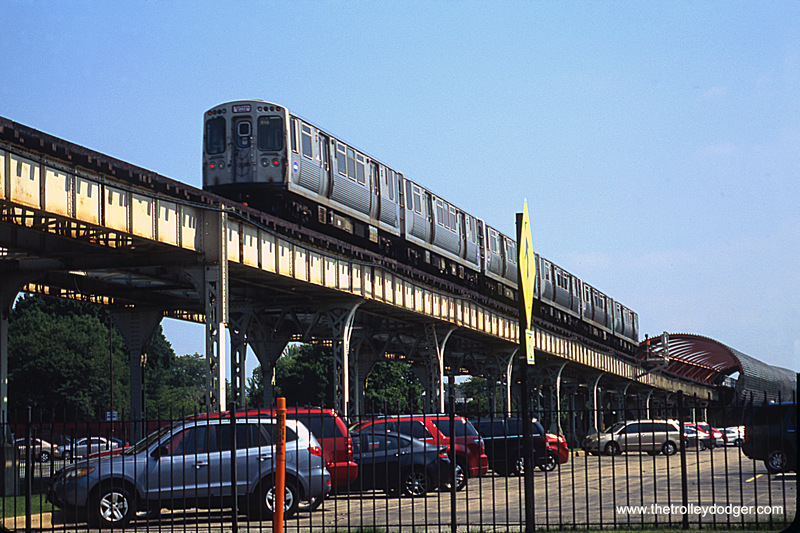 3-car train of CTA 4000s standing at the 38th St station. I differ with your explanation of the conductors door work. 1. 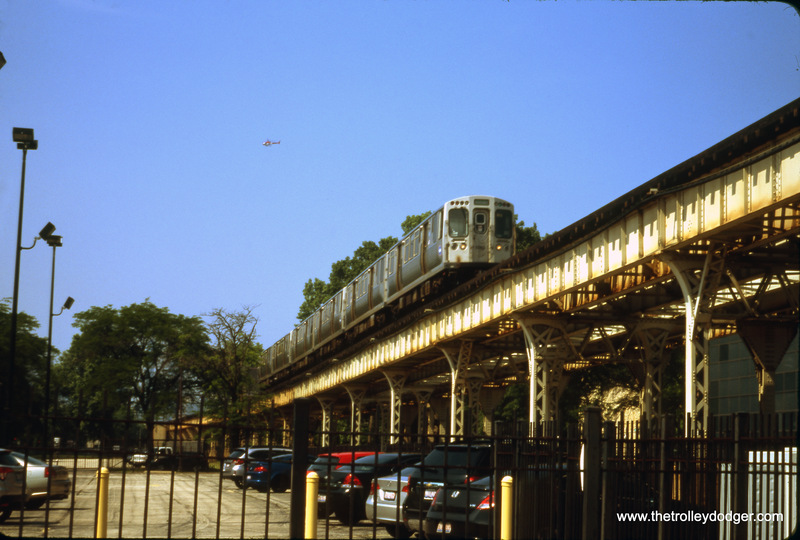 When the CTA took over they made all the doors on the 4000s one-man operated, allowing for trains with odd number of cars . 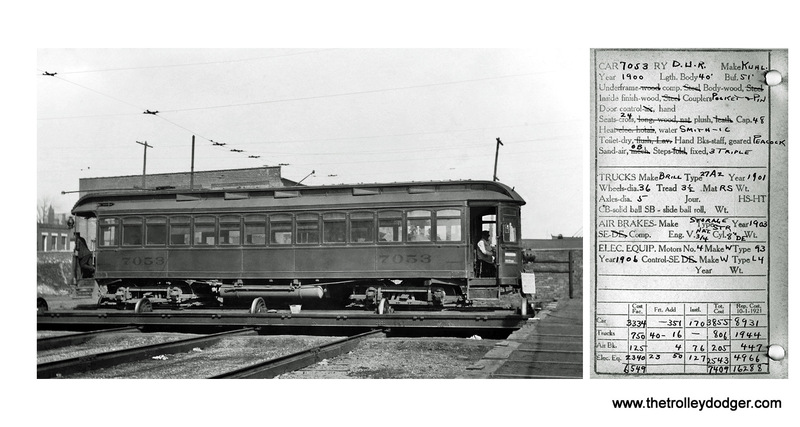 Thus, 8-cars, 4-cars, 3-cars, 1-car= only 1-conductor per train. 2. 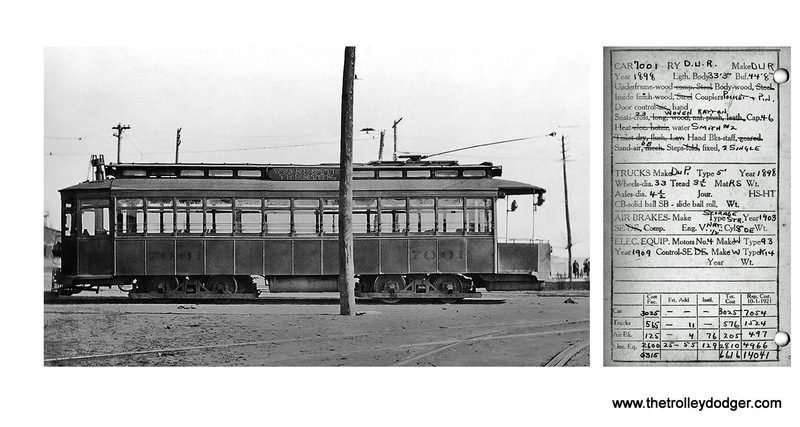 Way prior to that, the CRT used a conductor between each two cars, doing the doors as you described. 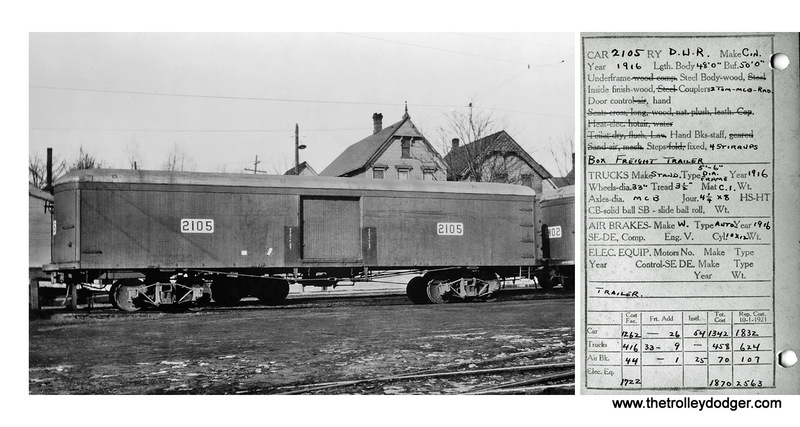 8-cars=8-conductors, etc. 3. But later, prior to the CTA, the CRT re-wired (air?) the 4000s so that a conductor between every two cars could operate all the doors on two cars. 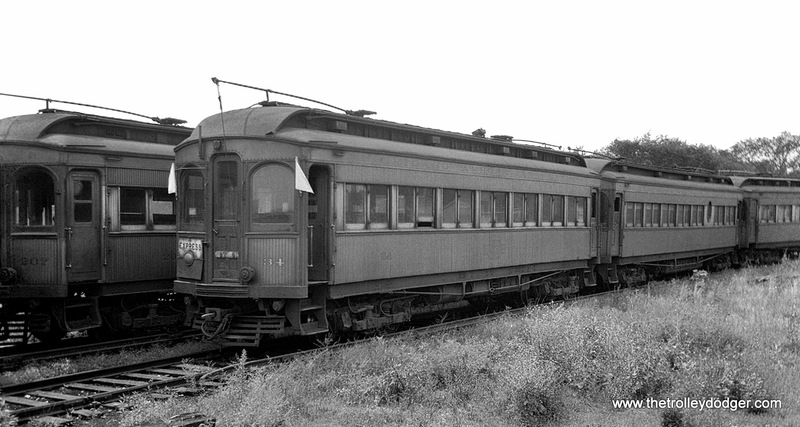 8-cars=4-conductors etc. 4. On multi conductor trains, there was only one signal used and that was by the front conductor, not by the other conductors. Nor were there differing sounds or number of bells or buzzers! 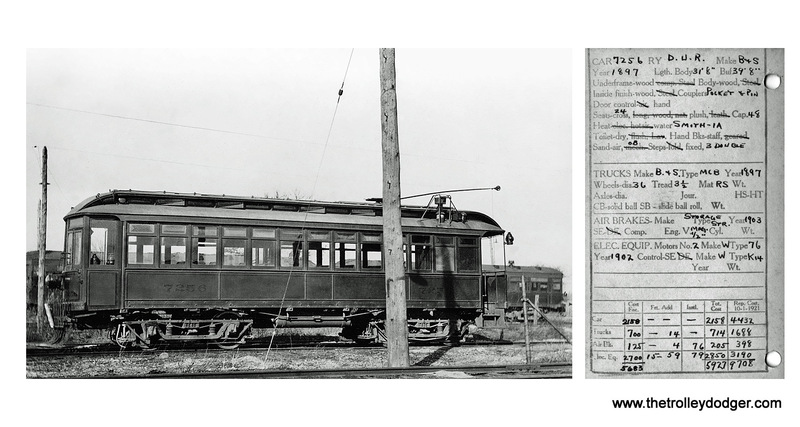 The front conductor monitored the rear conductors doors, when all were closed, then he would signal the Motorman. 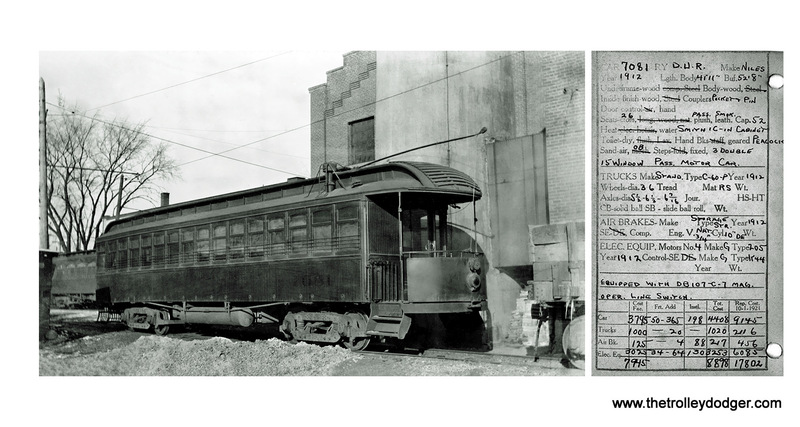 There usually was not much of any delay, the reason for less men was to lower labor costs, not to speed up the train. This is from my memory & further info from conductors back then. You are referring to the explanation of how door controls worked on the 4000s, given by one of our readers (M. E.) in the caption for the photo called proofs365.jpg. 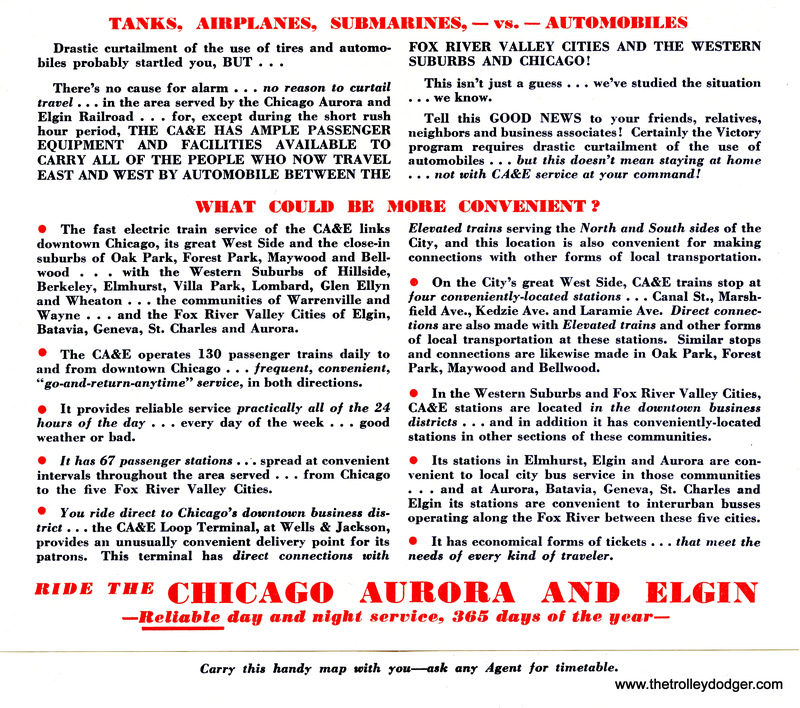 We had previously reproduced a CTA training brochure dated March 1950 in our post Reader Showcase, 12-11-17. 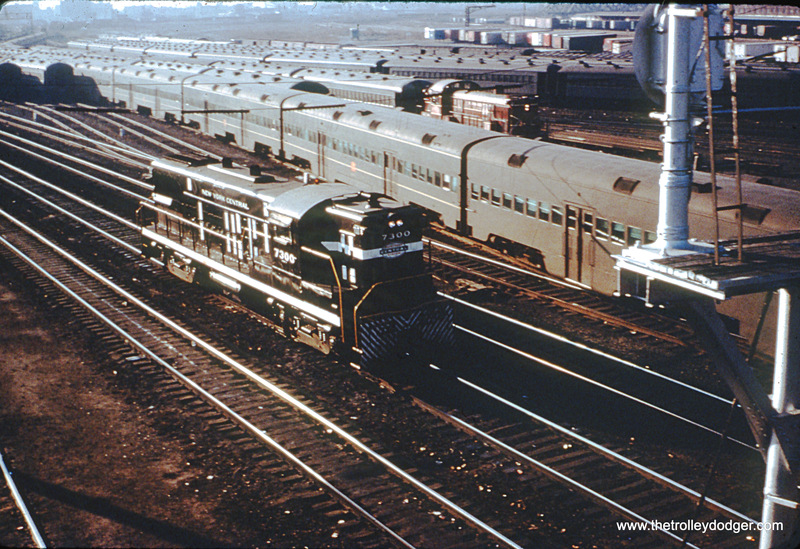 By this time, the 4000s had been retrofitted into semi-permanent married pairs, so a three-car train, as shown in the June 1949 picture, no longer would have been possible. The 1950 training brochure does mention using a buzzer to notify the next train man in one direction. 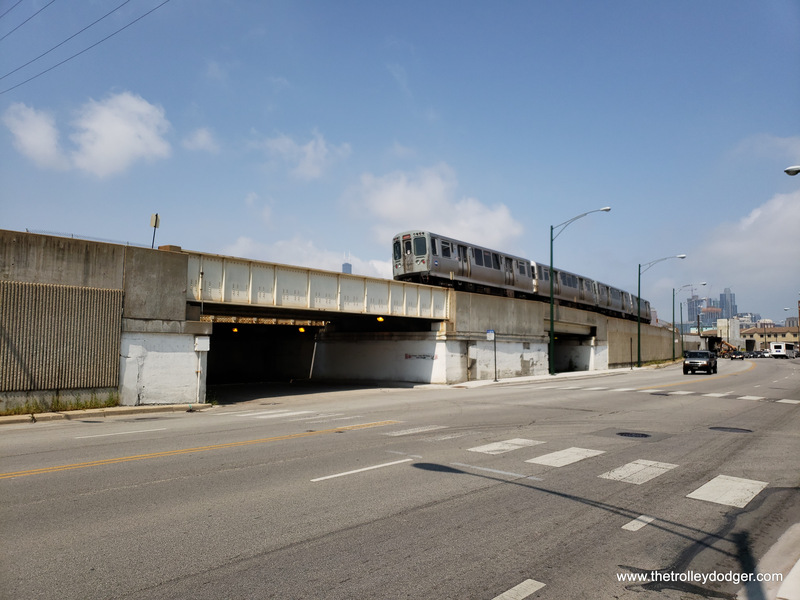 After the CTA ordered the first set of 6000s (6001-6200), they set about retrofitting the 4000s to make them operate more safely, economically and basically more like the forthcoming 6000s. By the time the 6000s started rolling in, the changes had been pretty much completed. 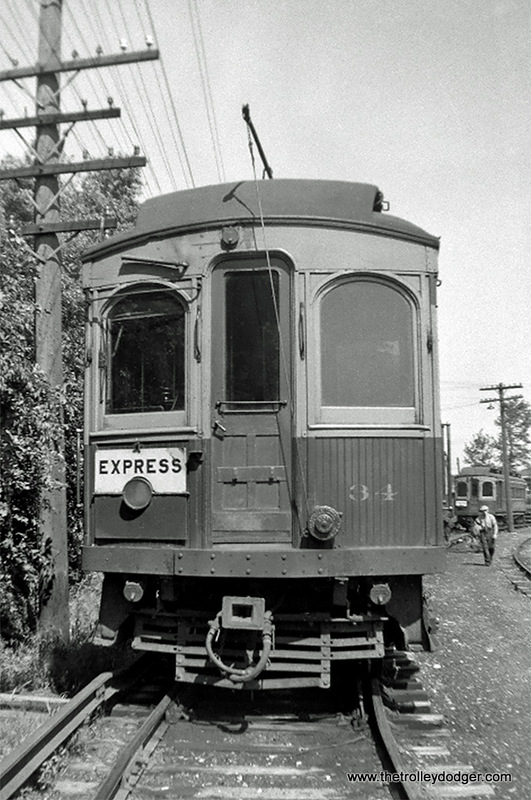 In this overhaul, the 4000s were given multiple unit door control, standardized to use battery voltage for control, the trolley feed on Evanston cars was tied together so only one pole per pair was needed, and they were paired up into “semi-permanently coupled pairs” (as opposed to the “married-pairs” of the 6000s), usually in consecutive numerical order. Additionally, the destination signs (which were all still hand-operated) were changed to display either the route names (i.e. 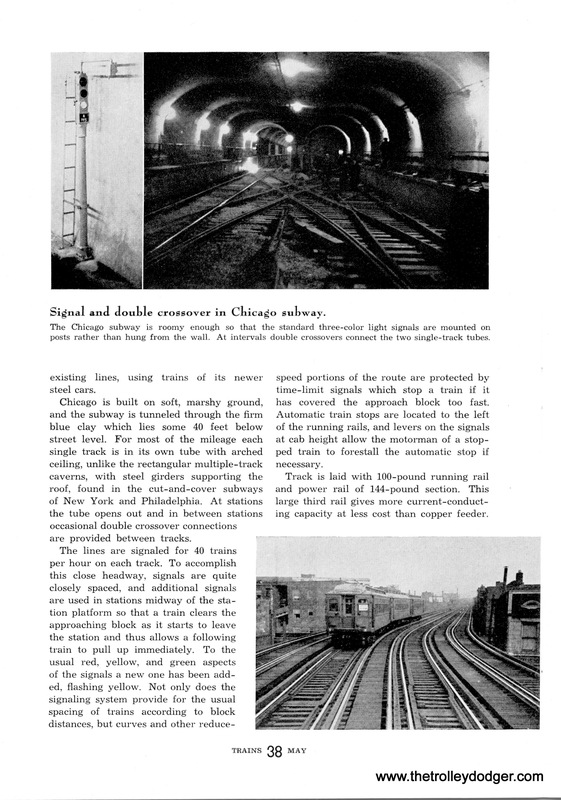 “Ravenswood” or “Lake A”) or both terminals (i.e. 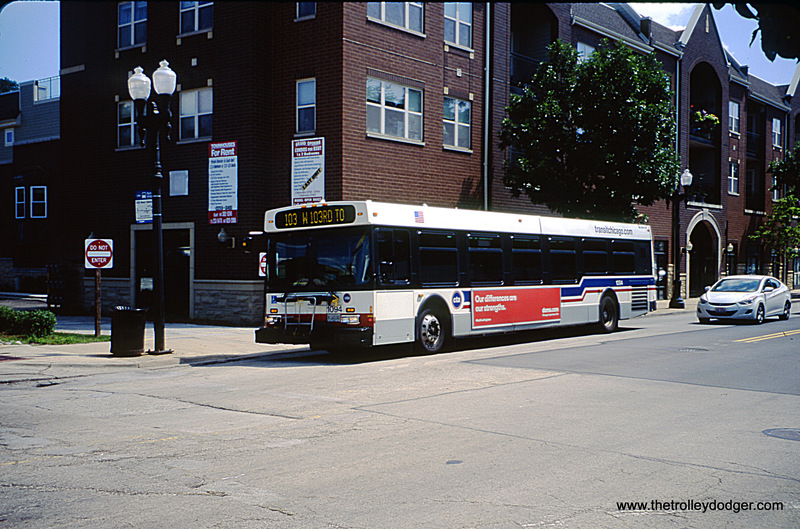 “Howard – Jackson Park B”) so they wouldn’t have to be changed for the reverse trip. 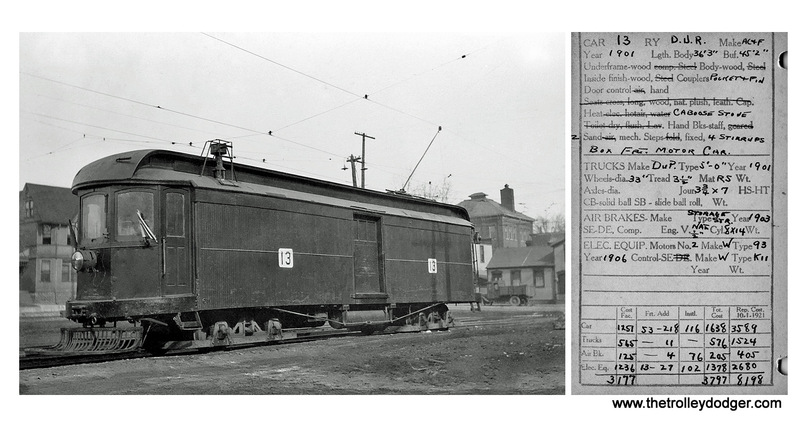 The number of signs per car was reduced from four to two, not counting the destination board on the front. All this allowed a two-man crew to staff a train of any length. This does not of course explain door operation prior to 1950, and I promised to do further research, by contacting Andre Kristopans. Wood cars very simple – man between each two cars as doors were completely local control. End doors of train were not used. Steel cars more complicated. 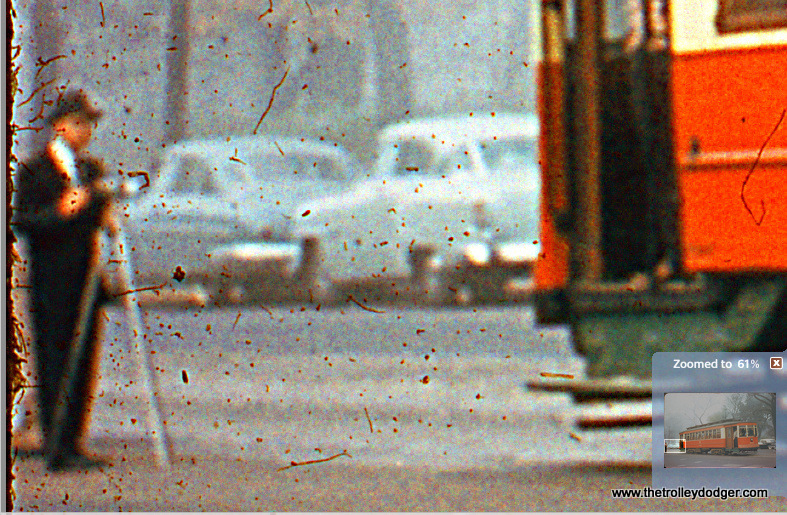 Originally same as woods – man between each two cars. Remember steels and woods were mixed. 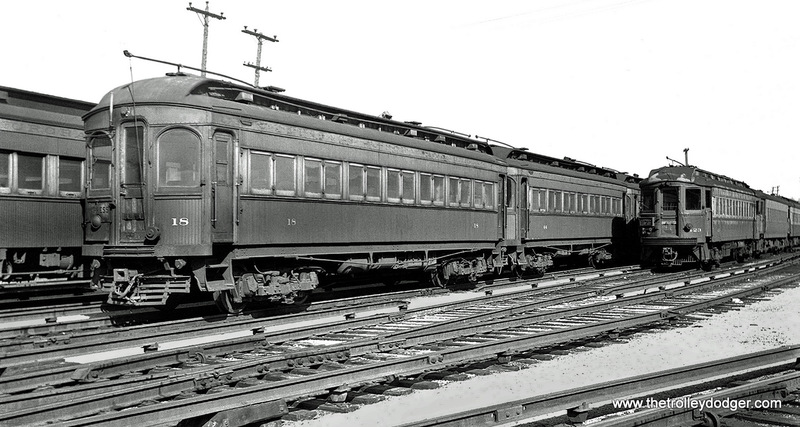 In 1940’s changed so man could control doors at both ends of cars on either side of him, so conductor between 1and 2, guards between 3 and 4, 5 and 6, 7 and 8 only. Then in 1950’s full trainlined doors. Initially one conductor for 2 or 4 car trains, working between last 2 cars, on 6 or 8 car trains conductor between cars 3 and 4, guard between last two. Guard eliminated late 50’s, conductor in sane (same?) position now controls all doors. Thanks for the info. On the woods and early 4000s, how did the guards and conductor signal each other? They had signal bells. First rear guard pulled the cord that rang the gong at forward end of that car. Then that guard pulled the rope by his position to signal the next guard up. When the conductor got the signal and pulled his rope, the gong by the motorman rang and he released and started up. Yes the 4000’s evolved. Originally basically operationally identical to woods. 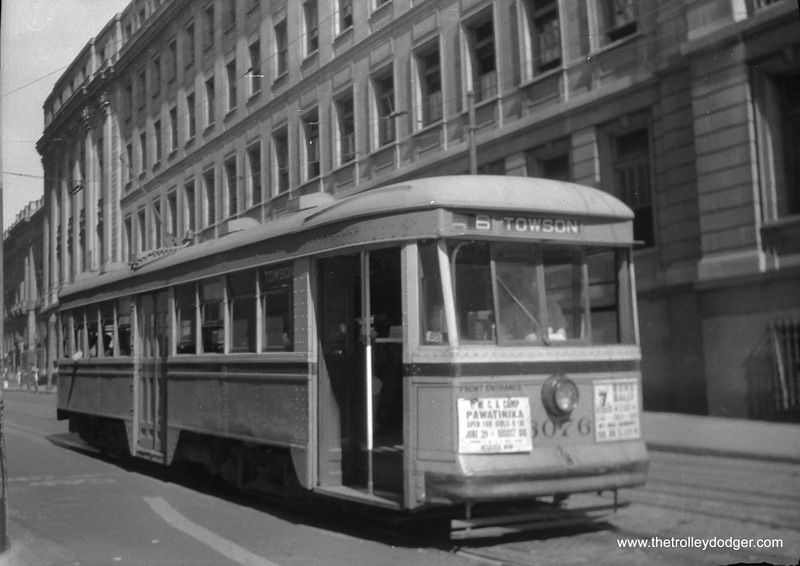 Circa 1943 before subway, converted from line voltage control to battery control. Now they were no longer able to train with woods. Around same time changed to door control at each end controlling doors at both ends. In 1950’s full mudc, paired with permanent headlights and permanent markers (over a period of a decade or so!). Shore Line’s Baldies book shows how this happened over time if you compare photos. Large door controls early for single door control, small door controls for entire car control, then no door controls on paired sets. This is something that has not been looked into much, but a 1970’s 4000 was VERY different from a 1930’s 4000! Our thanks to Andre and everyone else who contributed to this post. Keep those cards and letters coming in, folks! 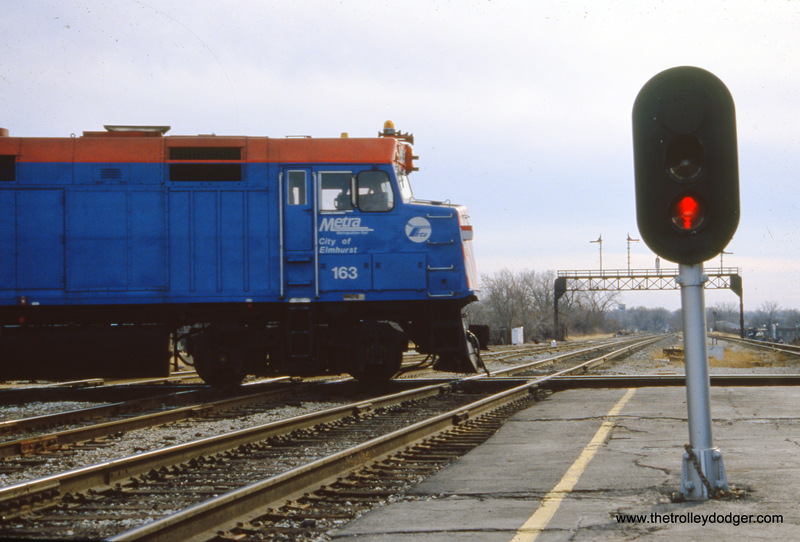 This is our 218th post, and we are gradually creating a body of work and an online resource for the benefit of all railfans, everywhere. To date, we have received over 432,000 page views, for which we are very grateful. 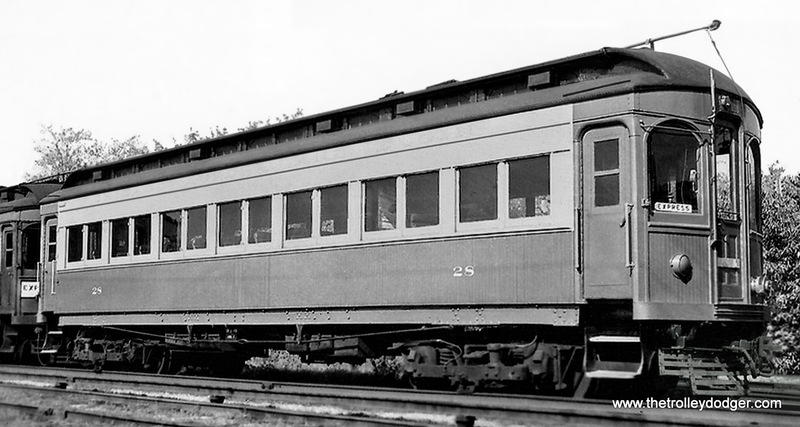 CA&E Car 52 (Stephenson, 1902). Some of you have a device called a Magic Jack to make telephone calls using your home computer. But as many of our readers know, this blog also has a “Magic Jack” all of its own. Today’s post features the work of Jack Bejna, whose pictures have been featured here many times previously. He loves finding old photographs and works his own brand of magic on them, making them look better using Photoshop. We thank him for sharing these great images with our readers. The comments that follow, in this section, are Jack’s. Just to keep a hand in, we also have a few additional photos of our own that follow. Here are a few shots of the yard at Laramie Avenue. 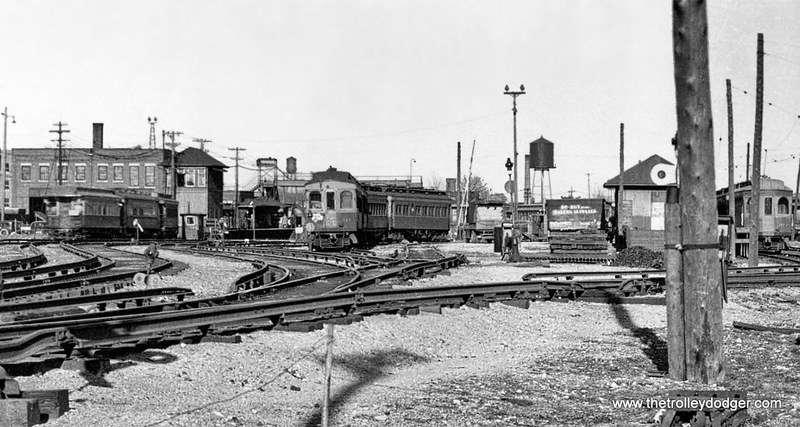 The first shows the yard looking east with the freight shed at the right, and at the left a CTA train heads west. 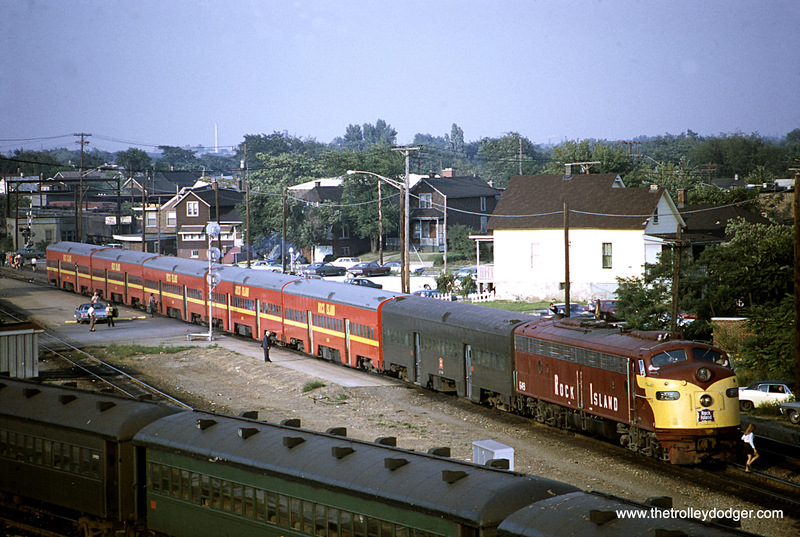 The second shot features a CA&E train heading west (not sure but looks like a motorman in the front window). 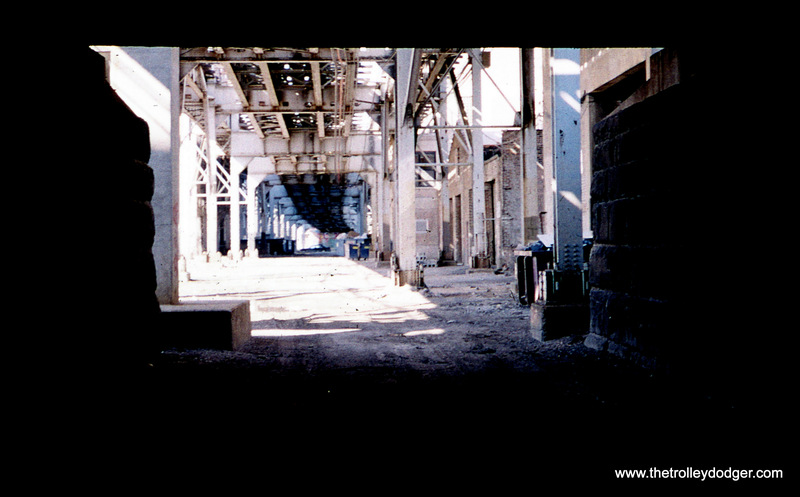 The third shot is at the freight house looking west. 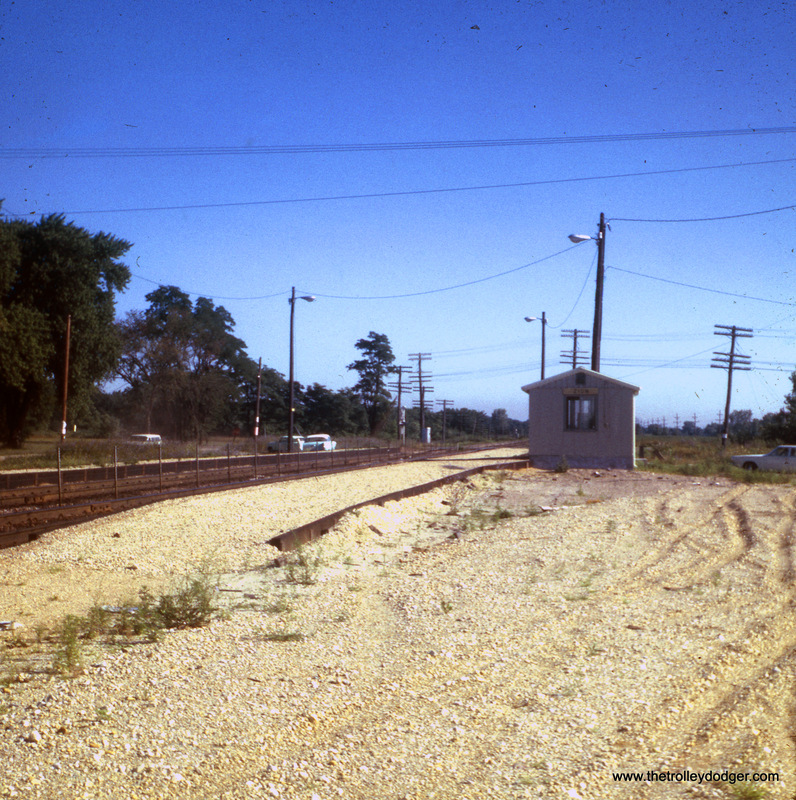 The tracks in the foreground were used to store CA&E trains when not needed, and many photographs of CA&E cars were taken at this location through the years. 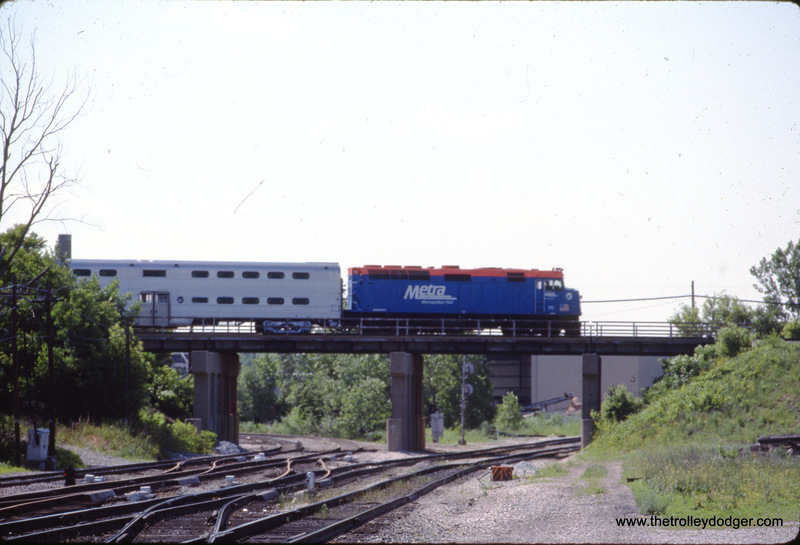 The fourth shot shows a CA&E freight at Flournoy Street heading west. In the background can be seen the mid-day storage tracks for CA&E cars. CA&E Lockwood Yard at Laramie. 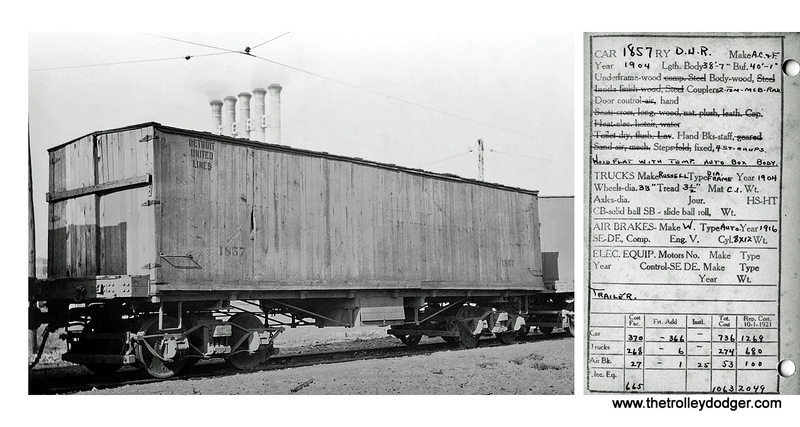 CA&E Laramie Ave freight house. 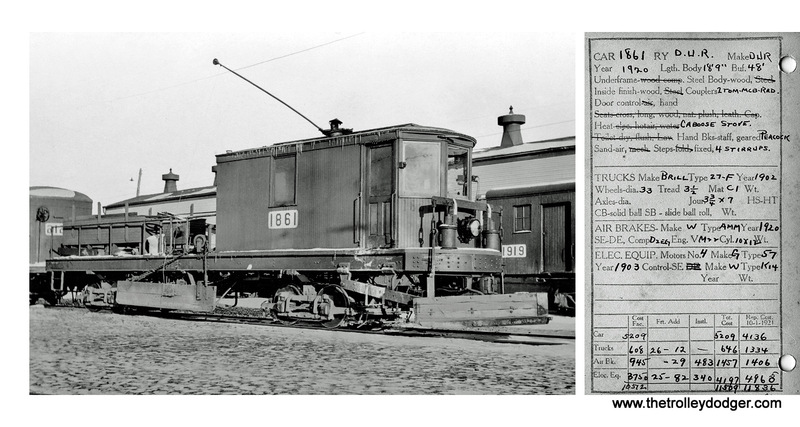 CA&E 7 at Flournoy Street, Laramie Yard. 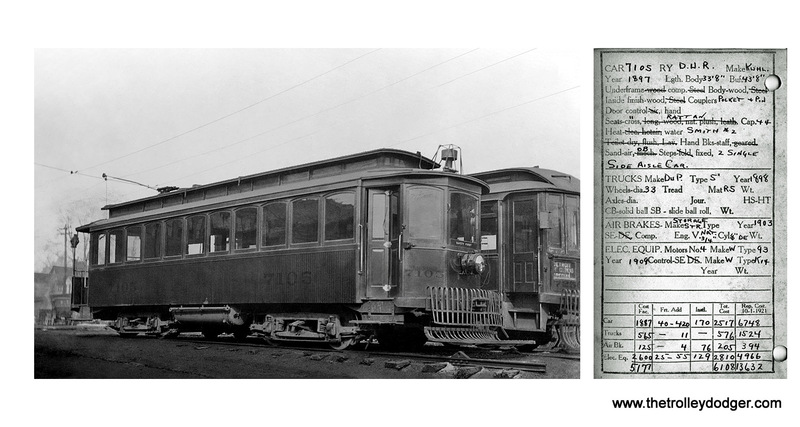 CA&E car 18 (Niles 1902), plus cars 44 and 423. 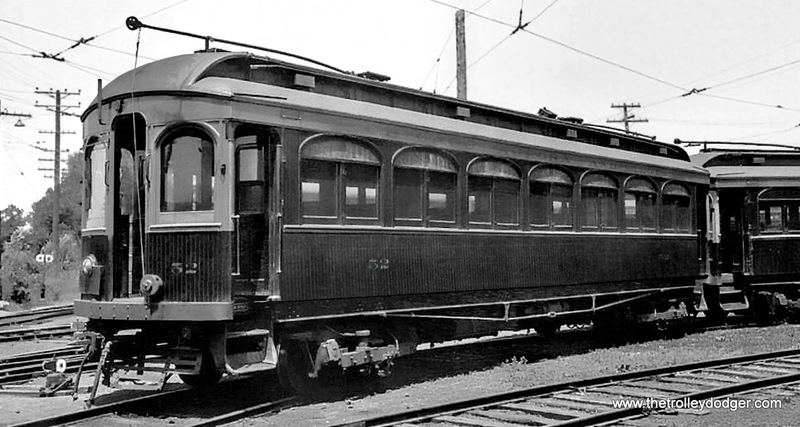 CA&E car 24 (Niles 1902). 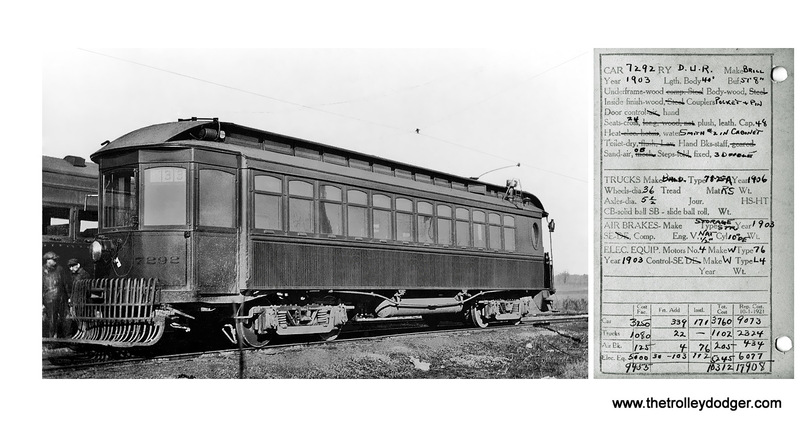 CA&E car 26 (Niles 1902). 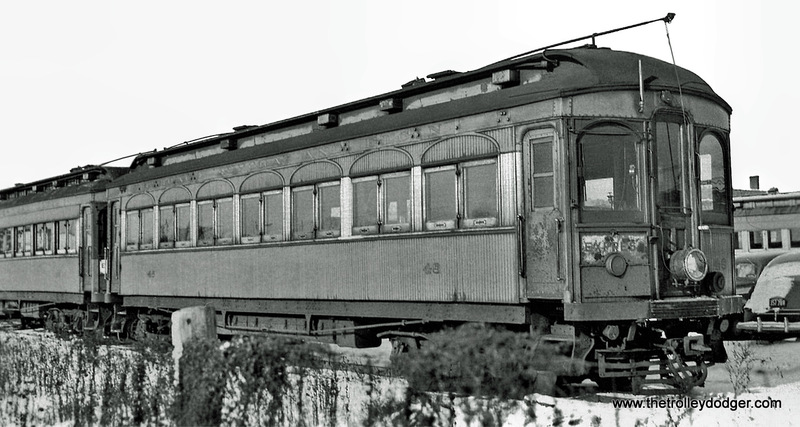 CA&E car 28 (Niles 1902). 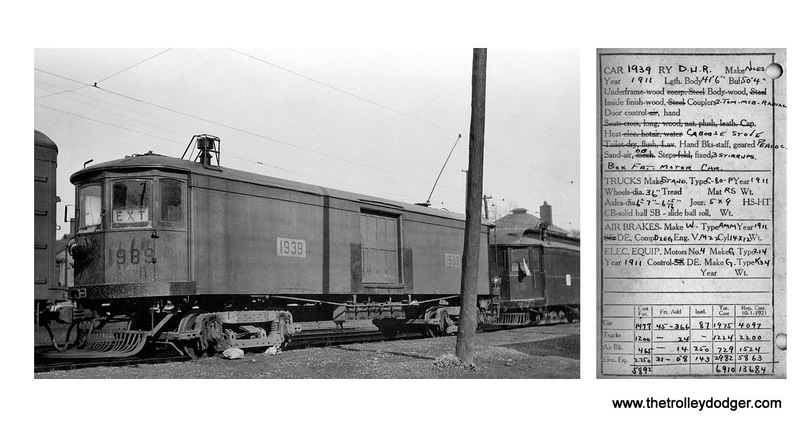 CA&E Car 34 end view (Stephenson, 1902). 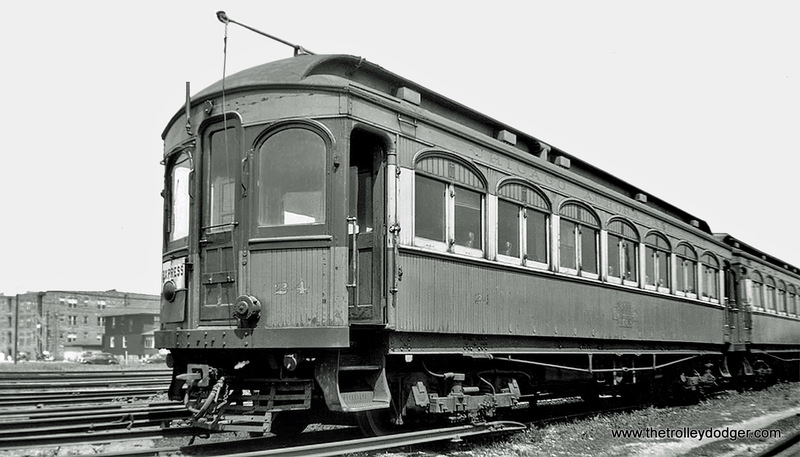 CA&E Car 34 (Stephenson, 1902). 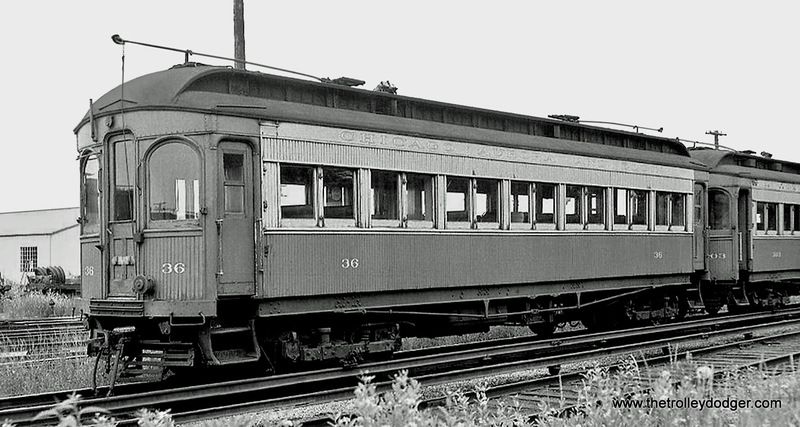 CA&E Car 36 (Stephenson, 1902). 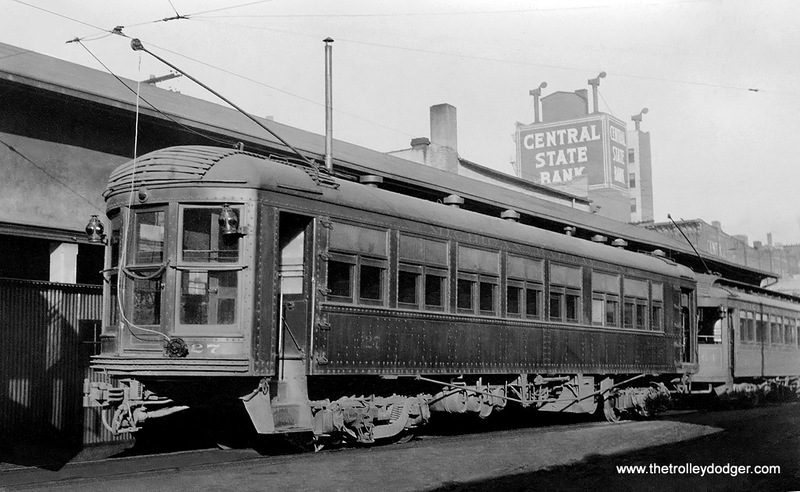 CA&E Car 48 (Stephenson, 1902). I believe that all of these pictures were taken in or near Jackson, Michigan. 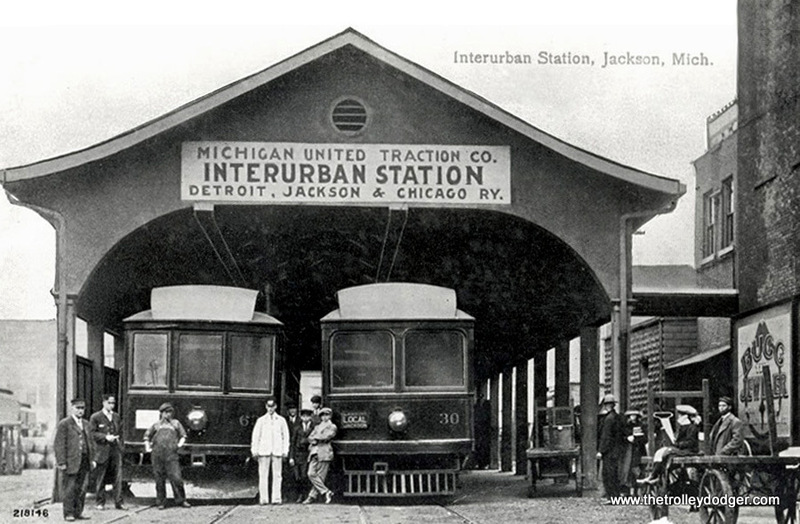 The Jackson depot is lettered Michigan United Railways in one picture, Michigan United Traction Comapny in another, and the cars are lettered Michigan Railway Lines, all as a result of several changes of ownership of the Detroit Jackson and Chicago lines. Also included is a map of downtown Jackson. 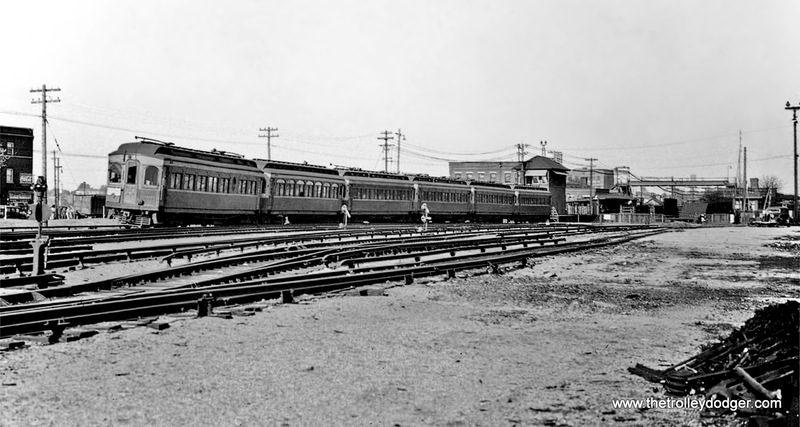 Michigan Railway Lines – Car 1. 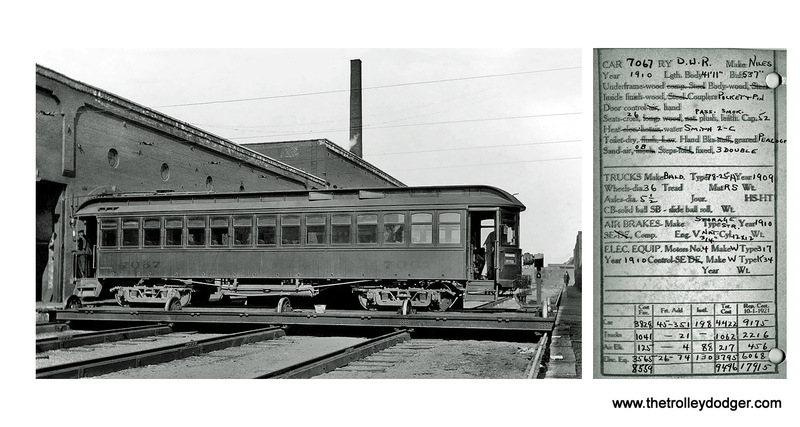 Michigan Railway Lines – Car 2. 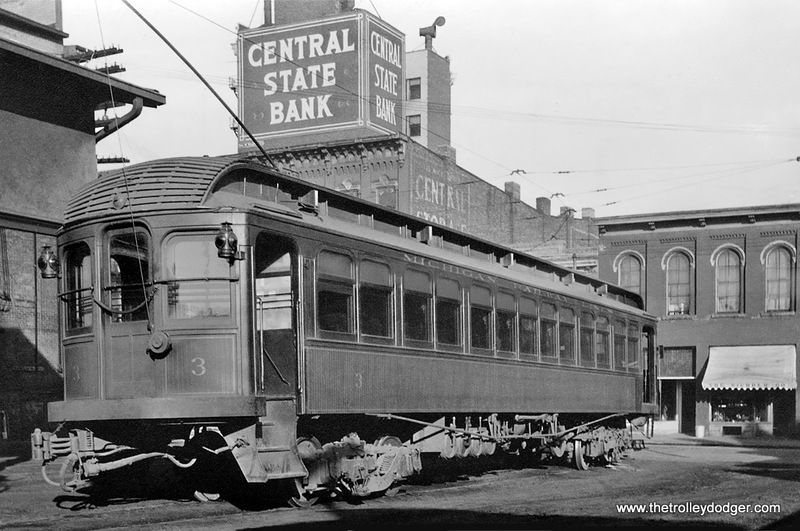 Michigan Railway Lines – Car 3. 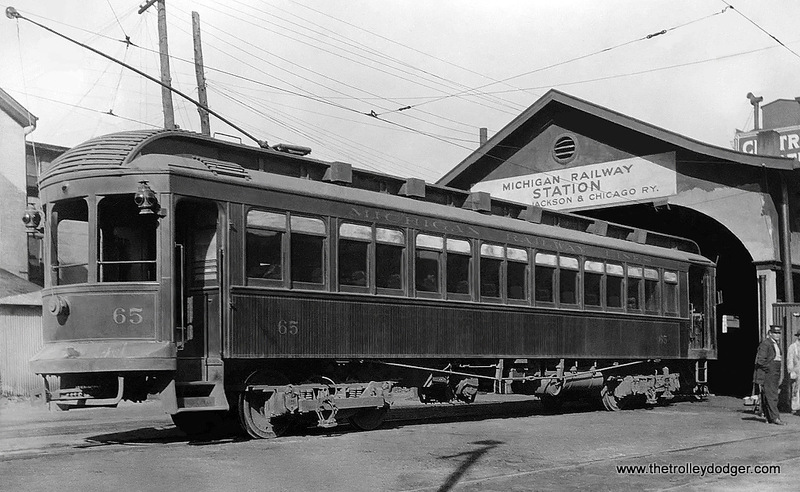 Michigan Railway Lines – Car 16. 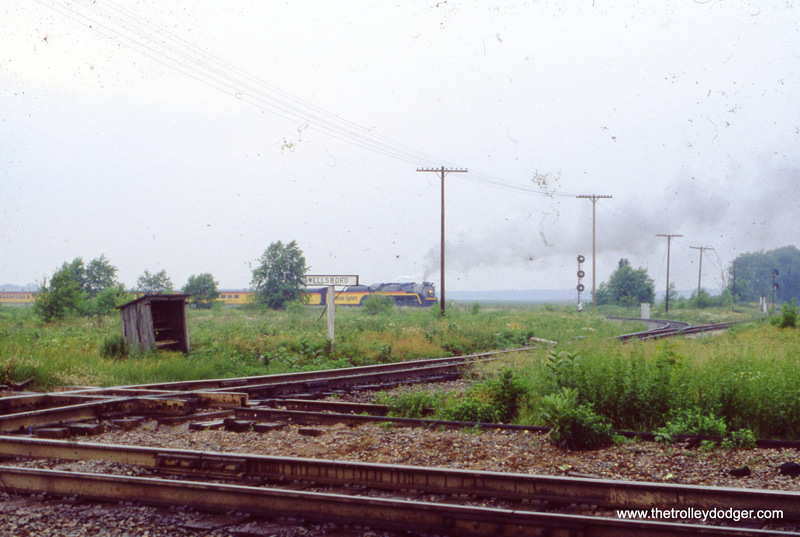 Michigan Railway Lines – Cars 27 and 64. 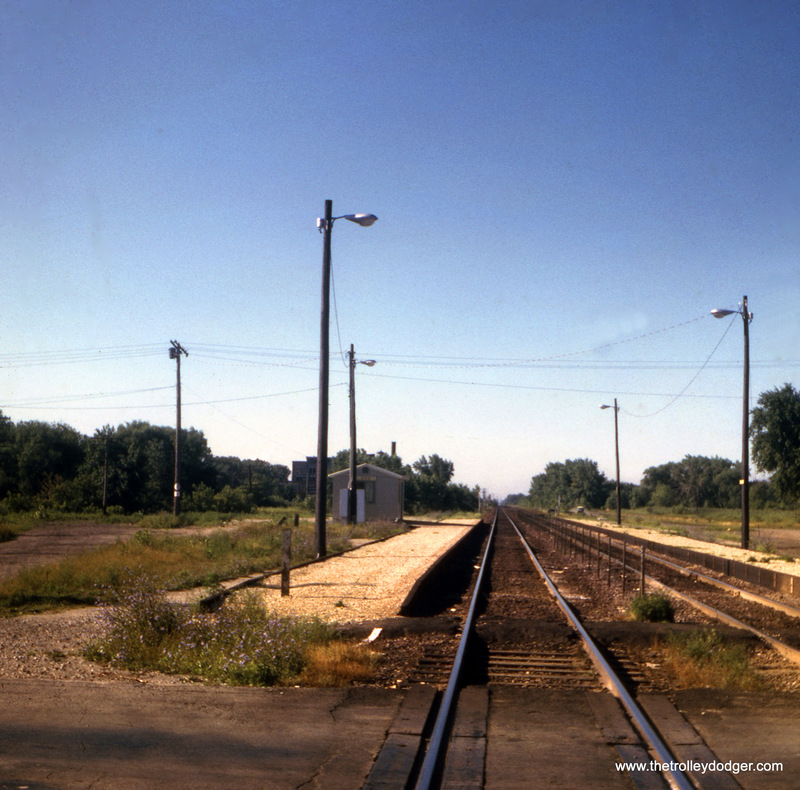 Michigan Railway Lines – Car 65. 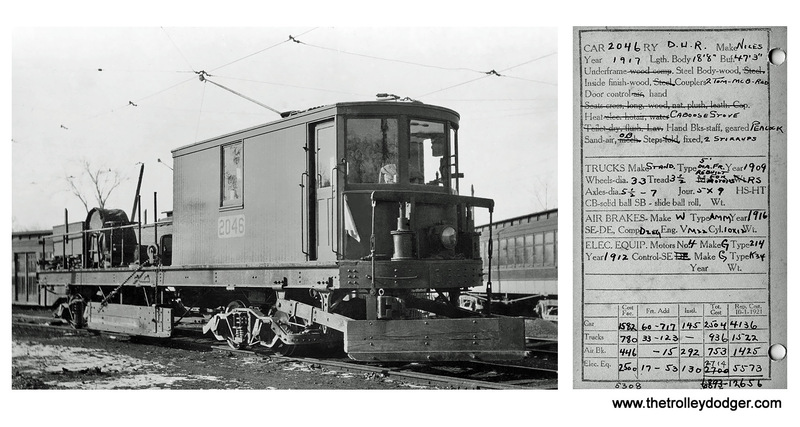 Michigan Railway Lines – Car 85. 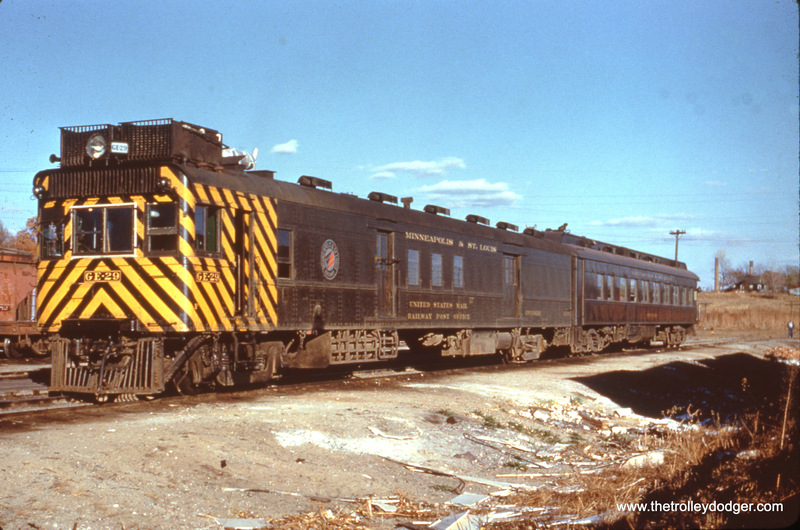 Michigan Railway Lines – Car 647. Some years ago a friend of mine told me that her uncle had died and left a lot of railroadiana behind, and I could have a look and take anything I wanted. 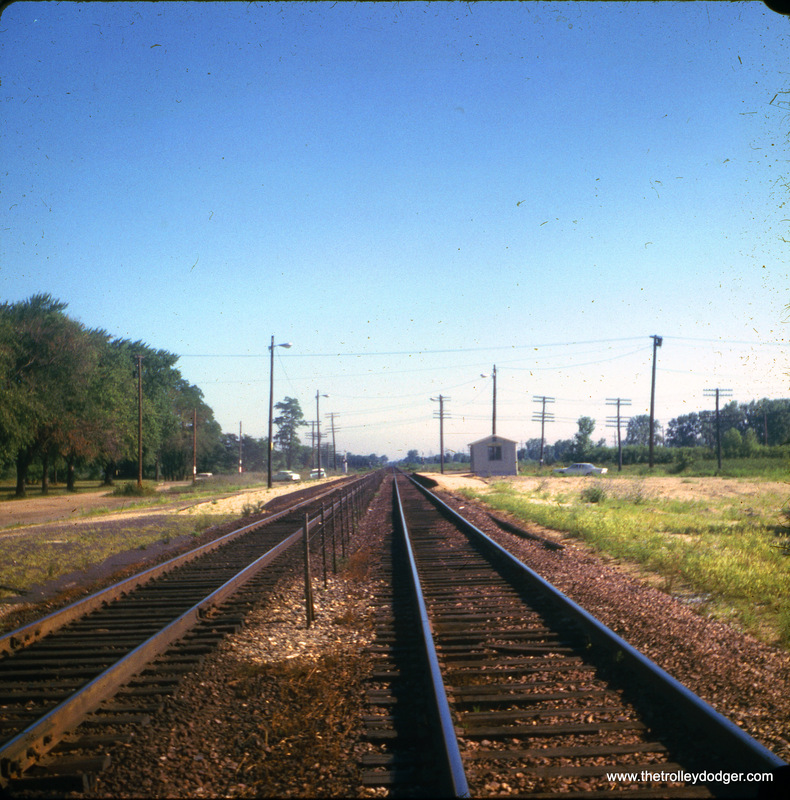 Most of the stuff was not worth anything but I did come across two small (4”x 6”) two ring binders that were full of Detroit United Railways and Michigan Interurban equipment photos. 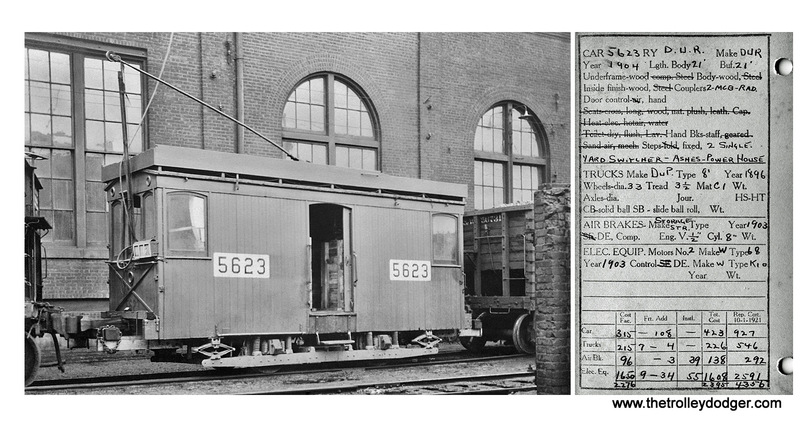 The DUR photos had in-depth tech specs on the photo back for the particular car pictured. The pre-printed tech spec info form was dated: Rep cost 10-1-1921. 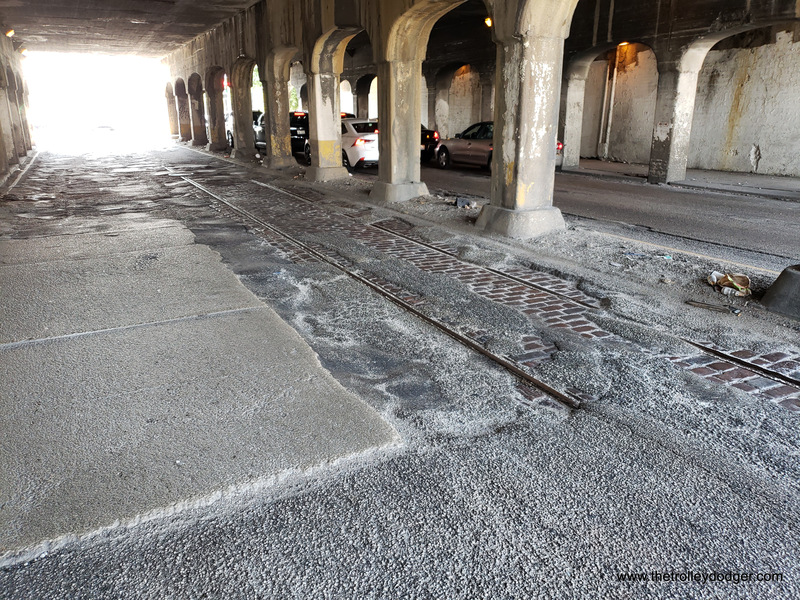 I believe these photos were part of an audit for an upcoming fare increase request. I therefore believe that the photos were taken circa 1921. I kept the binders and several years ago I started scanning them and Photoshopping them when I had time to spare. The quality of the pictures (i.e., exposure, lighting, etc.) varies but there are a number that are fine following a lot of Photoshop work. 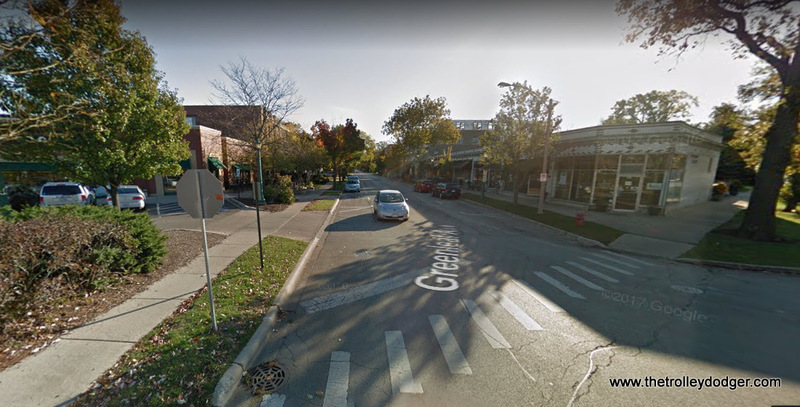 Most of the photos don’t include the location where the photo were taken, and, since I’m not familiar with Michigan towns and cities, I don’t have any idea where the pictures were taken, with some exceptions. 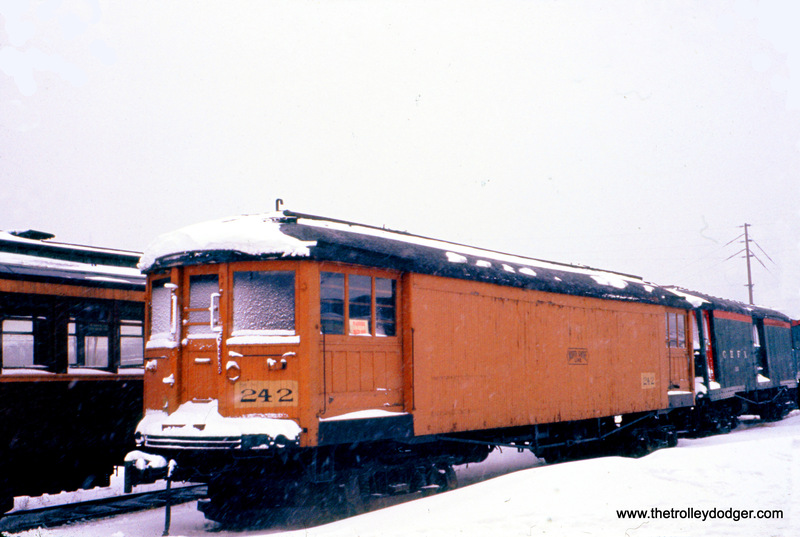 CTA wooden “L” car 1024 at the Illinois Electric Railway Museum in North Chicago, February 1960. 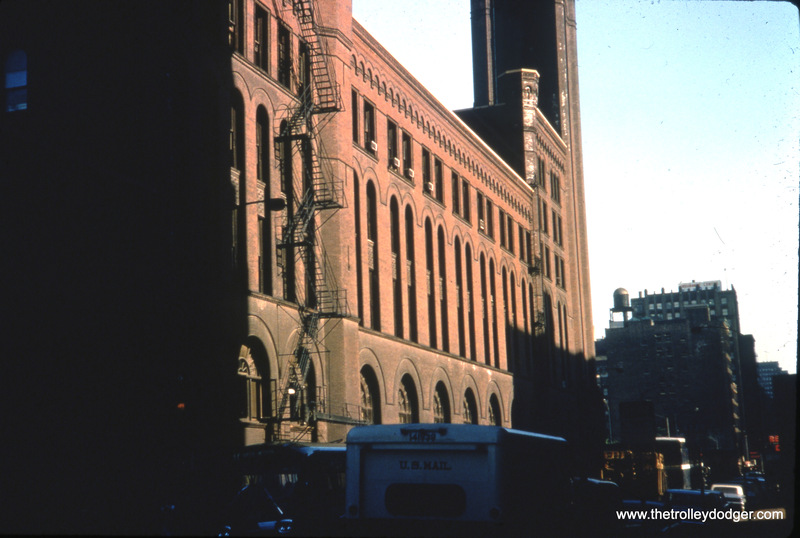 The original museum location was at the Chicago Hardware Foundry Company, adjacent to the North Shore Line tracks. 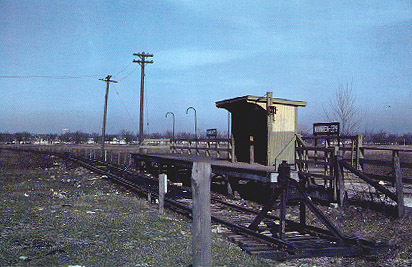 Some of the wooden “L” cars were operated under their own power to North Chicago. 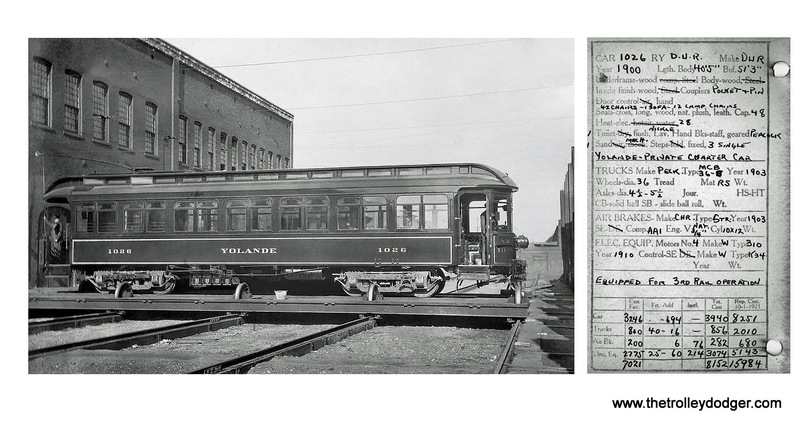 This car, originally built by Pullman in 1898 as Northwestern Elevated Railroad 24, has since been restored to its original condition at IRM in Union. 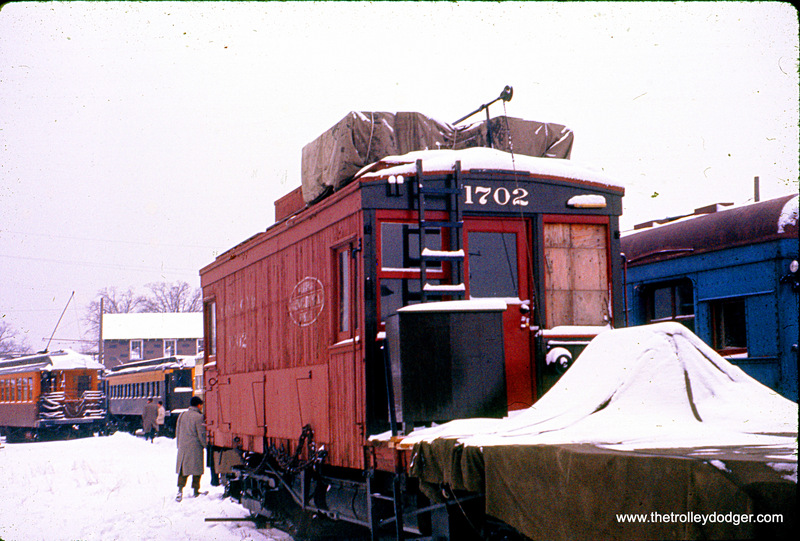 Illinois Terminal Railroad line car 1702, built by that operator in 1922, at North Chicago in February 1960. 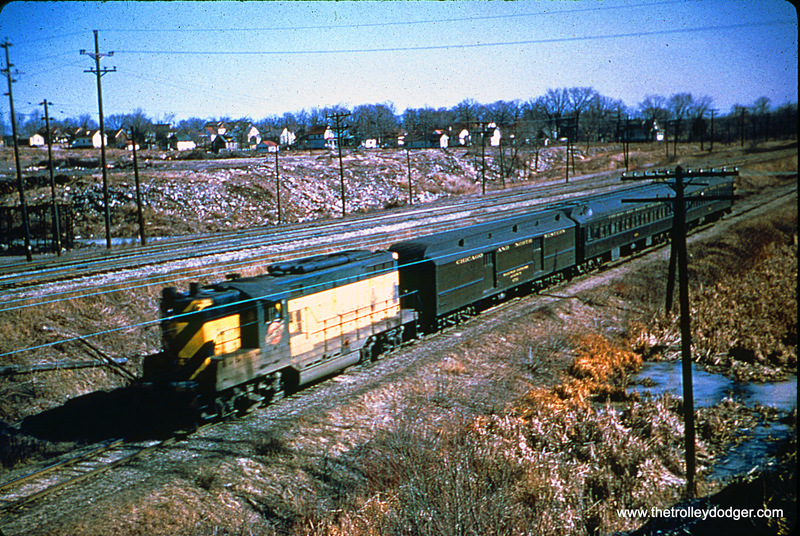 Illinois Terminal car 101 at IERM in North Chicago in February 1960. 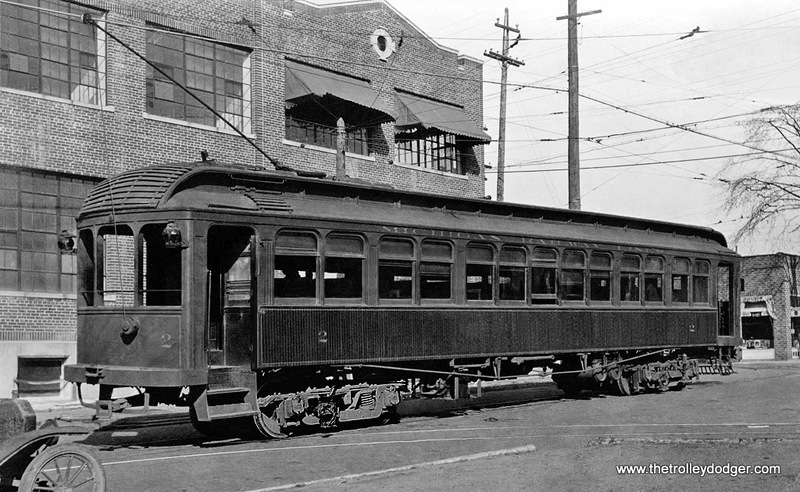 Don’s Rail Photos: “101 was built by American Car in 1917 as AG&StL 61. 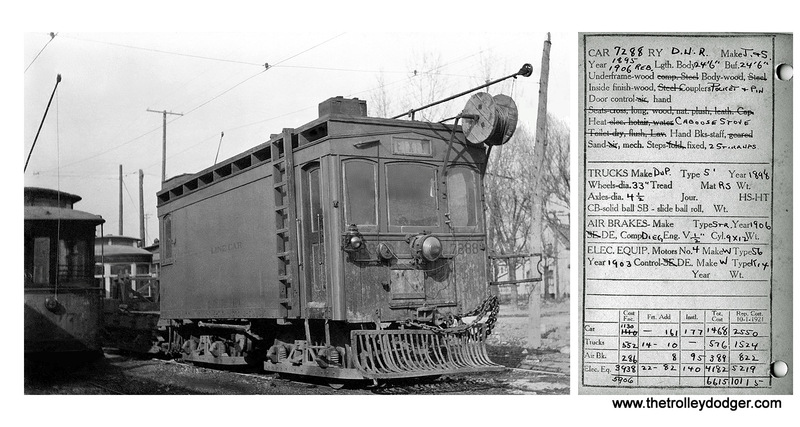 In 1926 the car became StL&ARy 61 and in 1930 it became IT 101. 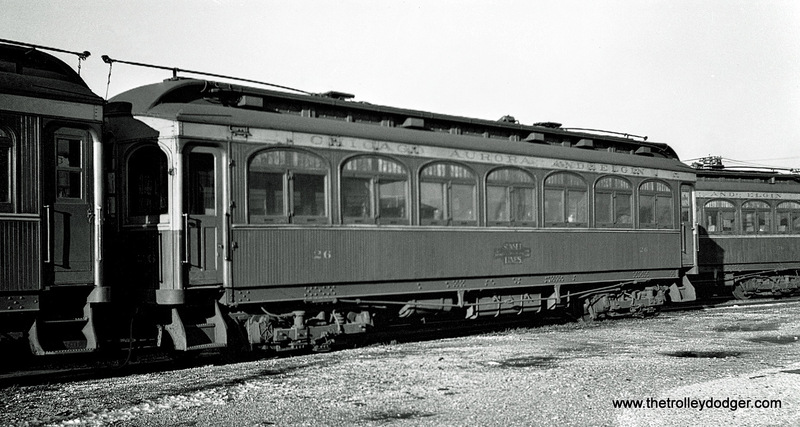 On March 9, 1956, it was sold to the Illinois Electric Railway Museum and is now at Union, IL.” This car ran between St. Louis and Alton. 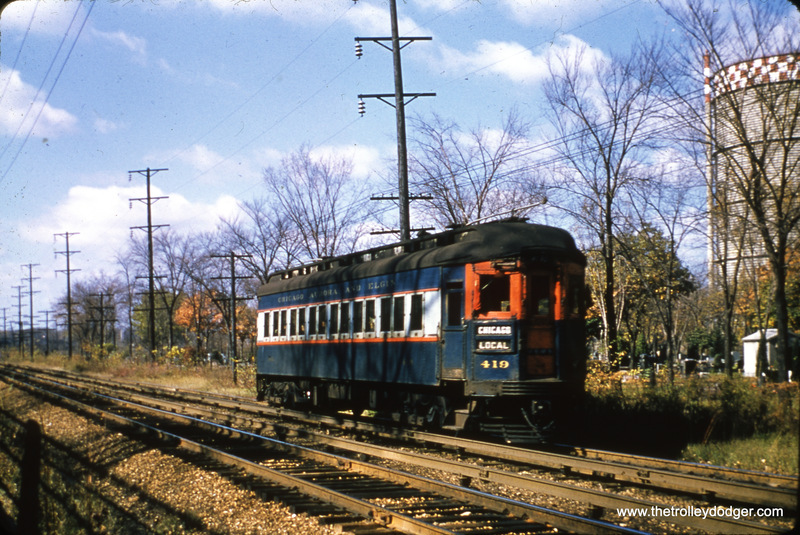 Chicago Aurora & Elgin car 419 is eastbound west of DesPlaines Avenue in Forest Park in November 1951. The gas holder, at right, was a local landmark for many years. 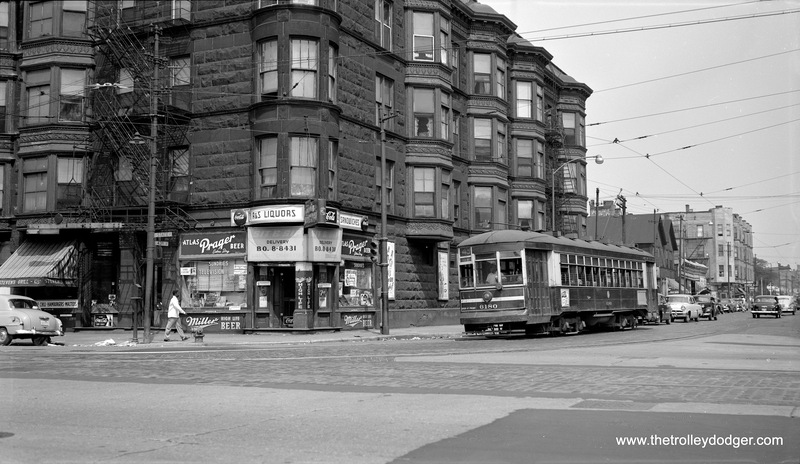 This photo appears to have been taken on Clark Street across from Lincoln Park during one of those late 1950s Chicago streetcar fantrips (possibly October 21, 1956). I thought this one was interesting, since the man at left may very well be noted railfan William C. Hoffman, whose films and slides are now part of the Wien-Criss Archive. I realize this is not the greatest quality picture, but it does appear to show the late Bill Hoffman shooting film using a tripod to steady his camera. Dorothy and Bill were twins. They were born on May 15, 1910. 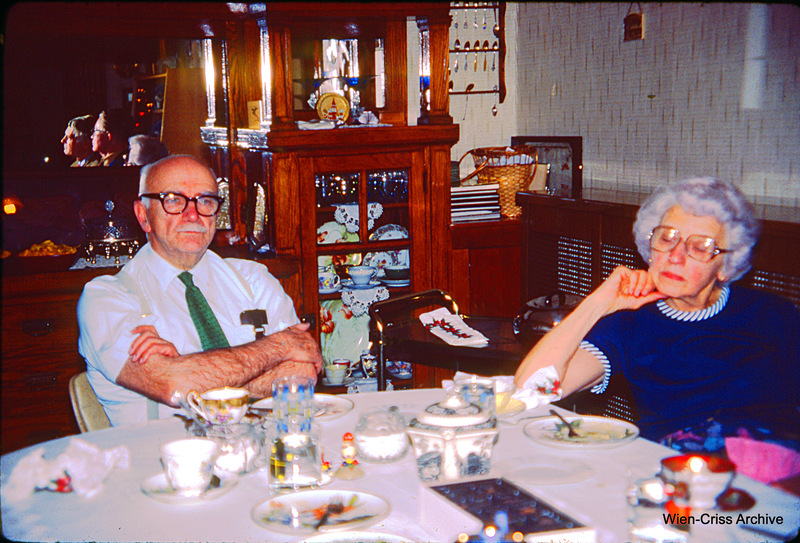 Bill was 78 when he died (July 5, 1988) and Dorothy was 88 when she died. Dorothy died on May 10, 1999, five days short of her 89th birthday. Dorothy was a wonderful person. 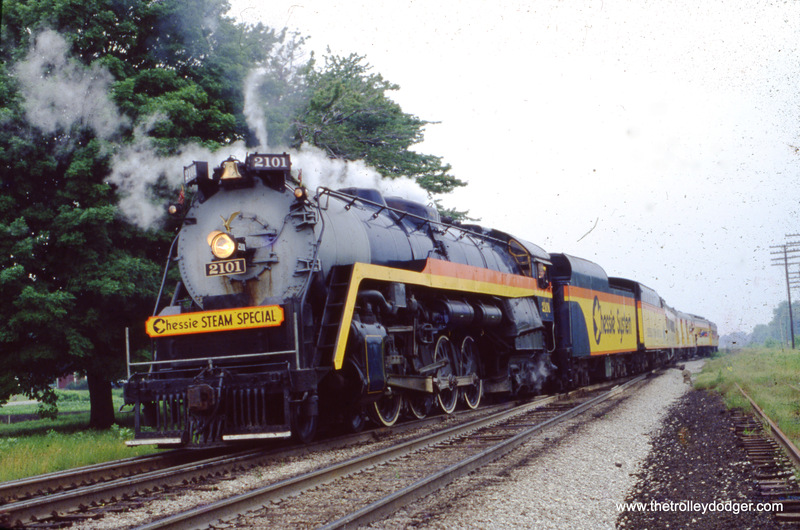 Very generous in her donations to the Illinois Railway Museum in Bill’s memory. She funded the Hoffman Garage and other motor bus related projects. Dorothy donated over $800,000 to IRM, mostly motor bus related. 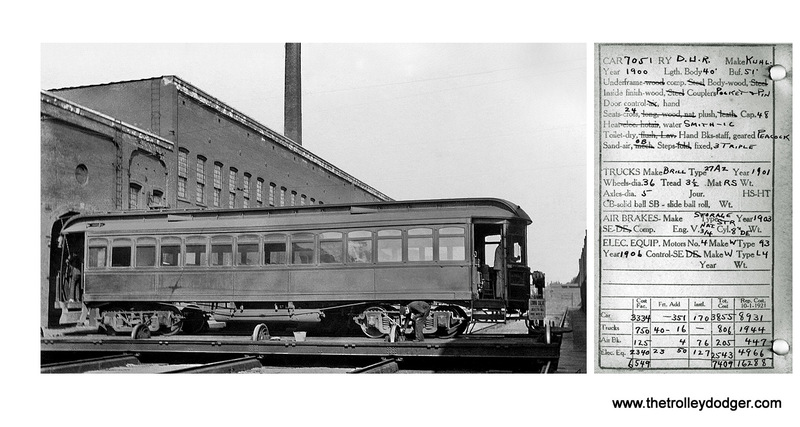 Don’s Rail Photos says that North Shore Line car 231 “was built by Cincinnati in May 1924, #2720, as a merchandise despatch car. It was rebuilt as a plow in 1949.” That’s the configuration we see it in here. It does not appear to have been saved. 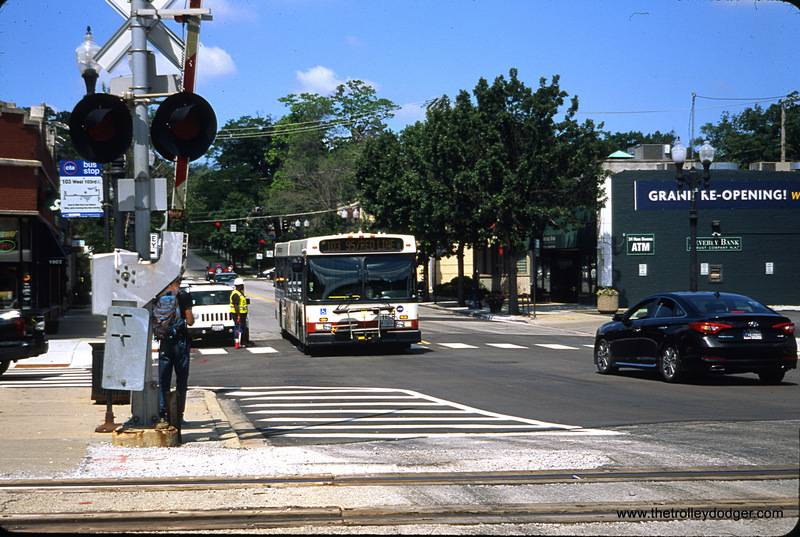 This interesting scene shows North Shore Line car 413 (and train) turning off street running on Greenleaf Avenue in Wilmette on the Shore Line Route, which uit in 1955. The building at right is still standing. The same location today. We are looking east. 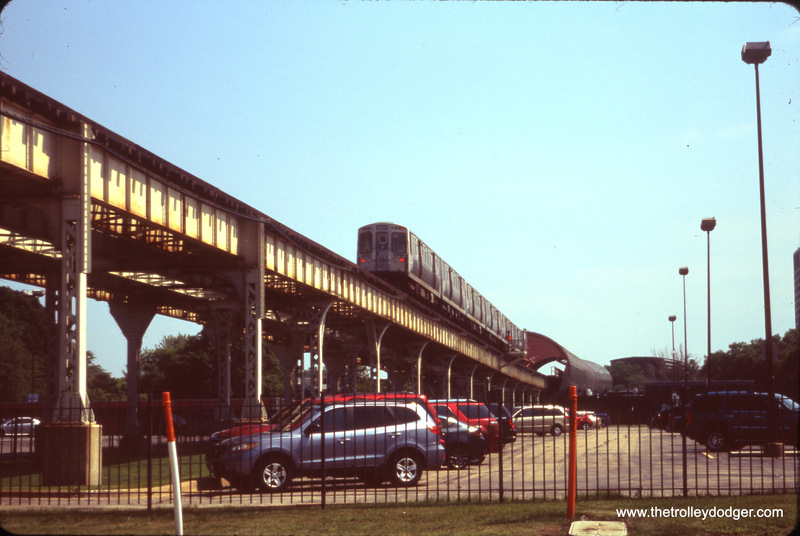 North Shore Line cars turned into what is now the parking lot at left, before running north parallel to the Chicago & North Western tracks. 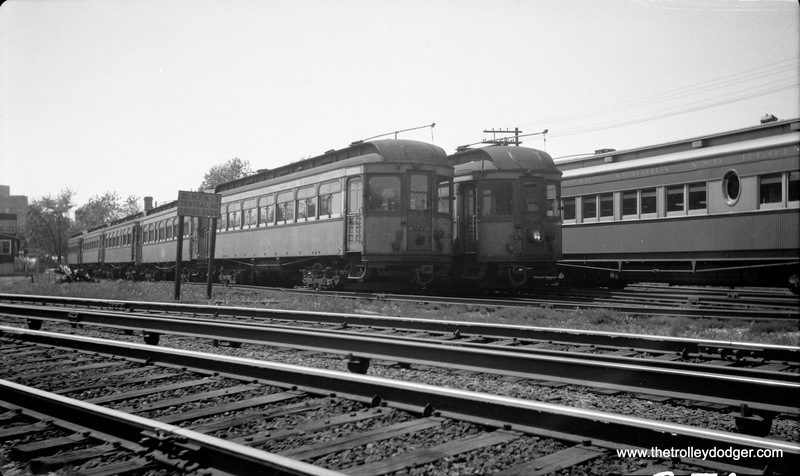 Lehigh Valley Transit 812 is shown running a special at Souderton PA on May 14, 1951. 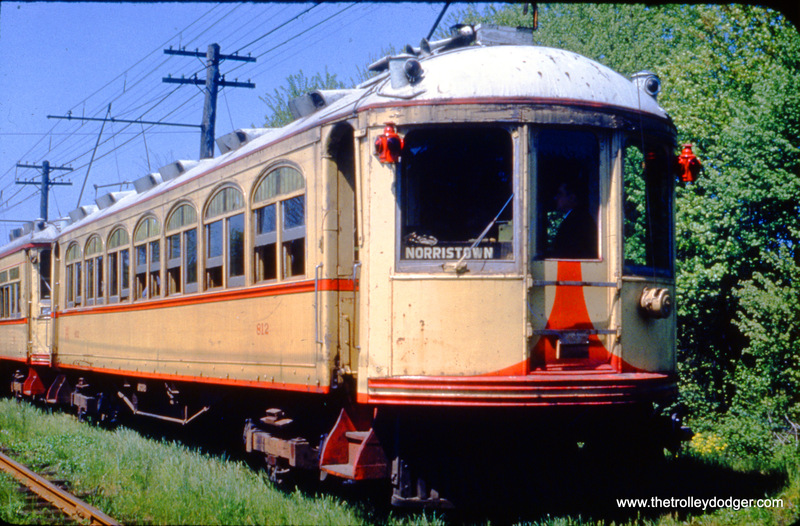 Service on the Liberty Bell interurban ended in September 1951, and unfortunately, this car was not saved. 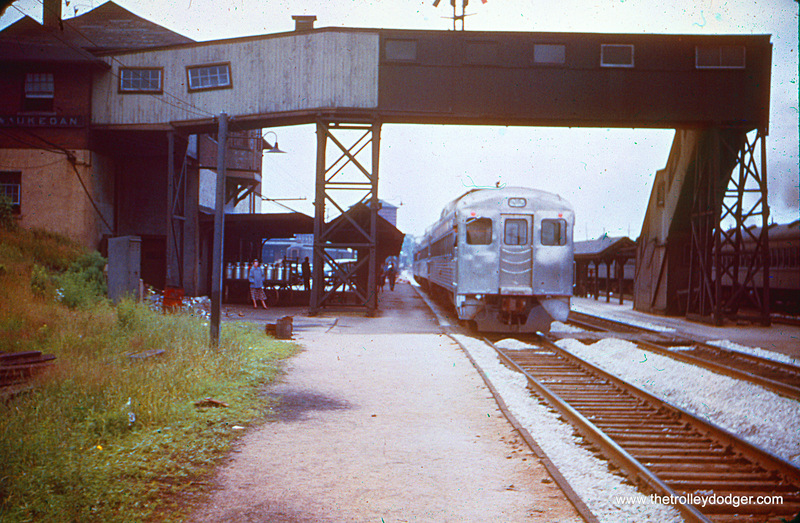 Chicago Aurora & Elgin wood car 301 at the Wheaton Yards on July 8, 1955. 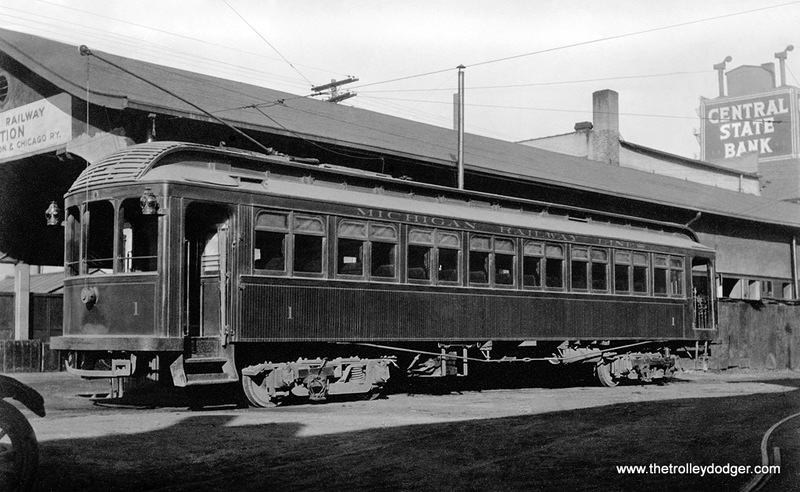 Don’s Rail Photos: “301 was built by Niles Car & Mfg Co in 1906. 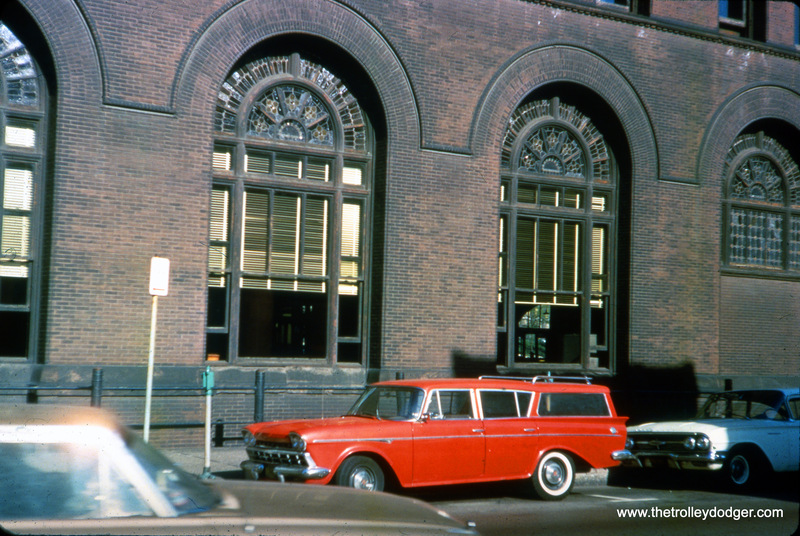 It was modernized in December 1940.” As part of this modernization, the car’s stained glass windows were covered up. Unfortunately, this car was not saved. 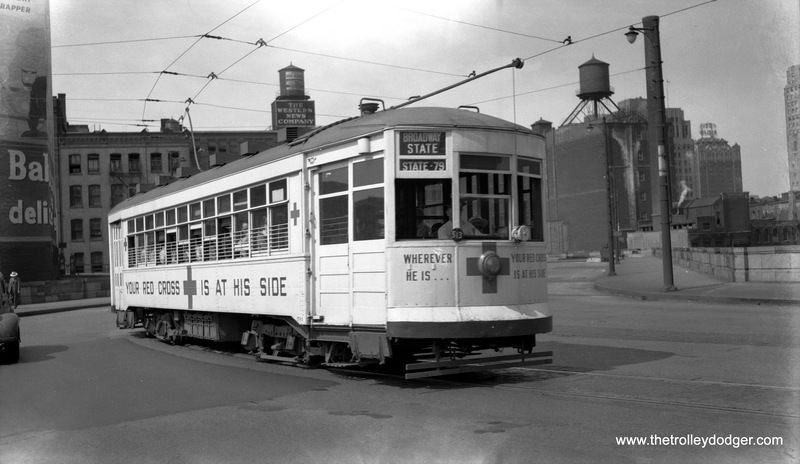 The Chicago Surface Lines decorated several of its streetcars for patriotic purposes during World War II, but here we see 1741 postwar on March 19, 1946, promoting the American Red Cross. 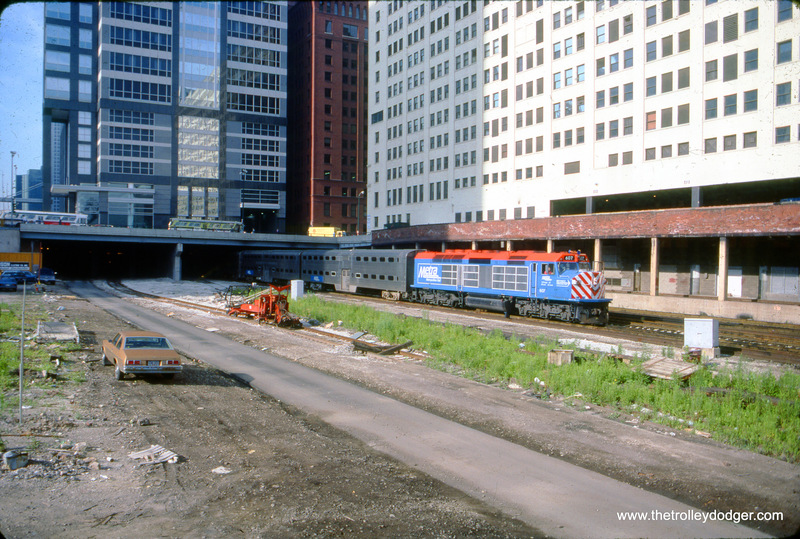 I believe this southbound Broadway-State car is operating on Wabash just north of the Chicago River, as the new State Street bridge did not open until 1949. 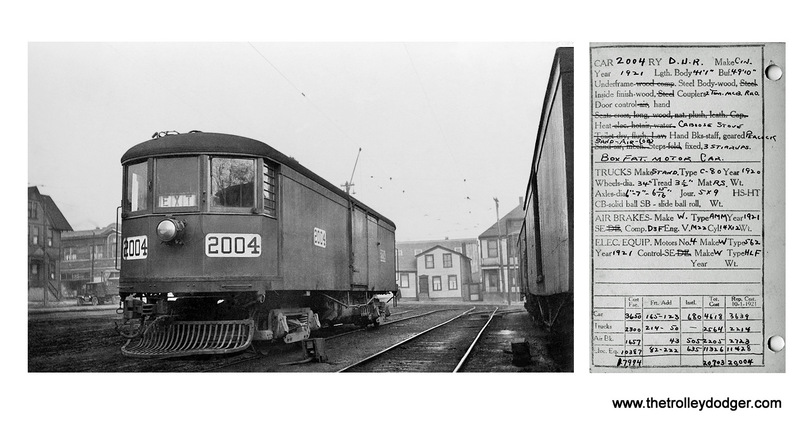 Philadelphia Transportation Company 2023 was one of only three “Brilliners” in its fleet. 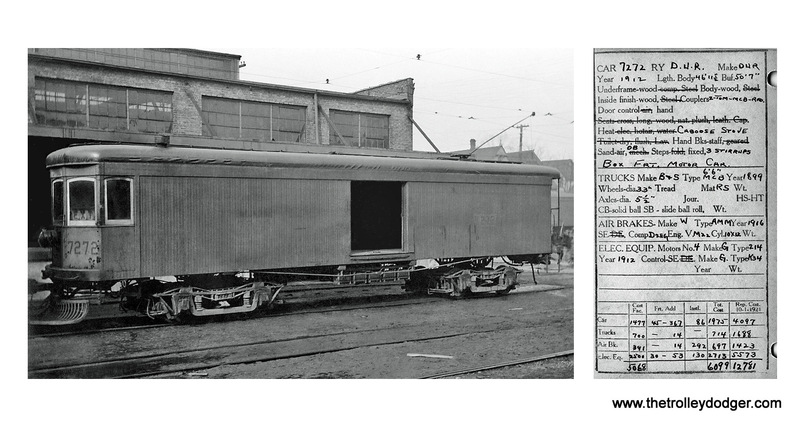 Don’s Rail Photos: ‘2023 was built by Brill Car Co in April 1939, #23763-006. 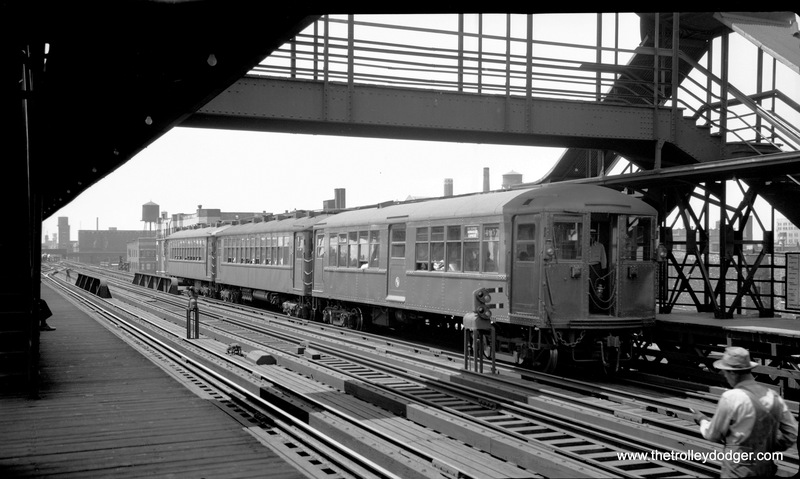 It was scrapped in August 1956.” Presumably PTC did not purchase any additional Brilliners, as it considered them inferior in some ways to PCC cars. 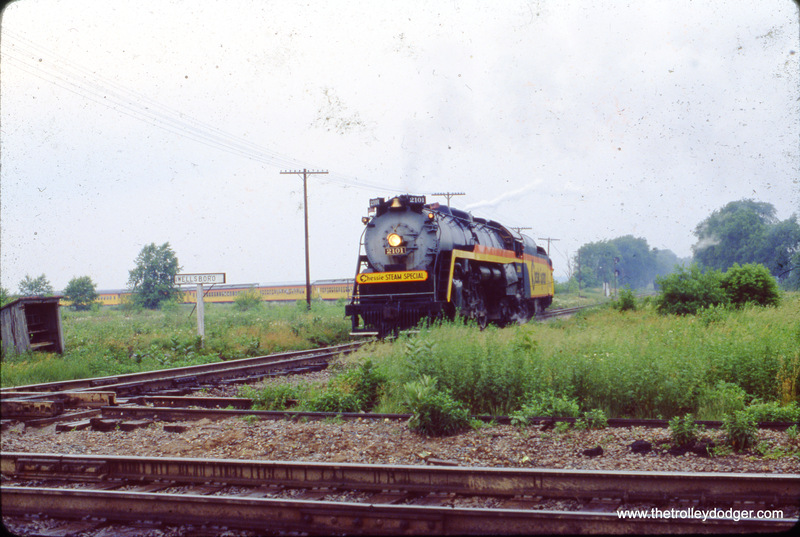 Here we see 2023 at an unknown location on July 23, 1950. 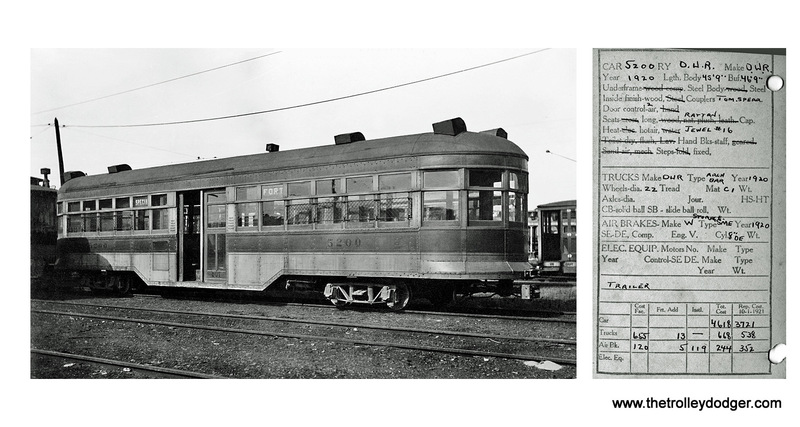 Jeff Wien adds, “The Philadelphia Rapid Transit Company, predecessor to PTC, purchased three Brilliners (2021-2023) in 1939. 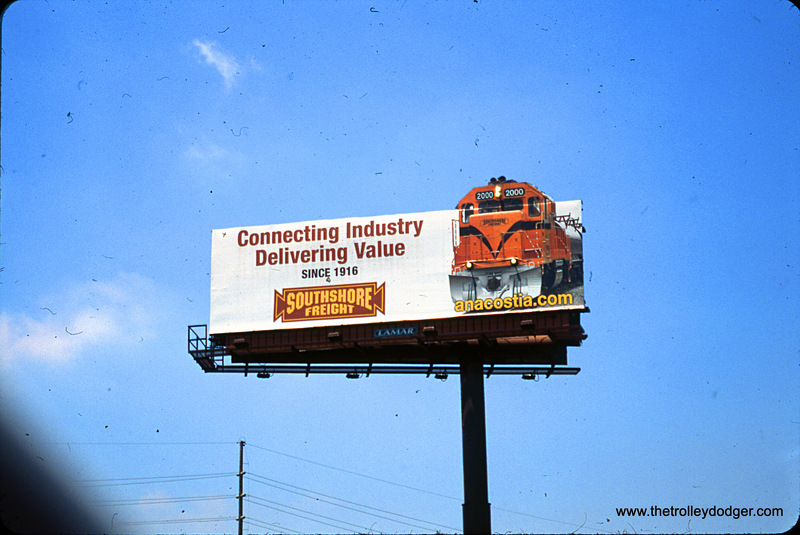 Thus, PRT/PTC owned more than one Brilliner. I have seen the attached photo in various sites on the internet. 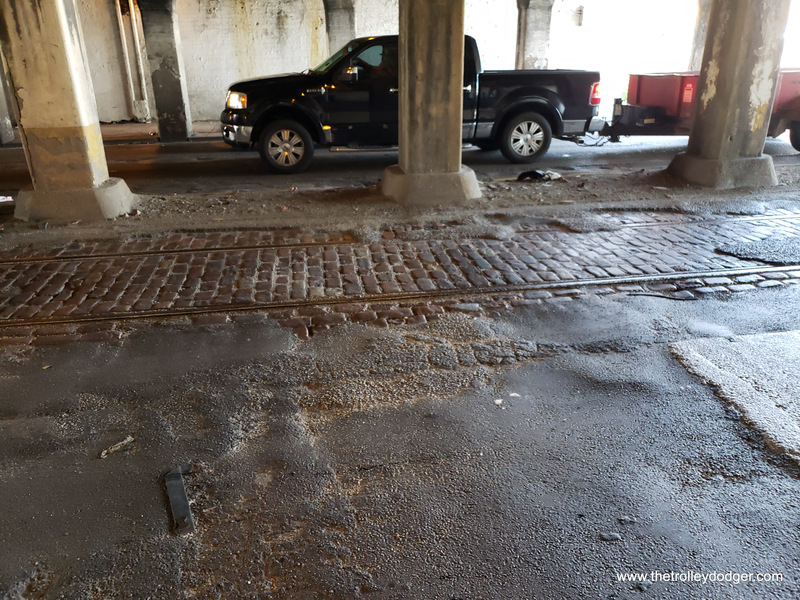 The photo shows a Lake Street train which apparently failed to stop at the Market Street terminal at Madison Street and ran through the bumper at the end of the line, derailing the first car which hangs over the edge of the structure. I thought the purpose of the bumper was to prevent a train from running beyond the end of the line, but it apparently didn’t work too well in this case. 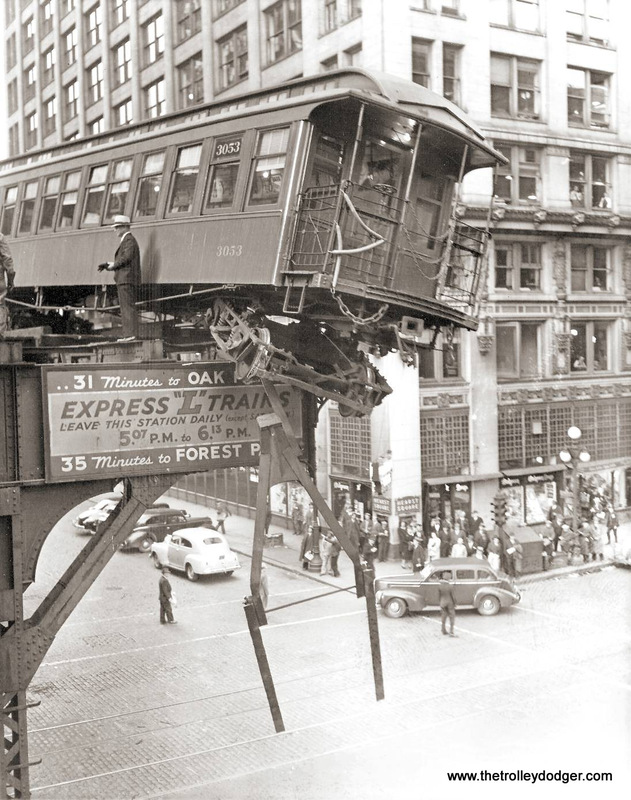 The date would appear to be the late 1930s or 1940s (pre-CTA), but I have not found any information or newspaper articles describing what happened. I assume that means there were no deaths or injuries. It could even have been an empty train. Do you have any information about this? I continue to enjoy your blog — keep it up! Other early retirements are all shown as “fire”, so not likely. 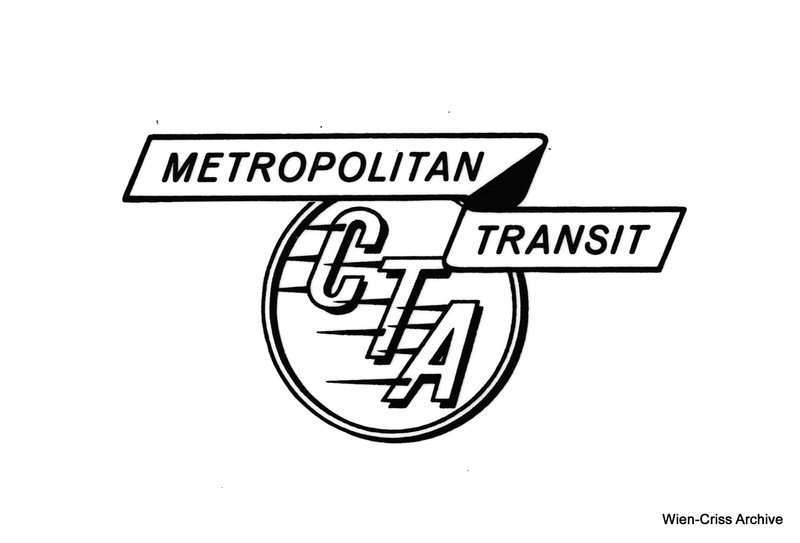 However, there were about a dozen cars that CTA retired in 1948 which were apparently in wrecked or burned condition before 10/1/47 but still on the books that were simply written off without any actual scrapping dates recorded. Lake St cars on this list were trailers trailers, so not likely. 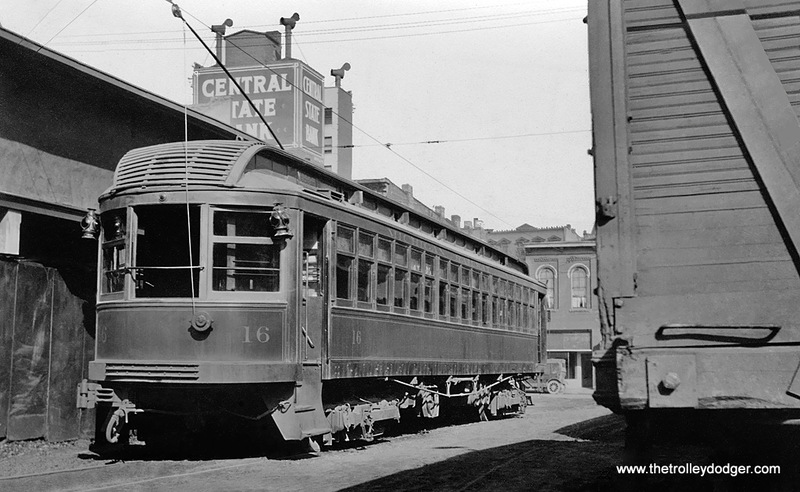 As far as Market St service, it was thought that three AM trains circled the loop and then backed into Market St. This is not correct. Three trains left Austin at 656, 709, 727AM making all stops to Hamlin, then Oakley and all stops to Madison/Market and laid up. There might have been additional layups coming off the loop, however. Then they left between 507 and 613PM (6.5 to 12 min headway, so more than three trains) making all stops to Oakley, then Hamlin and all stops to Forest Park. Sorry, I thought the photo would come across. 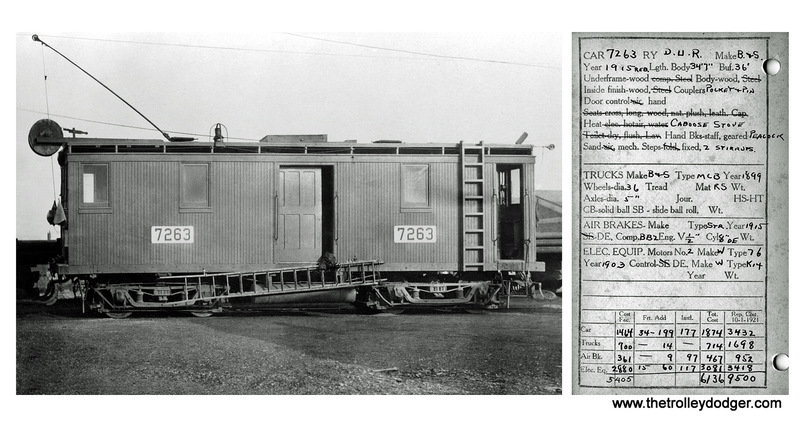 At any rate, it does look like a trailer, and the number is 3053, although it desn’t appear to be wrecked, really. The picture certainly does look like the 1940s, though. Well, this explains a lot. 3053 lasted until 4/51, so it certainly survived. Also, it was not a control trailer, so the motorman was at the other end of the train, backing in, and overshot his stopping point. It is at the Flood Control Barrier (one can see track goes single immediately right of PCCs) on the 55 line and within ‘eye+sight’ of E. Pittsburgh, except for the curve in the road!!! 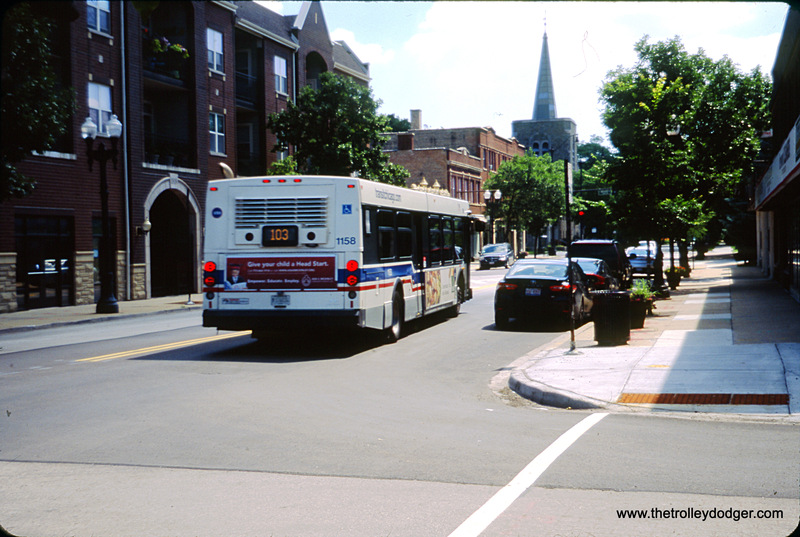 It is worked by an extended 65-line: Lincoln Place (loop on 56) to Homestead Loop on 8th. 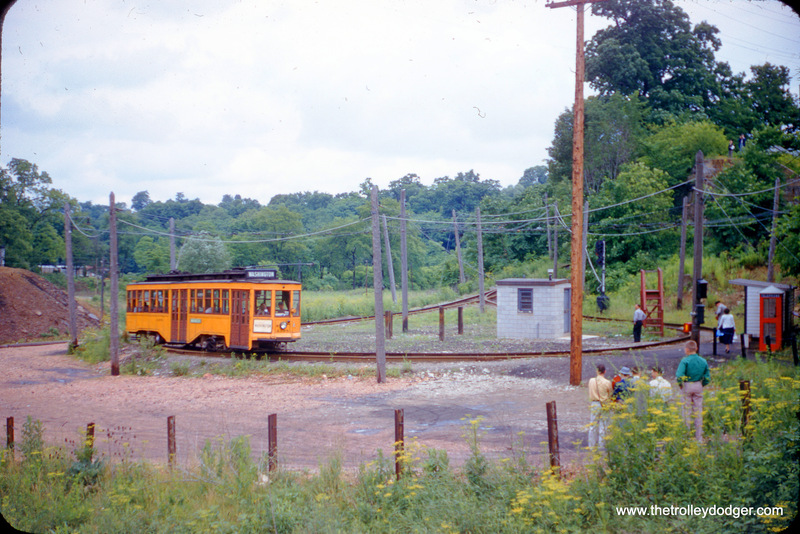 The 65-line loop in Homestead (also shared by former 60-line shuttle to East Liberty) was just west of Rankin Bridge. 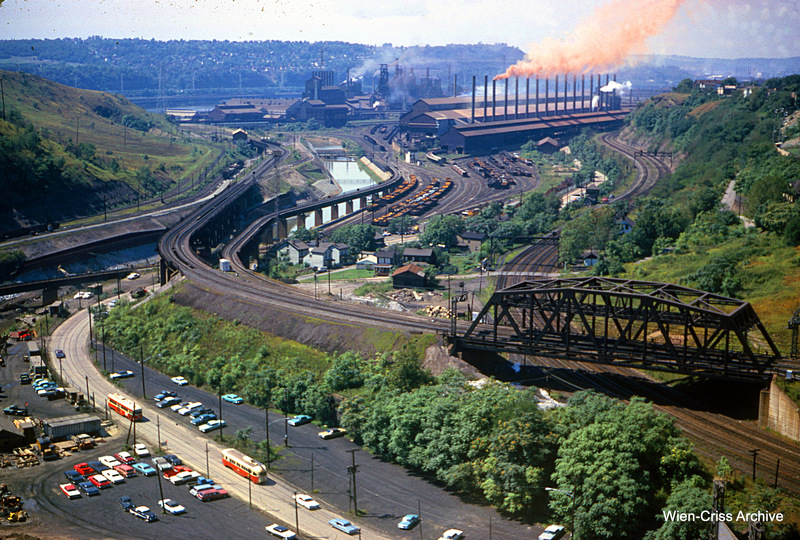 The 55-line shared track with 65 thru Homestead on 8th between Amity and 60/65 Loop and beyond to Rankin Bridge which 55 crossed to East Pittsburgh. 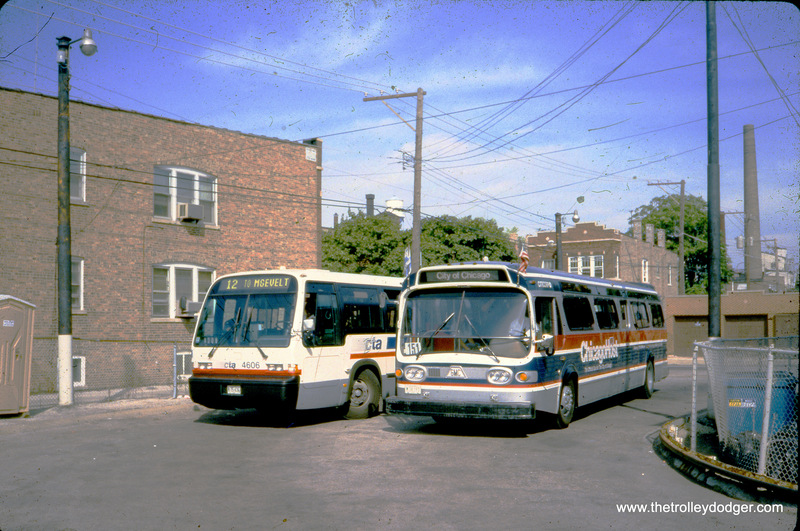 Thus, with demise of 55, the 65 was extended from Homestead to E. Pittsburgh for ‘some time.’ The 60/65 line loop in Homestead was used by the 55A, a rush Hour tripper To/From downtown Pittsburgh. 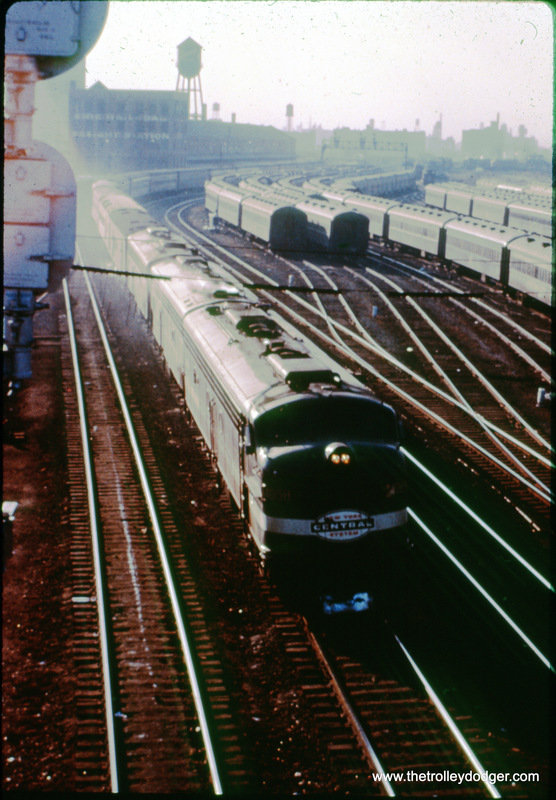 The Carlson PCC book Coast To Coast lists both 65 and 55 as ending on the same date, 5 September 1965. A note in the table (Pgs168-169) indicates: “ Hays to Pittsburgh (including 57) abandoned 04 Jul 1964 balance [worked by extended 65 abandoned] by PAT modernization on [09 Sep] 1965.” Thus It Seems the 65 line was extended for 1 year plus two months. Many are not aware of this. I have pictures distinctly signed 65 also distinctly working the 55. 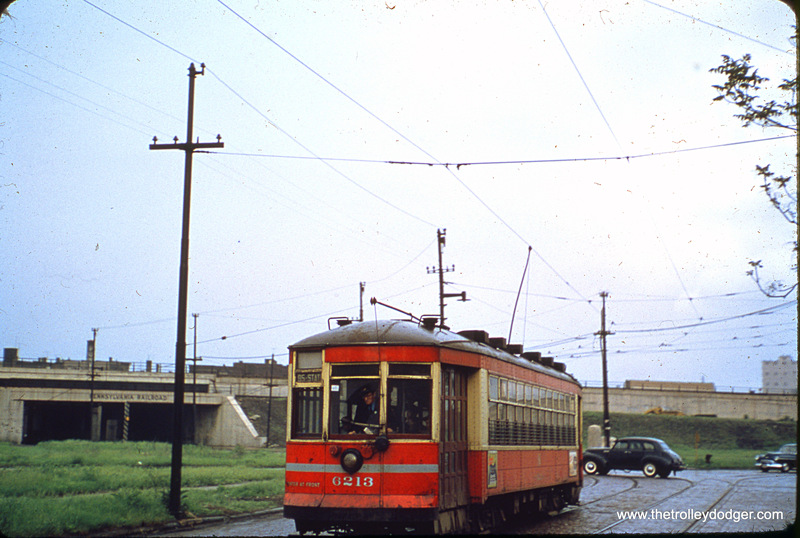 I do not know if the extended 65 used the old dedicated loop in East Pittsburgh which was not quite in “downtown E. Pittsburgh”. 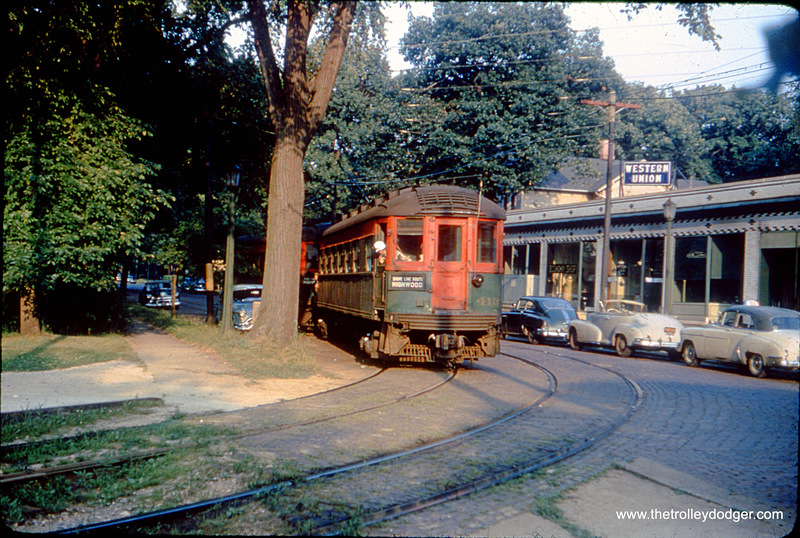 The 65 line may have looped in E. Pittsburgh proper on Braddock to Electric, Linden, Beech and Braddock. What a wonderful website! Thank you for all the information I was able locate about the CA&E! 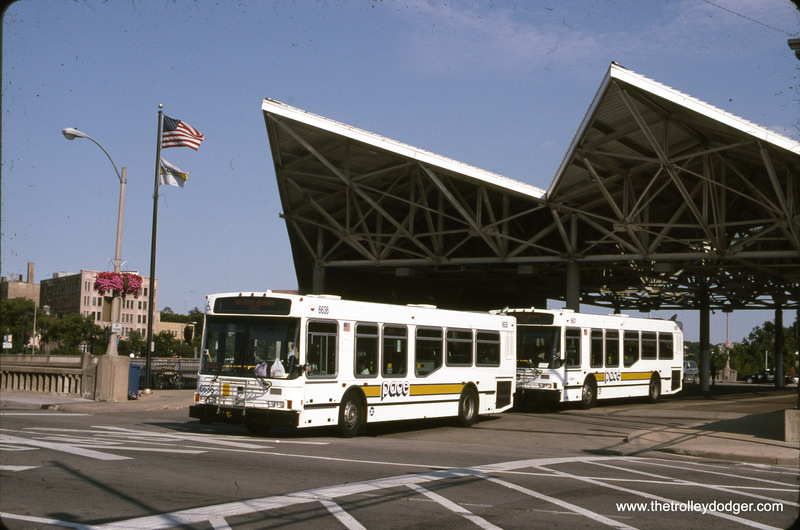 I am looking for any photo of the last stop at Mannheim & 22nd Street on the Westchester branch. 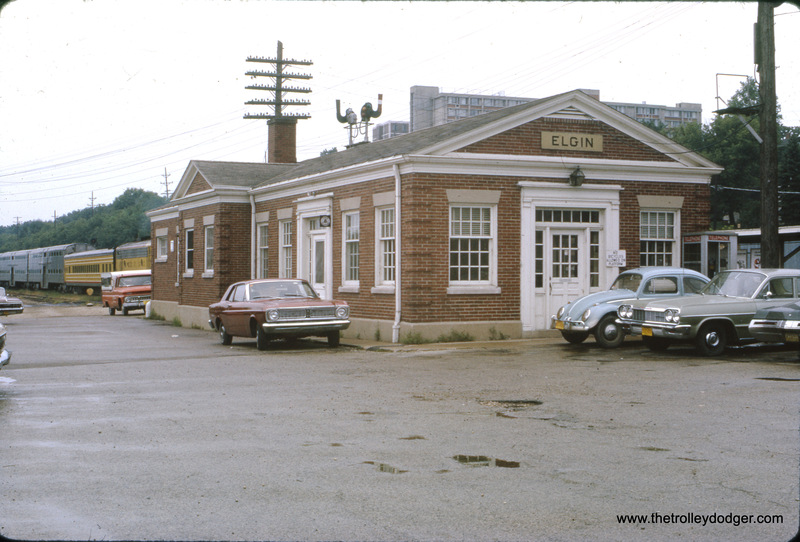 My uncle lived in Wheaton on Electric Avenue. He somehow acquired the station signage from that last stop, and I have yet to confirm that the sign that I now have, as being from that end of line stop! Is there someone in your organization that might be able to confirm its existence with a picture of said sign? It’s a 14″ x 7′, deep blue with white block lettering, reading, MANNHEIM-22nd. Would appreciate any information to find its true history! 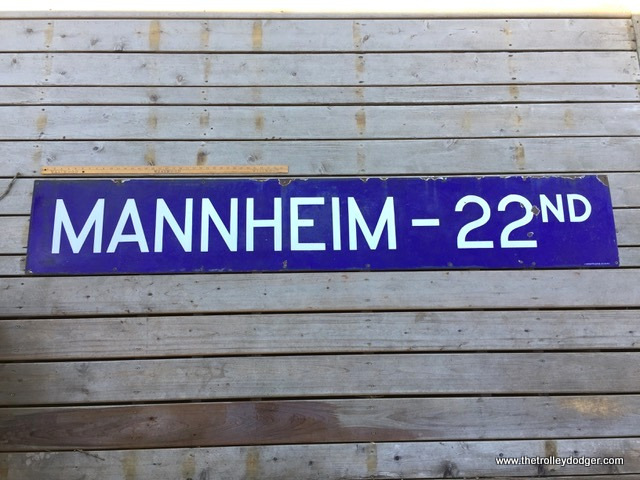 I saw the photo of the sign that reads “MANNHEIM 22nd STREET” in the latest Dodger. I don’t think it’s authentic at all. 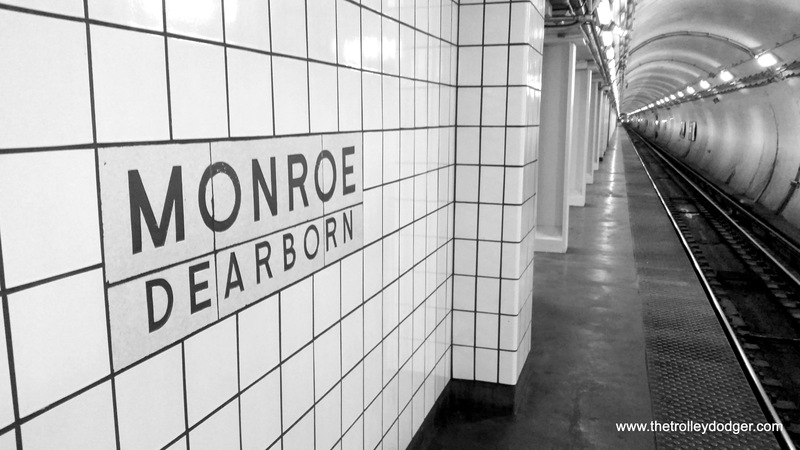 The type is way too contemporary, and doesn’t match anything else the “L” did as far as signs. Including the photos with the two signs at the platform. The blue is way too light as well. 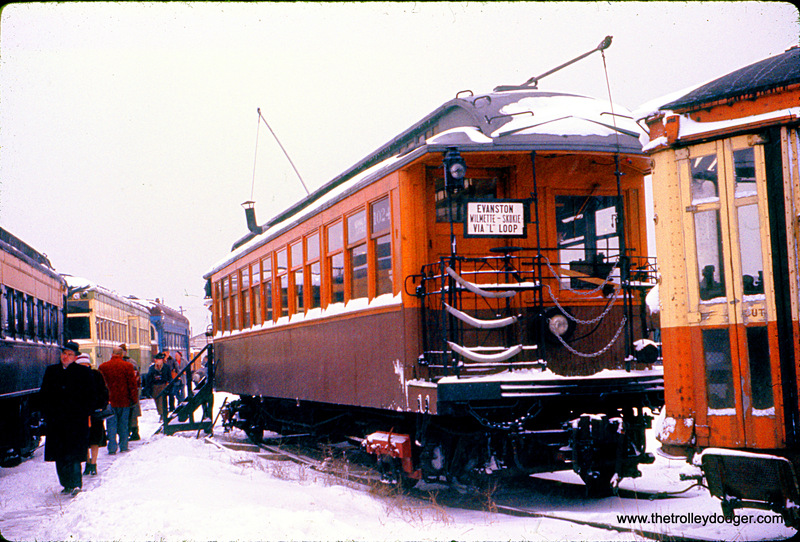 Thanks for the kind comments and the forum to share my photographic efforts with the interurban/streetcar community. It’s nice to know that someday when I’m gone my collection will have been shared with the electric railroad enthusiasts that remain. 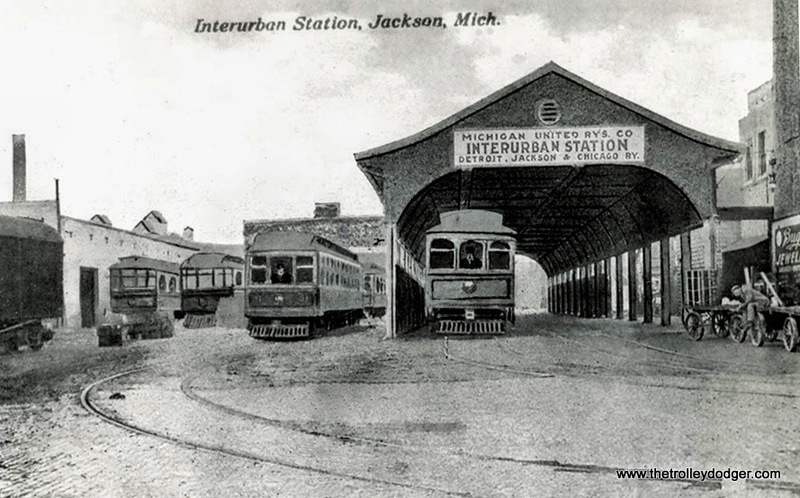 There are more Detroit United Railway photos to be posted as well as photographs from the Michigan interurbans that vanished long ago so stay tuned to this great blog! 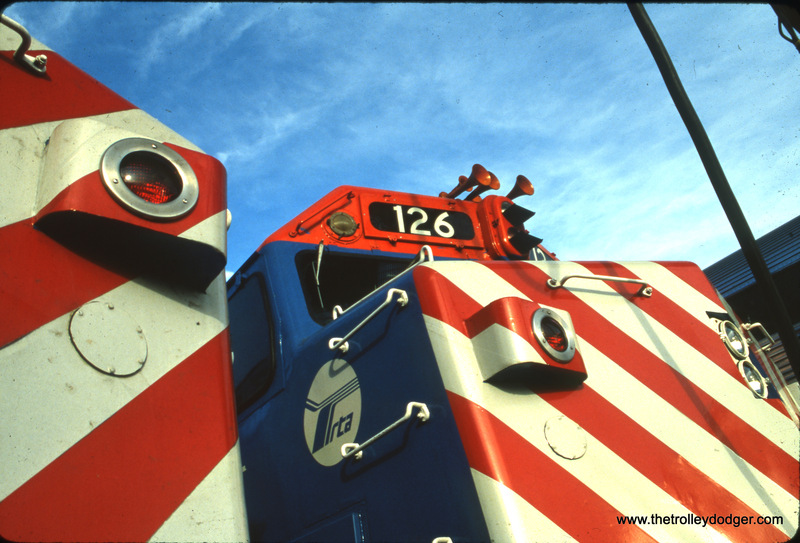 This is our 217th post, and we are gradually creating a body of work and an online resource for the benefit of all railfans, everywhere. To date, we have received over 428,000 page views, for which we are very grateful.